Like last year's, this roundup will feature a wide variety of cases from several different manufacturers. For each case, we'll start off with some pros and cons and finish with a verdict on whether or not it should be considered. Screen protectors and any other pertinent accessories will also be featured. 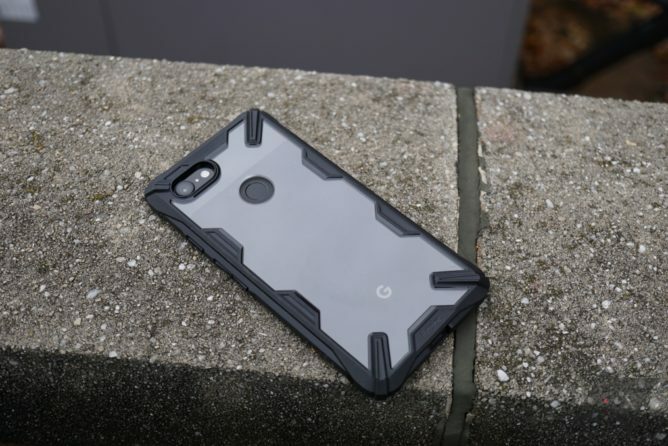 Search "Pixel 3 XL wallet case" on Amazon, and you'll find a few results, starting as low as $8 and going all the way up to $30 for one with leather. Bellroy, however, has priced its Leather Wallet Case for the Pixel 3 quite a bit higher at $89 (the 3 XL version is $99). This wallet case isn't horrible, but it's definitely not worth anywhere near what it's priced at. Build It's decent, and the materials appear to be of better quality than the standard Leather Case. Protection All four corners are covered well, the lip is decent, and the wallet flap will help protect your screen. Slots Bellroy claims you can fit four cards between the two slots, but it's an awfully tight squeeze. Price I'm not sure any case that doesn't use the highest-end of materials is deserving of a $100 price point, much less this one. Obviously, the main difference here is the addition of a wallet flap up front. 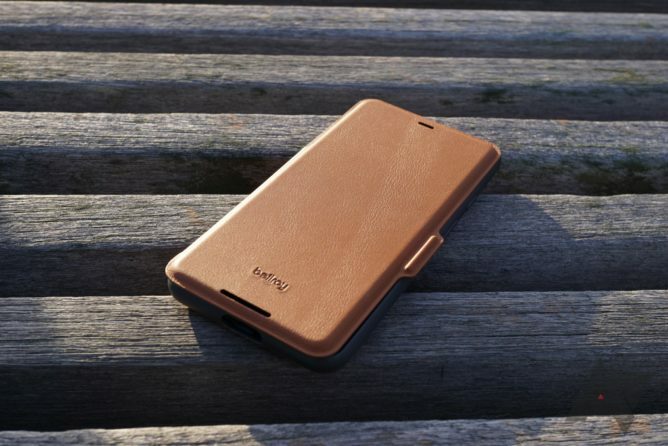 The flap itself is of decent quality, having two speaker cutouts and "bellroy" embossed near the bottom. It's held on by a magnet that sticks out of the right side, which also helps with opening it. 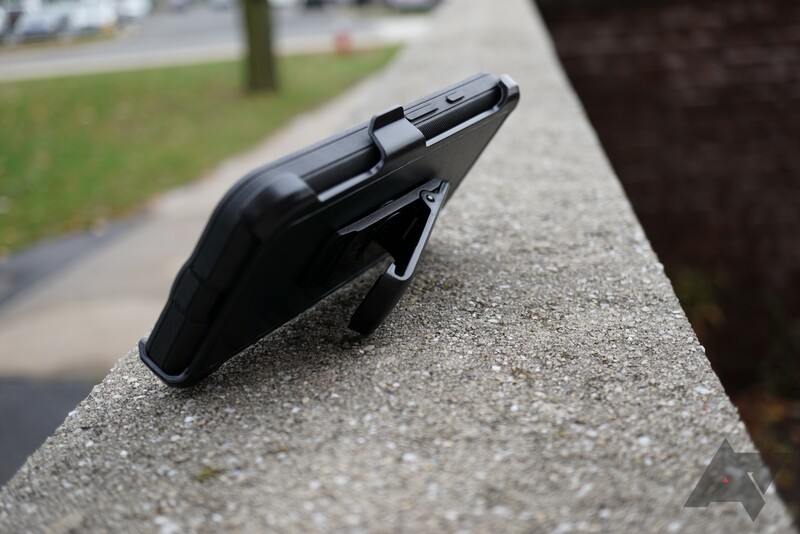 The flap can also act as a kickstand, which is pretty nice. I am disappointed, however, that the magnet doesn't wake/sleep the phone. Bellroy claims that the case can hold up to four cards, which I was dumbfounded by until realizing there's a second card slot behind the case's fold. That being said, four cards is still a very tight fit, especially in the slot behind the fold, which I really wouldn't recommend trying to fit two cards in. I'd say three is the max (two up front, one behind), and even that's kind of a squeeze. 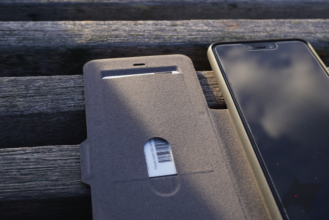 Oddly enough, there are slots for a nanoSIM and a SIM ejector tool behind the phone; Bellroy probably figured that it had better make use of the room above the card slot. I suppose it could come in handy if you're traveling. I was surprised to see that Bellroy used a higher grade of leather than it did with the Leather Case, but given the ~$50 price increase, it's not unexpected. The Leather Wallet Case's leather is a bit softer and the grain a bit finer, though they look nearly identical. The buttons are pretty mushy and don't have much feedback, and the recession for the fingerprint sensor is a bit deep, but protection is actually pretty good thanks to the beefy nature of the case and the flap up front that should help protect the screen in the event of a drop. 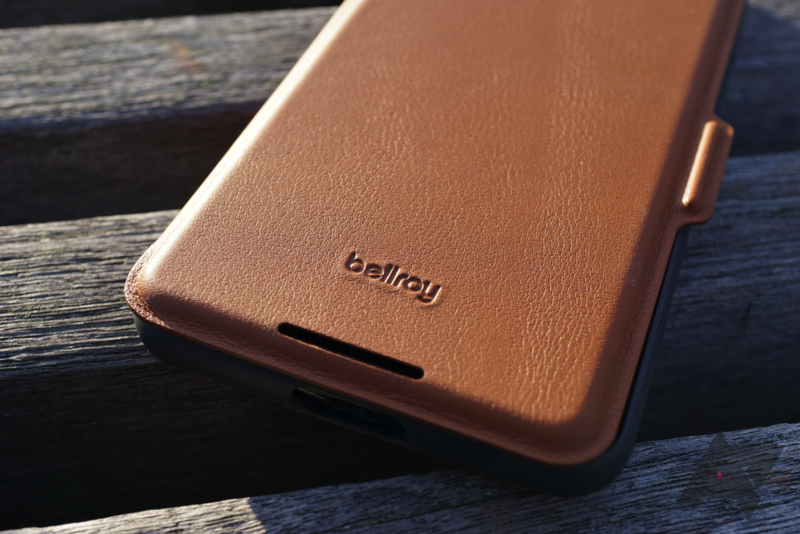 The Bellroy Leather Wallet Case is definitely not something I can recommend. It's protective and it can store a couple of cards (and a nanoSIM and a SIM ejector tool if you need to? ), but its buttons are mushy, the screen doesn't auto wake/sleep when the flap is opened/closed, and it can't really store as many cards as Bellroy says it can. Even if this thing were flawless, I wouldn't recommend it for its high price. I'd consider this case at around $50, but $89-99 is far too much. The Leather Wallet Case comes in Navy, Black, Caramel (pictured), Coral, and Graphite. 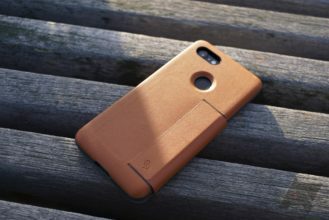 As a huge fan of leather cases on phones, particularly Apple's line for its iPhones, I was crestfallen to discover that the Bellroy leather case for the Pixel 2 and Pixel 2 XL was, in a word, crap. The shell felt cheaper than many of the $10 cases I had, the leather reminded me of cardboard, it had little protection, and it made the buttons unusable. The nearly $50 price tag was completely unjustified. 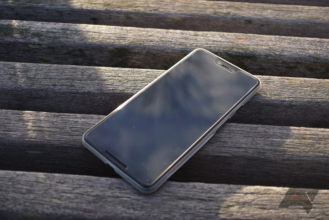 For the Pixel 3 / 3 XL, things have gotten a lot better, though they're still not perfect. Design It's a good-looking case in any of the six colors it's available in. Feel Because the case's frame is now soft-touch and the leather now wraps around to the sides, it's a lot nicer to hold. Protection It's a lot more confidence-inspiring, thanks to the lip becoming much larger and the bottom no longer being exposed. Leather While it feels better than last year's, it's still not very high-quality and is wrinkly around the edges. Buttons Anything would be better than last year's tiny cutouts, but these are pretty devoid of feedback. They also tend to get stuck. Price This case is not worth the nearly $50 it retails for. While the Bellroy Pixel 2 case was something I just wanted to throw out, the Pixel 3 version is something I'd be alright with using every day. The previous model's ill-fitting hard plastic has been traded for a softer flex polymer that actually feels decent in the hand. The bottom, which was previously completely exposed, has been covered up. 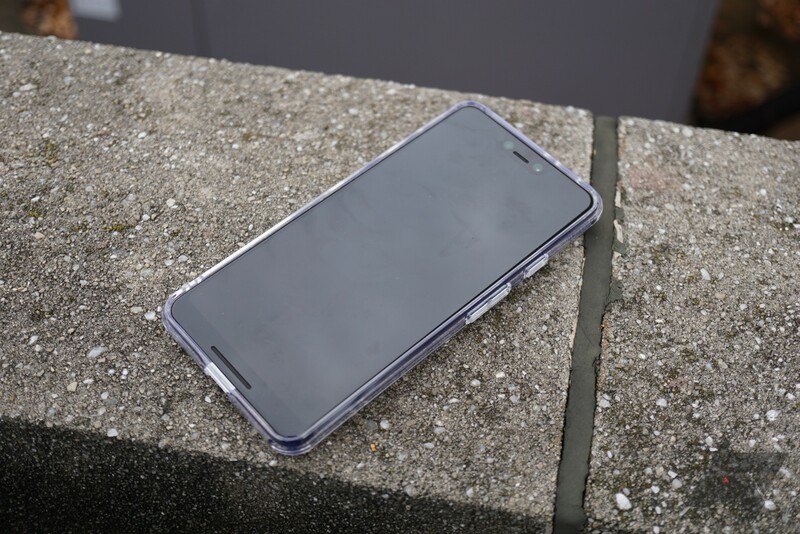 The lip around the front of the phone is much beefier, and clears a glass screen protector without issue. The leather now wraps around the edges much further. There are even real, usable buttons now. The case still has some issues, though. The leather is a bit softer than last year's, but it's still very thin and not as comfortable as the kind Apple uses. It's uneven and very poorly adhered on the edges, with wrinkles galore. I would be very surprised if the leather didn't start to peel after a few months of use. Additionally, while there are actual buttons this time around (thank God), they're some of the most numb ones I've ever used. They're perhaps a bit too easy to push down, and there's little tactile feedback to give you confirmation that the button has actually been depressed. 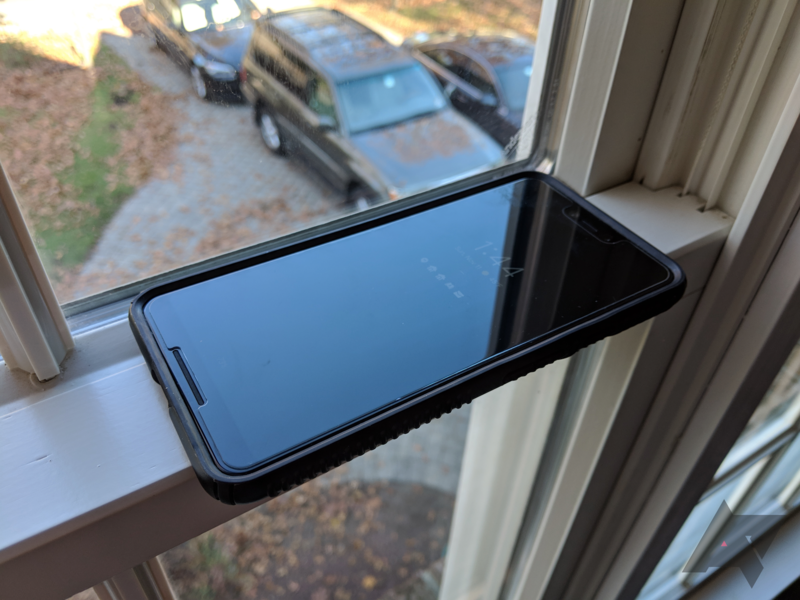 Additionally, when I put it on a friend's Pixel 3 XL, the power button somehow got held down and caused the phone to reboot. Yikes. I'm a big fan of how the Bellroy Pixel 3 case looks. However, the leather quality is just not up to snuff. I'm also concerned with the leather's long-term durability, given that it's wrinkled and very easily peeled out of the box. A lot of improvements have been made from its predecessor, but that's really not saying much. The case retails for $45 for the Pixel 3 and $49 for the Pixel 3 XL, and it's available in six colors: Navy, Black, Caramel, Graphite, Coral, and Not Pink (limited edition). Recommendation: Don't buy it; it's not a horrible case, but leather issues on a ~$50 case are kind of problematic. No, your eyes aren't deceiving you; this thing has pink glitter and tiny pink spheres inside. Turn your phone upside down and back right-side up, and you'll see the waterfall effect that the case's name alludes to. That's worth $40, right? Design The glitter is... unique? Might appeal to a select audience. 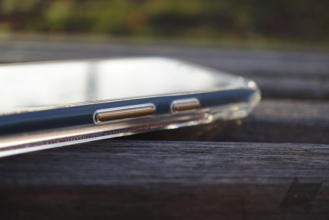 Buttons They're gold and very tactile — the same kind that old Spigen Neo Hybrid cases had. Protection The material is very thick, and the glitter window will probably burst before your phone breaks. Bulk The glitter window makes this thing pretty thick. Price $40 isn't prohibitively expensive given the special party trick, but it's not cheap. So let's talk about this glitter first. Case-Mate calls it a snow globe effect, which I suppose it is on a 2D level. There are actually several components inside, each with its own properties. For instance, the spheres roll up and down quickly and with ease, while the hexagonal glitter pieces just kind of slowly glide their way over. Here's a GIF to better explain what I mean. The glitter window makes the back quite thick, so it's good that Case-Mate included a larger cutout for the fingerprint sensor. It still works with wireless charging, though. The buttons are the hard plastic kind that genuinely click — think the older Spigen Neo Hybrid buttons. They're also gold for extra bling. The corners bulge out a bit for extra impact absorption, though they exhibit the same "water" effect that many clear TPU cases do. I wish that the lip were a little thicker, as it barely clears a screen protector. 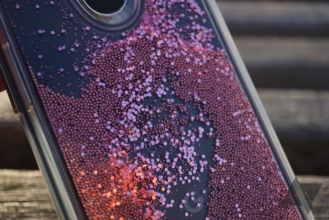 I can only really think of two types of people this is targeted toward: tweens (there probably aren't many with Pixel 3s) and parents with young children who would be entertained by the glitter (although you probably don't want your toddler shaking your $800 phone around). Whoever you are, if you find the 2D pink snow globe thing interesting, this is a pretty entertaining way to burn $40. 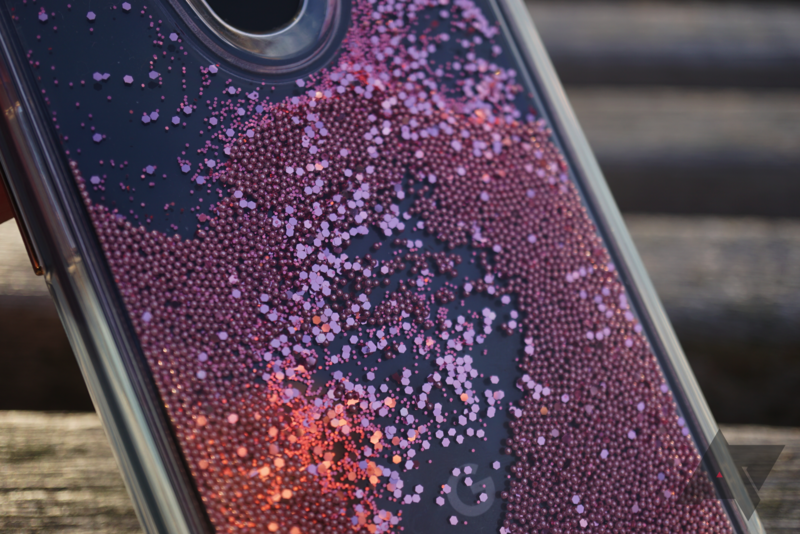 Recommendation: Buy it if you like glittery pink stuff moving around on the back of your phone. 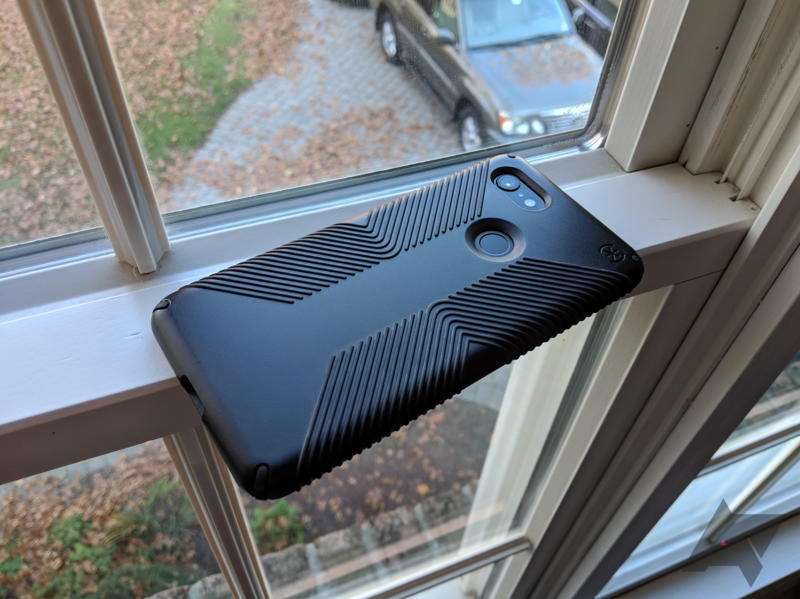 Fabric cases were introduced by Google alongside the Pixel 2 and 2 XL, and mine stayed on my Pixel 2 XL longer than any other case did. 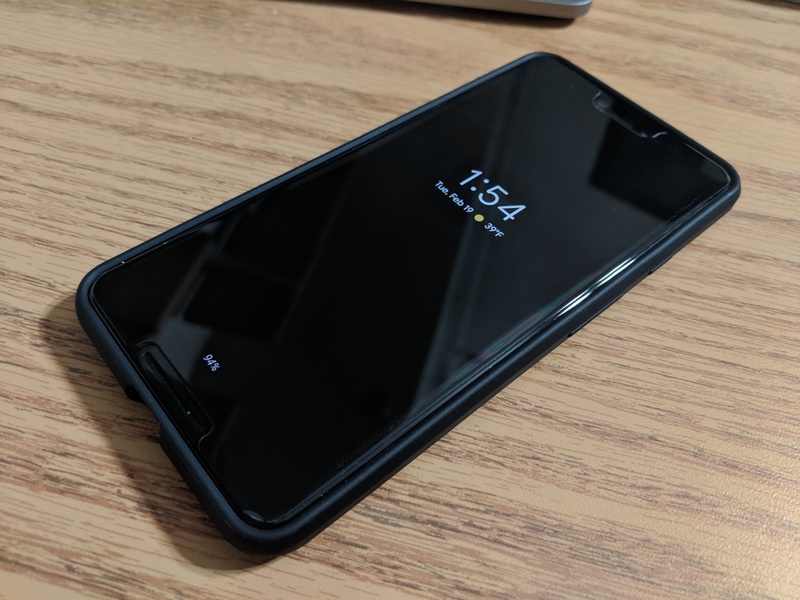 I'm pleased to say that the Pixel 3 version is just as good, retaining all of the good qualities of the previous model while slimming down and gaining a bit more protection. 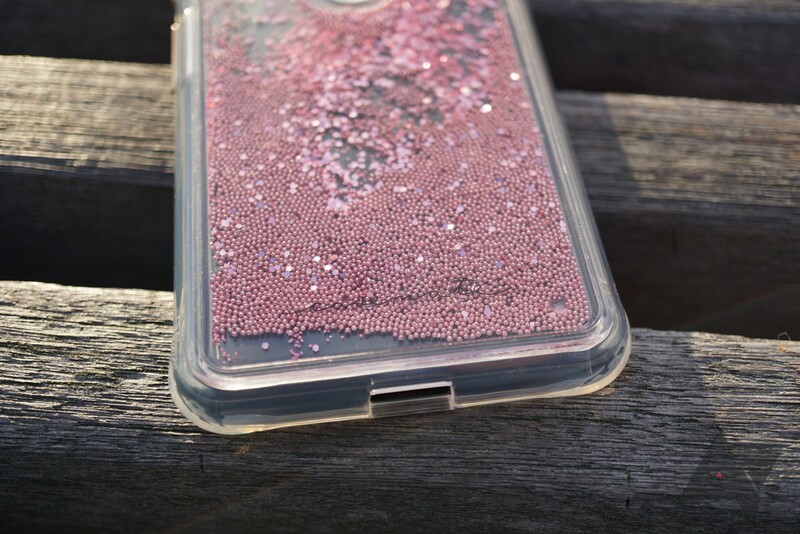 Design It's one of the most eye-catching cases out there; there's nothing else like it. 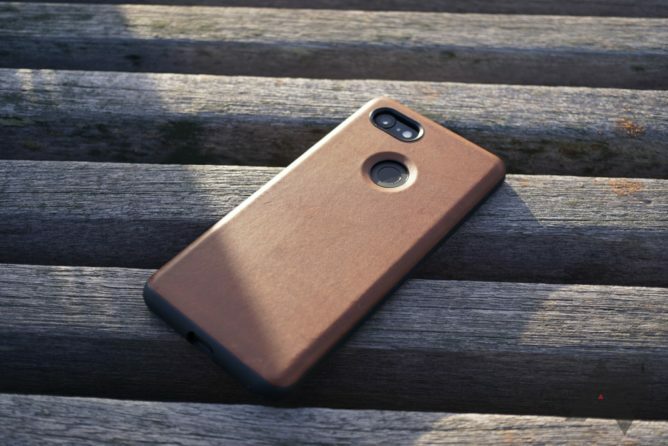 Feel The fabric's texture is a pleasant departure from every other case's plastic. Buttons So tactile, and the power button gets a splash of color on some versions. Maintenance It won't play nicely with harsher conditions, and it should be washed from time to time. Price At $40, this isn't exactly the most cost-effective option out there. 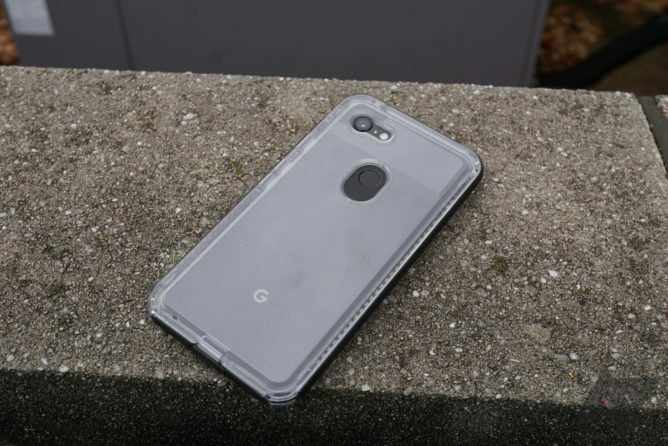 The Pixel 3 fabric case uses the same nylon-polyester fabric that the previous one did, providing the same great feel in the hand and interesting design. The buttons are as clicky as ever, and some color options even have a colored power button. The case has slimmed down a bit from last year's, but it feels just as solid. In fact, it might even be more protective, thanks to the much smaller area on the bottom left open. Unfortunately, the lip won't clear a screen protector, but last year's thicker one didn't either. This case won't be perfect for everyone, though. If you live in an area where it rains a lot, this won't be the best choice since you can't just wipe the water off. The same goes for those who work in harsher conditions. Even for those who live in sunny areas and don't get their hands dirty, the case should be hand-washed and hung to dry every so often for hygienic purposes. 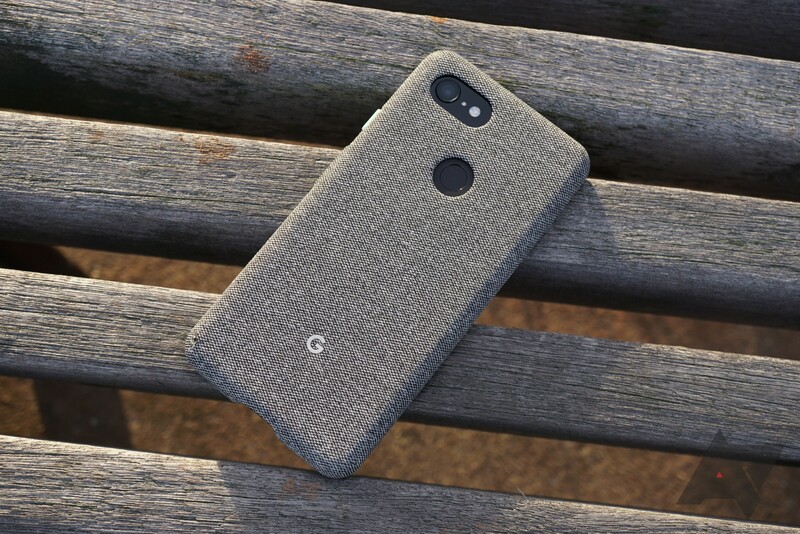 Just as it did with my Pixel 2 XL, this fabric case is probably going to stay on my Pixel 3 XL whenever I'm not trying something new. So long as you keep your hands clean and you can pony up the $40 for the case — which, let's be honest, you obviously can if you bought an $800-900 phone — this is one of the most unique cases on the market. It comes in four colors: Carbon (black), Indigo (dark blue), Fog (black/white with mint power button), and Pink Moon (salmon with orange power button). Recommendation: Buy it if your hands don't get dirty often. 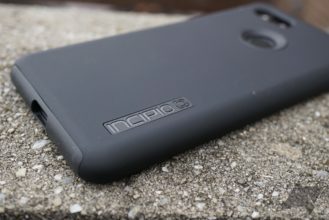 Incipio is one of the older case companies out there, and it's used the same formula for its DualPro line for years: a soft inner layer, a soft-touch hard outer shell, and an Incipio logo on the bottom right. Nothing's really changed with the DualPro for the Pixel 3 and 3 XL; it's still a reliable workhorse of a case. Design It's smooth and inoffensive; nothing special, but it's well put-together. Protection All four corners are protected, and there's a sizable lip over the screen. Materials The soft-touch back, shockingly, does a decent job of resisting fingerprints. Price $30 is a bit steep compared to the competition. 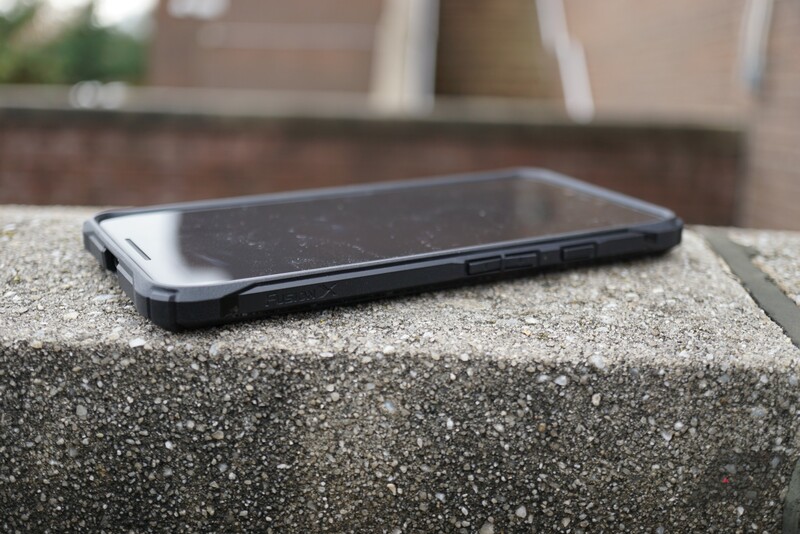 The DualPro is a good, solid case for people who want protection without the "rugged" look. 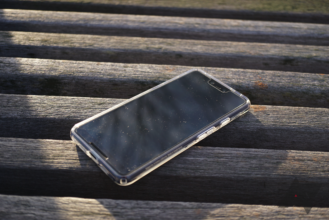 The two layers put the case on the thicker side, but they come in handy when your phone inevitably takes a tumble. The buttons are alright - not the clickiest out there, but by no means difficult to push. 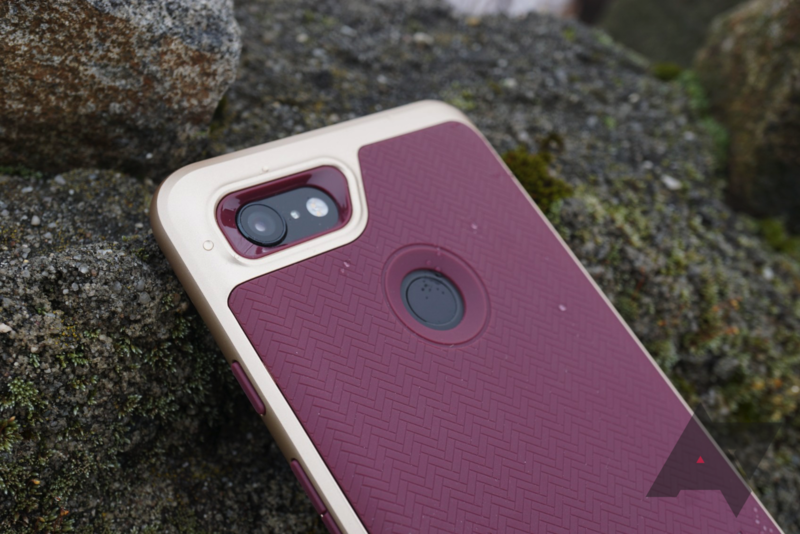 There's a bit of a bevel around the fingerprint sensor to ensure that the sensor is still usable even with the thicker nature of the case. The back is hard plastic with a soft-touch feel, and shockingly, it does pretty well resisting fingerprints. 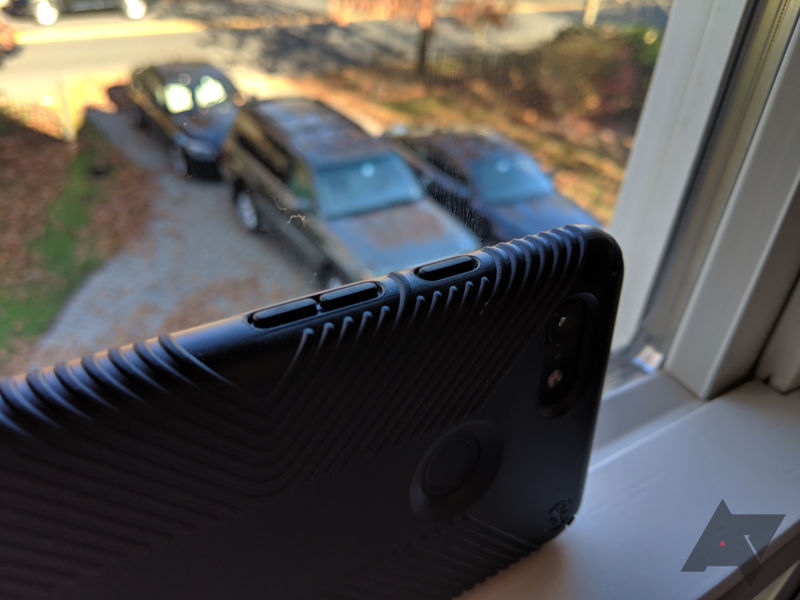 I'm not sure if Incipio changed something, but it definitely seems more resistant to smudges and the like than the Pixel 2 XL DualPro case I had. The only complaint I can realistically think of is the price; at $30, it's more expensive than a comparable Spigen or Tudia dual-layer case, but the clean lines and general lack of any issues might make it worth it to some. To me, the DualPro is a boring, but safe choice for the average consumer. It looks nice enough, even if it doesn't use any special materials. It doesn't have attributes that really stand out, but it doesn't really have any flaws either. At $29.99, it's a bit more money than the competition, but I'm sure many will be willing to pony those few extra dollars up for a solid product. Recommendation: Buy it if you want a good-looking, protective, no-frills case. 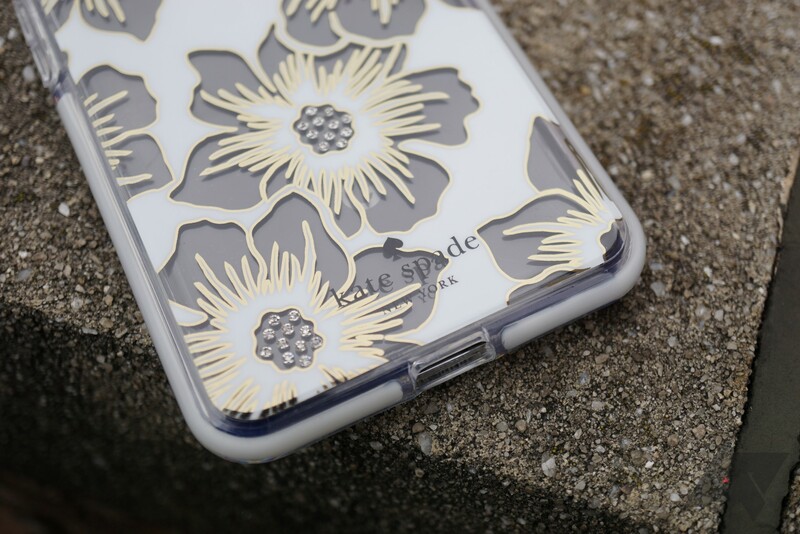 Designer cases are usually only made for iPhones and maybe some Samsung Galaxy phones, but Kate Spade New York (or, more accurately, Kate Spade under Incipio) has been producing them for Pixels ever since the first one. 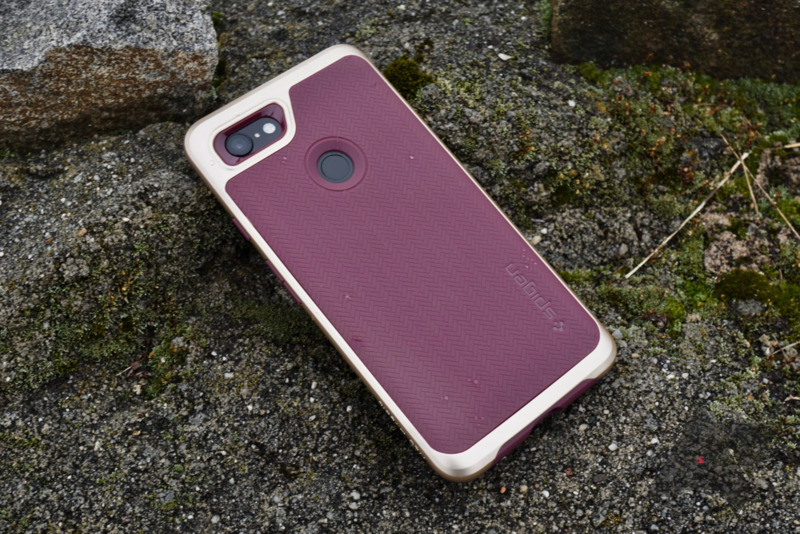 This year's Defensive Hardshell Case is ideal for someone who really wants the Kate Spade brand and an above-average amount of protection, but that's probably a pretty small market. Design It's... unique. At least it doesn't look the exact same as a $20 case. Protection This thing has thick padding all around the case. Design (again) The sequins on the back prevent the case from being able to grip whatever surface you lay it on properly. Price $49.99 for a fancy label isn't out of the ordinary, but it's still an exorbitant amount. Protection (again) Because of how thick the padding is, it makes the phone much wider and more difficult to hold onto. The "Defensive Hardshell - Reverse Hollyhock Floral Clear/Cream with Stones" lives up to its name (well, at least the first part). Surrounding all four sides of the phone is a thick layer of TPU, which has a white-colored insert that presumably helps with shock absorption. The lip is an average size. 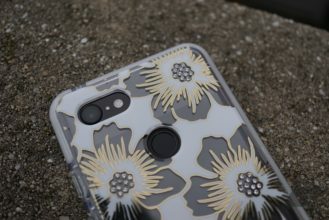 The back features a unique flower pattern laid over a hard clear back. The flower pistils are represented by shiny silver sequins that protrude from the case. This isn't exactly my style, but I can see how some might find the design appealing. However, there are several faults. The padding on the sides makes the phone much bigger in the hand, and if you're putting this case on something as big as a Pixel 3 XL, you might find it hard to hold. 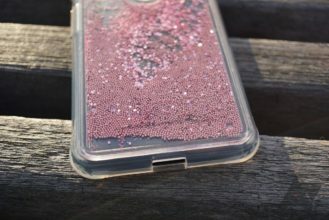 Additionally, the sequins prevent the case from being able to sit properly, and they could even scratch whatever surface it's resting on if you're not careful. I also felt that the fingerprint sensor cutout was a bit small given the thickness of the hardshell, and the edges of the cutout felt a bit sharp to the touch. The buttons aren't horrible, but they're a bit hard to press. If you're looking into this case, chances are you already have your heart set on it. But bear in mind that the phone could get a lot more difficult to hold, and that the sequins on the back could scratch things up. For $50, there are a lot of other options out there you should consider. Recommendation: Don't buy it unless you really want "kate spade NEW YORK" on the back of your phone. 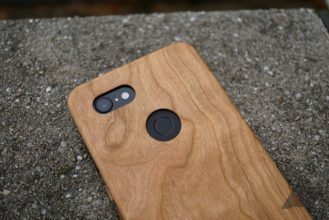 The concept of a wood case isn't new; there have been plenty of cases for plenty of phones in which a panel of wood is applied to the back of an otherwise pretty standard case. KerfCase, however, carves each of its wood cases out of a single block of wood. 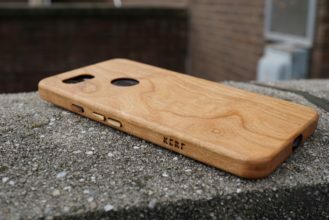 I'm not knocking on other companies' approaches to wood cases — I'm a big fan of what Moment does with theirs, for example — but there's no doubt that KerfCase's completely-wood cases are much more special. You will have to pay to play, though. Materials The wood's look, feel, and smell can't be matched by any other case. 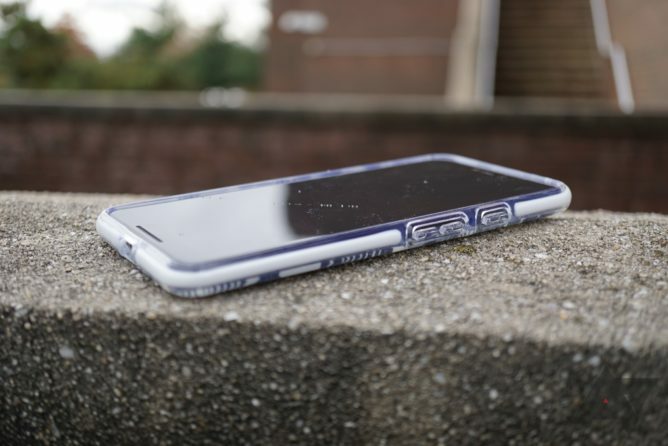 Warranty If the case breaks, KerfCase will replace it free of charge, regardless of whether it's your fault or the case's. 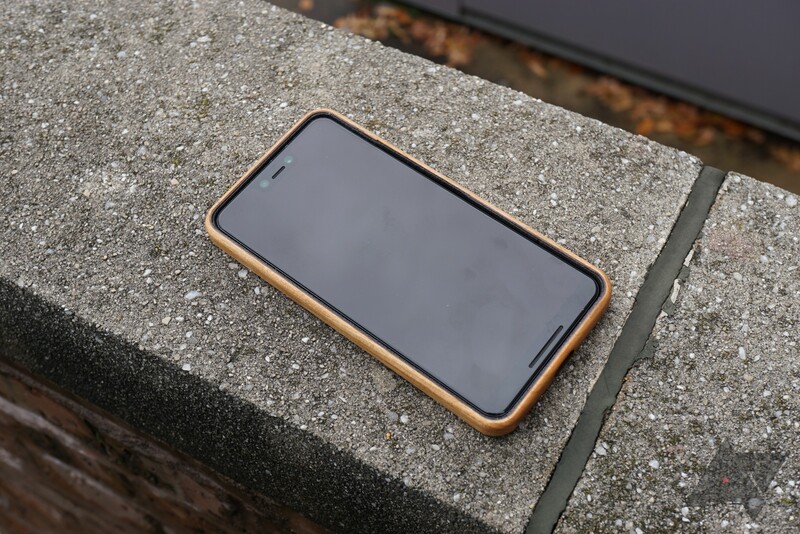 Size Due to the nature of the wood construction, the phone becomes much wider and more difficult to hold. Price These cases start at $69, but can be optioned all the way up to an eye-watering $439. The case's design is pretty minimalistic, with the only thing really of note being "KERF" embossed into the right side. 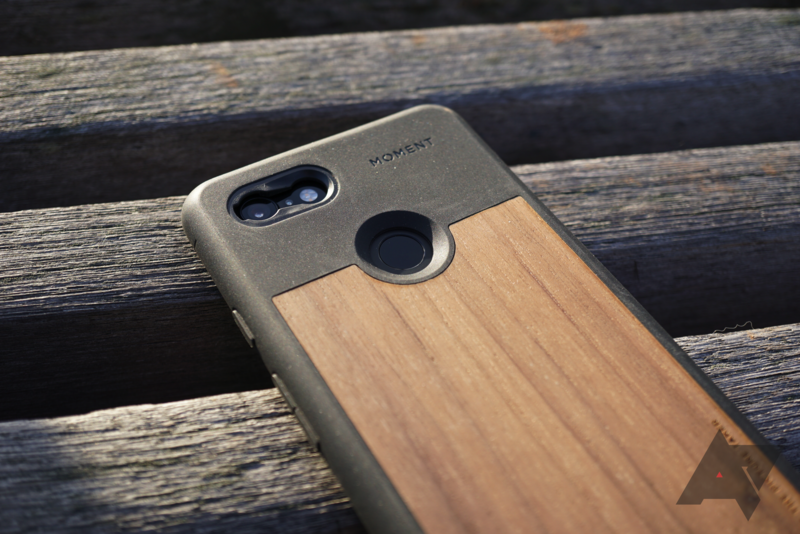 Otherwise, KerfCase leaves the design part up to woodgrain, which will obviously be different for every single case. 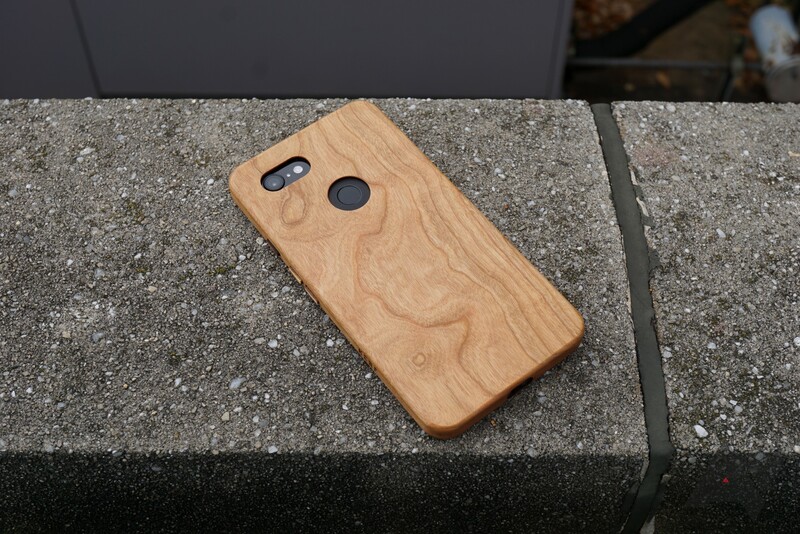 The Pixel 3 XL case I was sent is made of reclaimed Pittsburgh cherry, and the Pixel 3's walnut is from a grove of trees in PA. 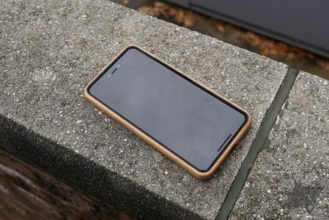 Since wood doesn't really like to flex, the company engineered a "patented friction formula" that uses strips of suede to keep the phone tucked in. It works surprisingly well; I've never felt that my phone would fall out, and installation/removal is straightforward. 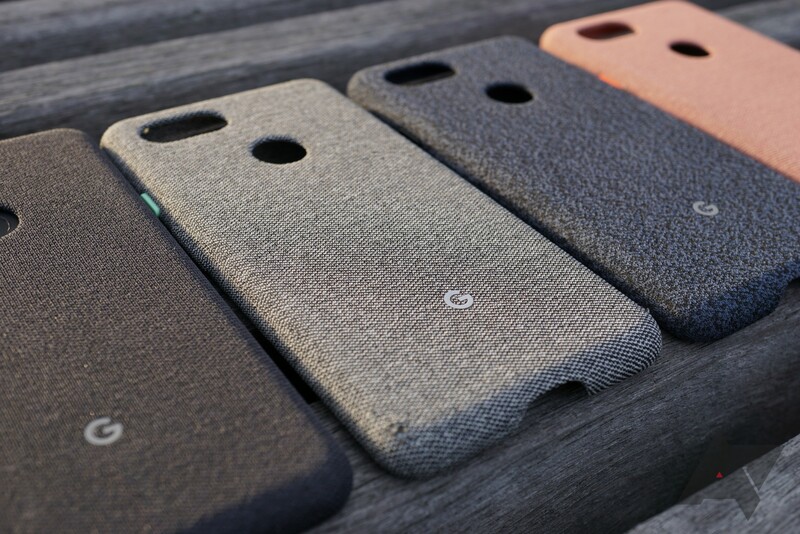 I also like that the suede strips are now uniform all around the case; the gaps in last year's Pixel 2 cases up front weren't very sightly. Because the entire case is made of wood, it has to be quite large. It noticeably increases the width (and height) of the phone, making it more difficult to use one-handed. This isn't a huge issue on the Pixel 3, but Pixel 3 XL owners whose hands aren't massive should take note. You'd think that the buttons on a wood case might have some issues, but they're surprisingly clicky. 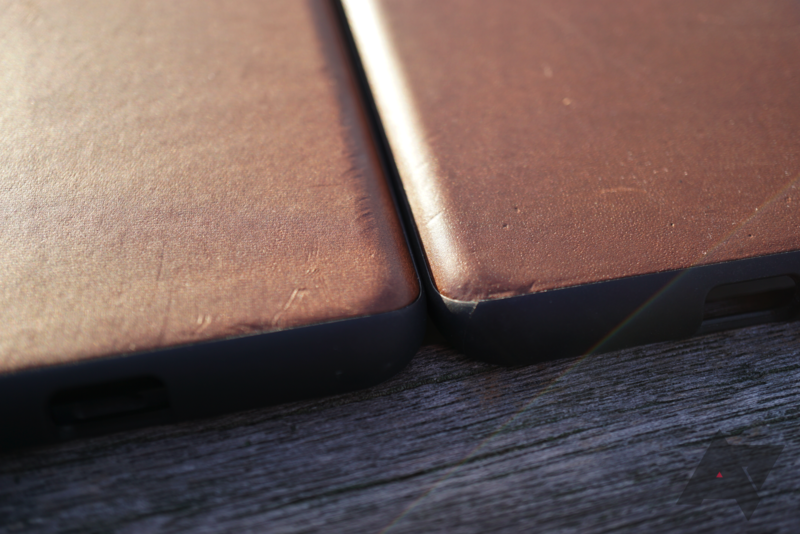 Because each case is hand-sanded and hand-finished, things aren't perfect; for instance, my 3 XL case has a small rough patch on the back and the corners' radiuses aren't all the same, the minor issues make the case feel more handmade. 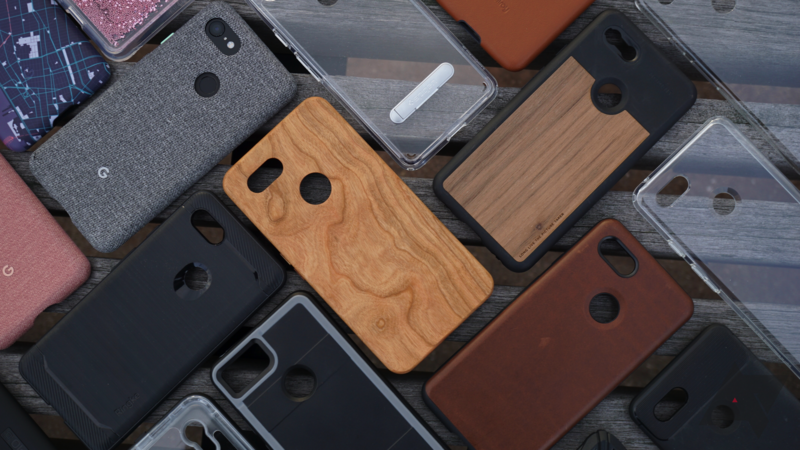 KerfCase offers 19 wood options; however, not all are created equal. My cherry Pixel 3 XL case and walnut Pixel 3 case cost $89 and $69, respectively, but exotic woods like Eucalyptus Burl and Amboyna Burl can make the price skyrocket to north of $400 (!) per case. 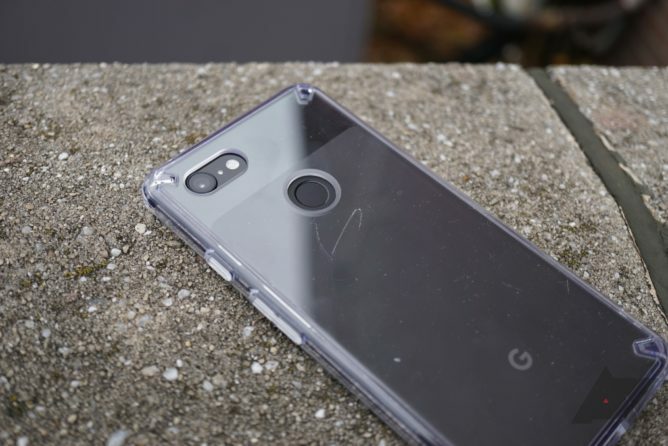 Pixel 3 XL cases cost $10 more, custom text is an extra $10, and custom images are an extra $20. 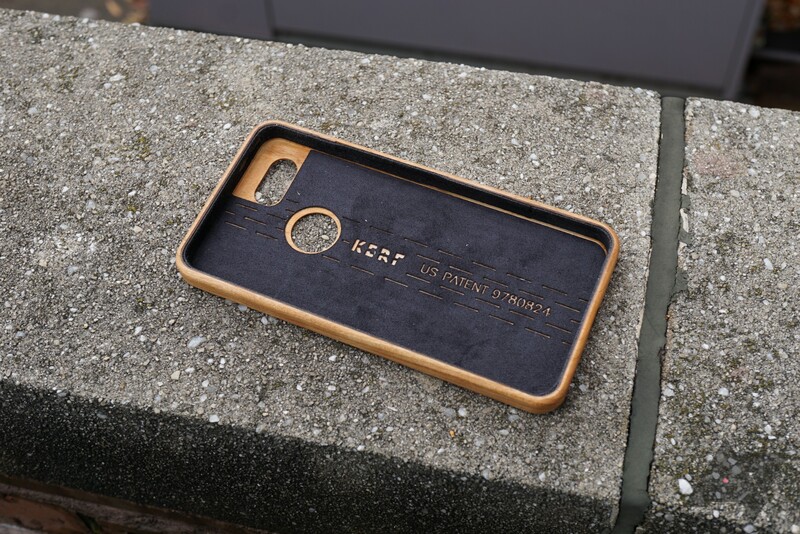 At least you get a lifetime warranty; if the wood cracks, whether it be your fault or the inherent nature of the wood itself, KerfCase will repair/replace it for free. 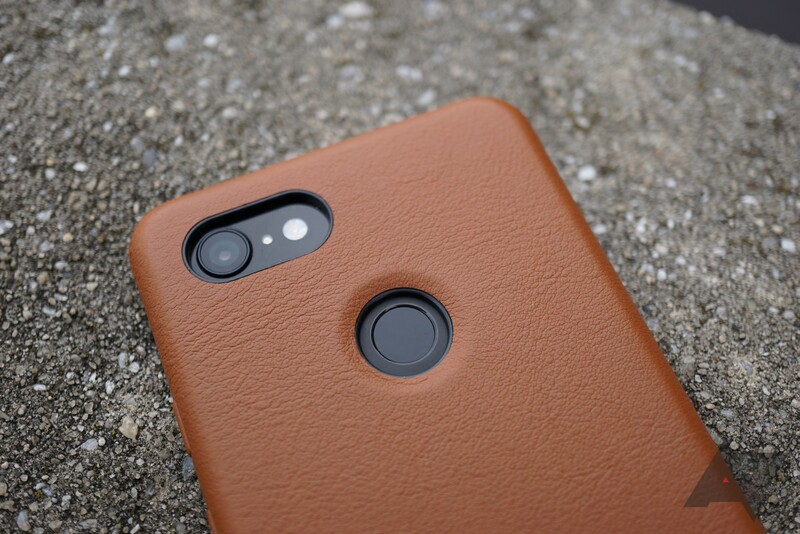 These cases are definitely luxury items first and foremost, but if you have the cash to spare, they'll definitely make your phone stand out. Recommendation: Buy it if you can afford it. 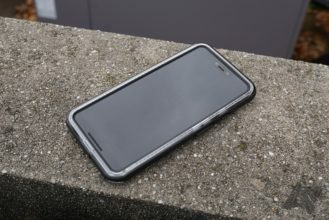 OtterBox's sister company, LifeProof, used to be known for producing waterproof cases for iPhones, back when they didn't have the water resistance that they do today. But since the iPhone 7's release, the company has been forgotten by most. Last year, we checked out the Pixel 2's LifeProof FRE, which we recommended due to the company's waterproof claim. 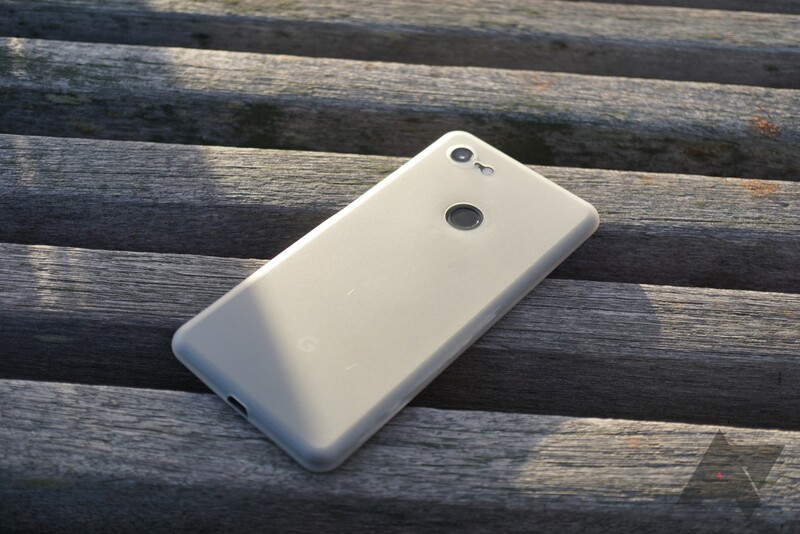 The Pixel 3's NEXT, however, doesn't carry that same boast, making it an expensive option with no real distinguishing feature. Protection The two-piece nature and thick sides keep your phone safe. Buttons They're very clicky, which I wasn't expecting. Design The soft-touch strip running around the exterior looks nice and makes the phone feel more secure in the hand. 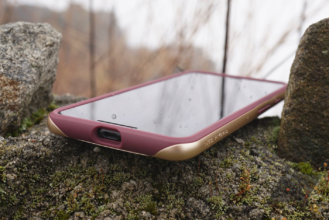 Certification LifeProof says it's dirtproof and dustproof, which some may find helpful. Size While the phone doesn't get much thicker with the case on, it does become a lot wider. Price $80 for a case that doesn't bring much to the table is absurd. 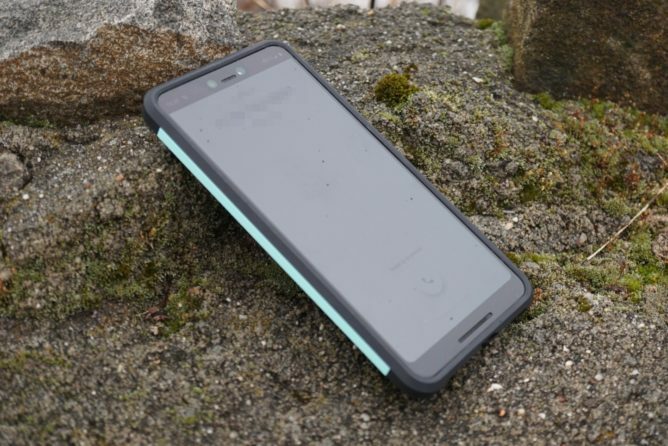 LifeProof's FRE line traditionally indicates waterproofing, not just water resistance. That means there are built-in screen protectors, plastic over fingerprint sensors, and so on. 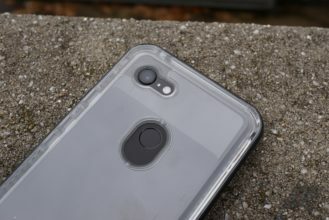 For the Pixel 3, however, LifeProof only offers a non-waterproof NEXT case. This case has no screen protector and no fingerprint sensor plastic, though it does still have a charging port cover (which, while somewhat annoying, isn't horrible to use) for dirt-proofing, dust-proofing, and snow-proofing. Let's be honest - that last one shouldn't even count, but the protection against dirt and dust could come in handy for people who work in harsher environments. It's also worth noting that the case does work with glass screen protectors, though the margins are very close. As a case, the NEXT is... alright. It does feel pretty premium and grippy in the hand thanks to the soft-touch strip that runs around the perimeter. The buttons are extremely tactile, which I was pleasantly surprised by. There's also a long recess for the fingerprint sensor, which does help on this case given the thicker back. The clear back seems fairly fingerprint-resistant - a rarity in these parts. 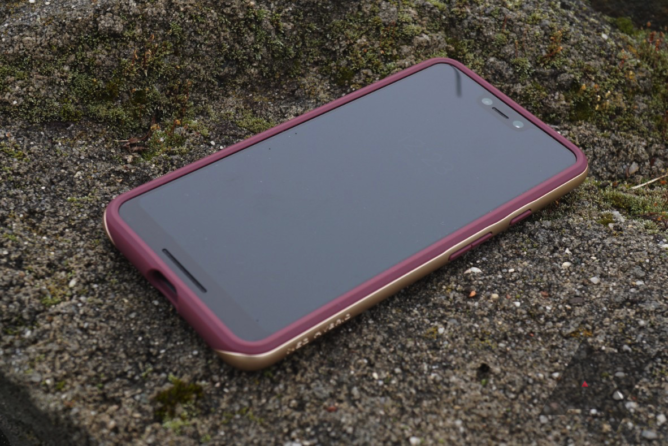 My only legitimate gripes, price aside, are with how much wider the case makes the phone, as well as a tool being necessary to take the case off the phone. You'd probably be able to substitute a quarter for the tool, though. All in all, the NEXT is a good case. It's well-designed, it has nice buttons, it feels nice to hold, and the clear back doesn't get all nasty after a few minutes. However, its $79.99 price tag makes it the most expensive case on this list by a wide margin. Yes, the case is dust-proof and dirt-proof, but the most important certification, waterproofing, isn't present. 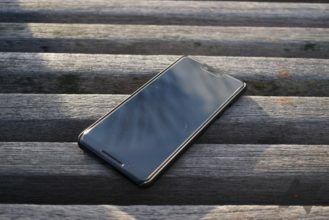 Plus, the sheer width makes the phone difficult to hold, especially if we're talking Pixel 3 XL. I could see the NEXT appealing to a very small audience, but this isn't a case most of you should go for. It's available in Black Crystal (black surround) and Cactus Rose (pink surround). Recommendation: Don't buy it unless you've got some cash to spare. 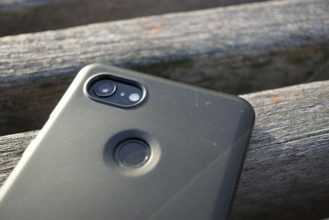 Last year, Moment's Photo Case for the Pixel 2 XL was one of my favorites, and it spent a lot of time on my phone. My only legitimate complaints were in regard to the buttons and the bottom being exposed, but Moment has addressed both of those issues in the Pixel 3 version. The case is nearly perfect now. Design It's a good-looking case, and Moment's camera lenses work as intended with it. Materials You can have your choice of wood, leather, or canvas. Protection Even the bottom is covered up now! Buttons They're much more pronounced and more tactile than before. Protection (again) The top corners of the case don't seem to hug the phone very well. I'm very impressed with the Photo Case overall. The wood insert on the back (which can also be either canvas or leather) is tastefully integrated and acts as a nice piece of flair. 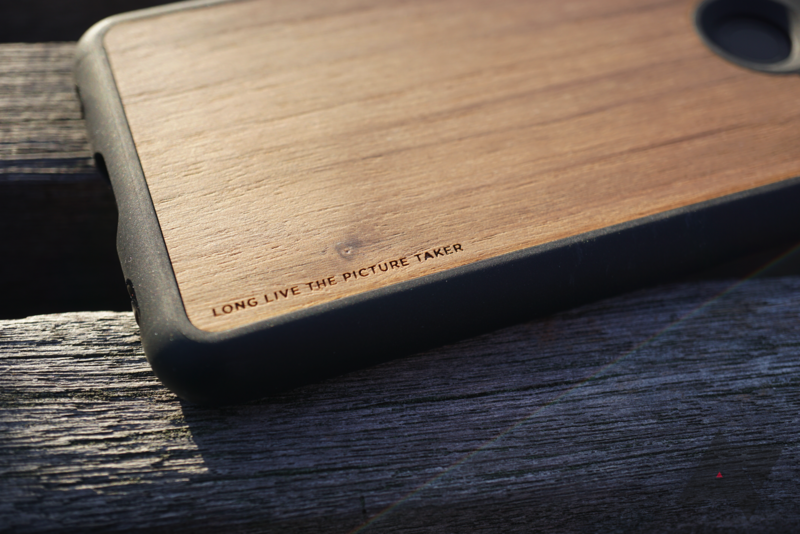 If you opt for the wood, you also get a neat "Long live the picture taker" engraving. 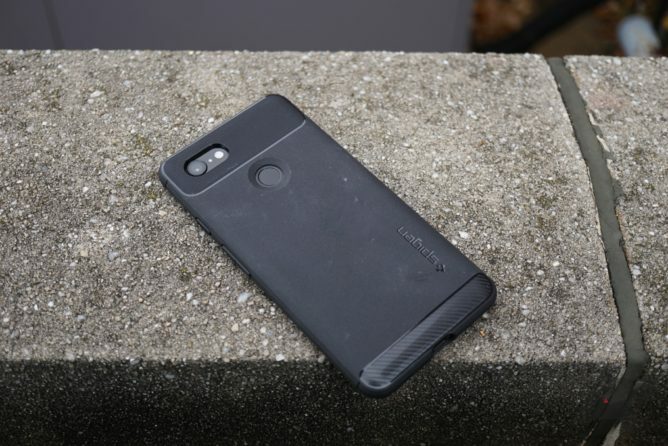 The rubberized material is grippy and comfortable, and this time around, it wraps around the entire phone. The lip is large enough to clear the screen protector, too. Moment has also vastly improved the buttons; they were difficult to distinguish from the rest of the case before, but they're now very pronounced and more tactile. Of course, it also mounts Moment camera lenses with ease. There's also two areas on the bottom meant for lanyards, which some may find useful for a photography-oriented case. My only fault with the case is how easily its top corners can free themselves from the phone. 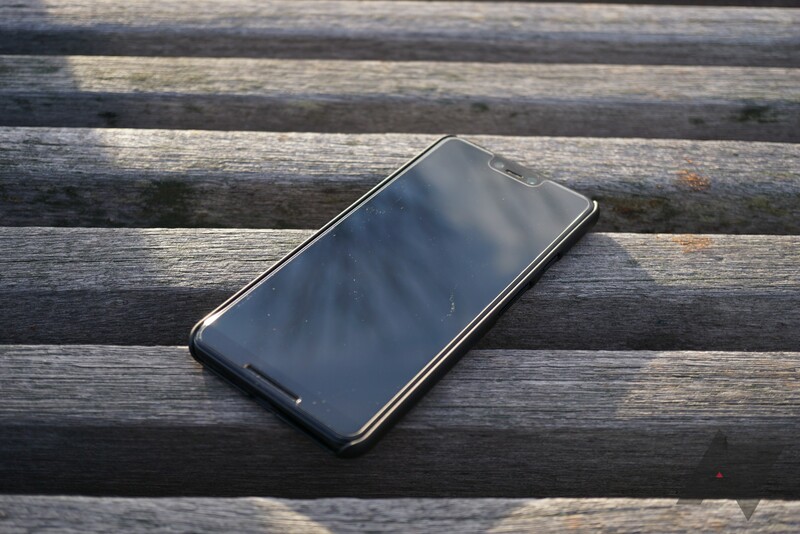 In the event that your phone drops face down onto the floor with the top of the phone making impact first, this could potentially cause a cracked/scuffed screen. I checked the other cases I had on hand, and none had this same issue. Granted, this isn't too likely a scenario, but it's worth noting if you do drop your phone a lot. Given that Moment fixed both of the issues I had with the Pixel 2 Photo Case (buttons and bottom protection), I'm very happy with it. 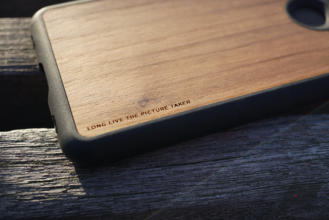 The Photo Case comes in black/black canvas, black/wood, and white/tan leather options, and it costs $29.99. That's more than you'll pay for most cases, but it's well-worth the money. Recommendation: Buy it; it's nearly flawless. It almost seems wrong to call MNML cases "cases," as they're so thin that they seem more like skins. 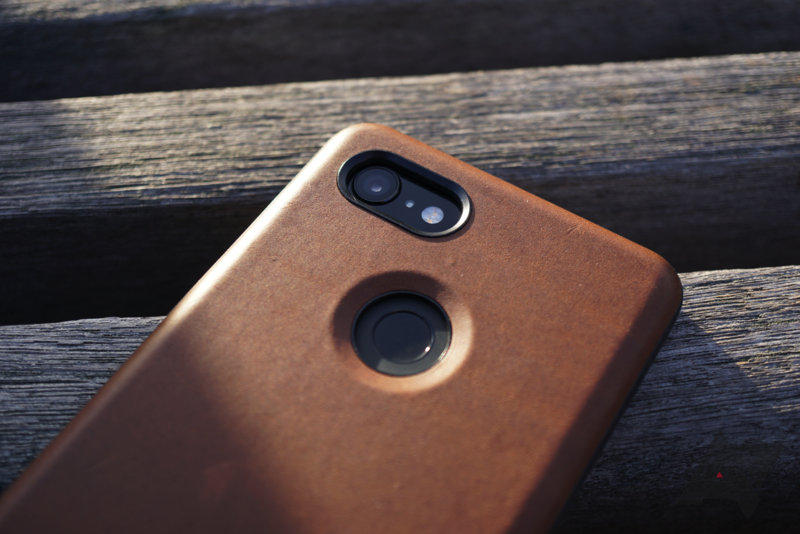 But if you're not worried about dropping your phone and want a bit more protection than a skin, an MNML case is a good way to go. Design It's so, so thin. 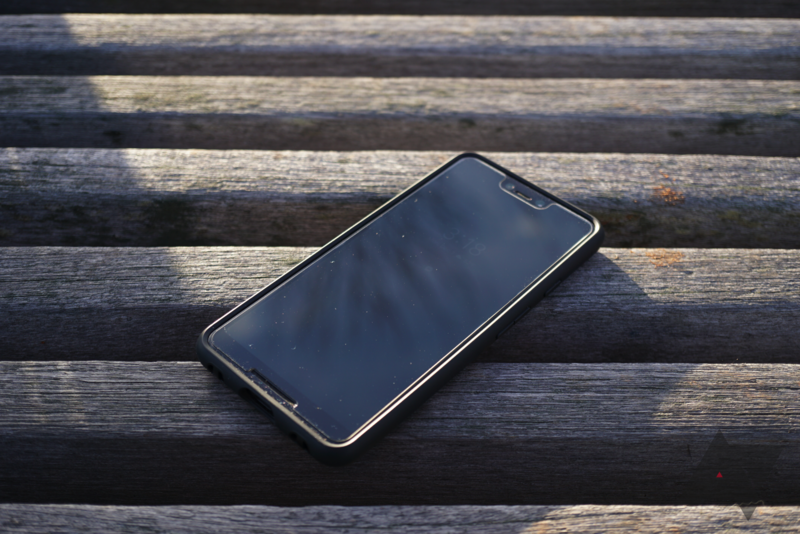 If you passed the phone to someone else, they probably wouldn't even notice the MNML on it. Thinness Did I mention how thin it is? Fragility The material is very easily creased, so be careful with it when it's not on the phone. Protection You're probably SOL if your phone hits a concrete floor with this on. 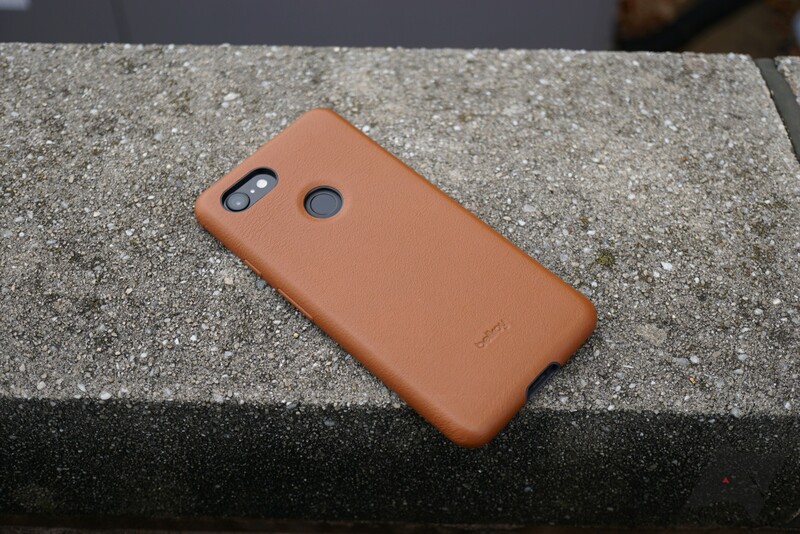 The case comes in five colors, and all of them have a matte or frosted look to them. The material has a slight texture to it that feels decent in the hand. It's pretty hard to install and remove; you really have to force all four corners on. However, you have to be careful not to bend anything, as creases are pretty easy to form. There isn't any lip protecting your screen, which isn't really a surprise. There is, however, a bump around the camera. Also worth noting is that the buttons are just cutouts, but that's a given with a case this thin. If you're careful with your phones and just want something minimal to keep scratches at bay, the MNML is a decent buy at $14.99. This is probably the cheapest kind of case to produce, but you have to pay up for the look. It comes in Frosted Black, Frosted White (pictured), Matte Black, Really Blue, and Red. Recommendation: Buy it if you've never dropped your phone before. 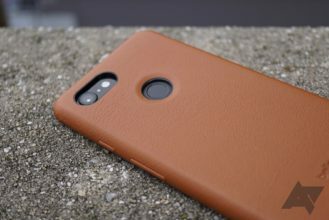 An oddly high amount of people requested that we check out Nomad's leather case after my disappointment with Bellroy's offering, so here we are. I've been using the Nomad Rugged Case for the past week or so, and I'm pleased to say that there's finally a good leather case for the Pixel line. Design The manner in which the leather and polycarbonate frame meet is unique. Leather The soft Horween leather is much nicer than what Bellroy uses. Protection All four corners and the screen are adequately guarded. Leather (again) It's so soft that it gets damaged quite easily, and you may still encounter some adhesion issues on the edges. The soft, vegetable-tanned Horween leather that Nomad uses is a big step up from Bellroy's. According to our resident leather expert, Ryne, the corrected grain of the Nomad case is much finer, more uniform, and less textured than the Bellroy's. It feels very high-quality. I've been using it for around a week, and as you can see from the photos, it's already developed a noticeable patina when compared to another Nomad case I have on hand. Given the nature of the leather, it also gets scratched and indented quite easily, which you may or may not like. I've also been told that this grade of leather shouldn't be exposed to too much water, as it could wrinkle or shrink. The rest of the case is pretty nice, too. 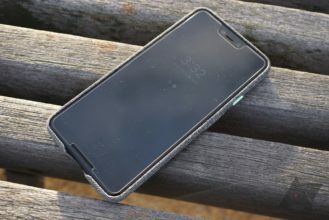 Nomad has cleverly designed it so that the polycarbonate frame will hit the floor first in the event of a fall, protecting the more delicate leather. On that note, all four corners are completely protected, and the lip up front is thick enough to clear a screen protector. The cutouts are good, and they're outlined in a nice gloss black finish. It's slightly raised over the camera, too. The buttons aren't the absolute best I've ever used, but they're decently tactile and I have no real complaints about them. Overall, this is a very nice case. My only real concern is that the leather is a bit delicate and could still potentially peel up on the edges, but I'm significantly less worried about that than I was with the Bellroy case. The brown Horween leather is the only material option. Recommendation: Buy it; it's not cheap, but it's worth it. 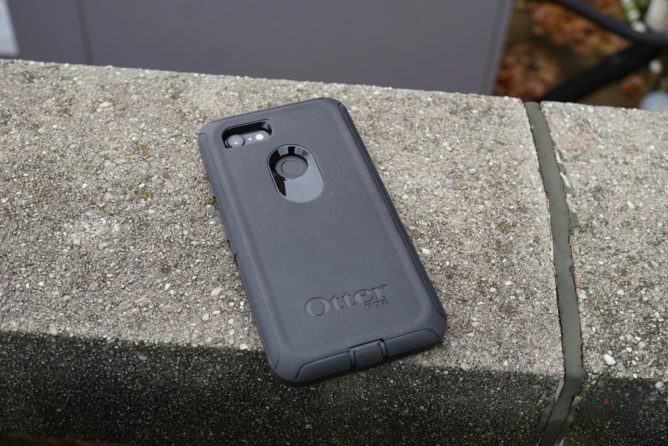 For years, everyone's go-to rugged case was OtterBox's super chunky Defender. I haven't been seeing as many as of late, but I don't doubt that there are still people out there who swear by them. 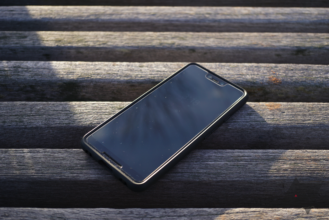 However, even people on the hunt for the maximum possible protection for their phone might want to stay away from this one. Protection You'd be hard-pressed to find another case that is this beefy. Holster One's included, and it doubles as a kickstand. Size The case makes the phone so much thicker and wider that it becomes difficult to hold. Screen protectors They won't work with this case. Wireless charging It won't work due to the sheer thickness. Removal Putting this thing on and taking it off is quite the chore; the charging port cover is difficult to open as well. 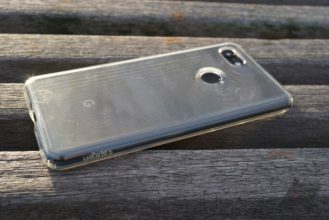 Price $50 for the Pixel 3 version and $60 for the 3 XL model is a bit much. 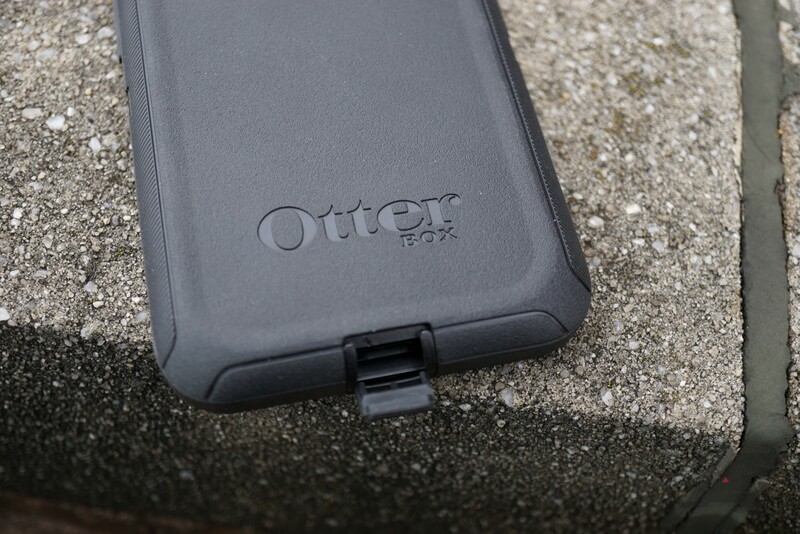 OtterBox Defenders are generally purchased by people who need all the protection they can get. It's made up of a two-piece hard plastic inner layer, as well as a rubber-feeling outer layer. Unfortunately, OtterBox didn't think the design the whole way through; the case is designed in a way that makes using a screen protector basically impossible. 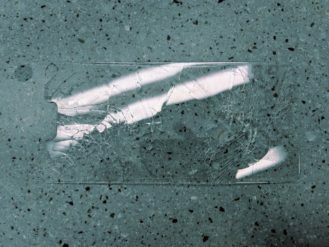 A plastic screen protector will probably start peeling, and you can forget about even trying to use a glass one. 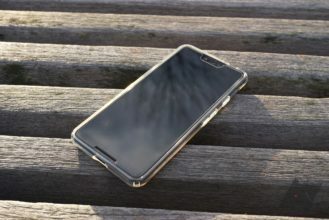 OtterBox doesn't offer a version with a built-in screen protector, but those were generally crap anyway. 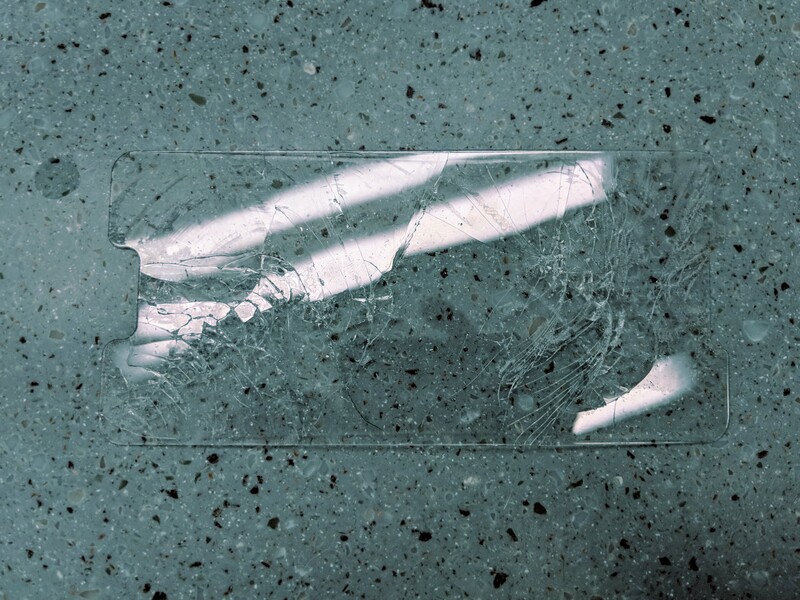 When you realize you can't use your new glass screen protector with this and go to take the case off, you'll be met with more difficulty; the soft outer layer is easy enough to take off, but the clips on the plastic inner portion are definitely not. Good luck with those if you don't have long fingernails. In daily use, things don't get much better. 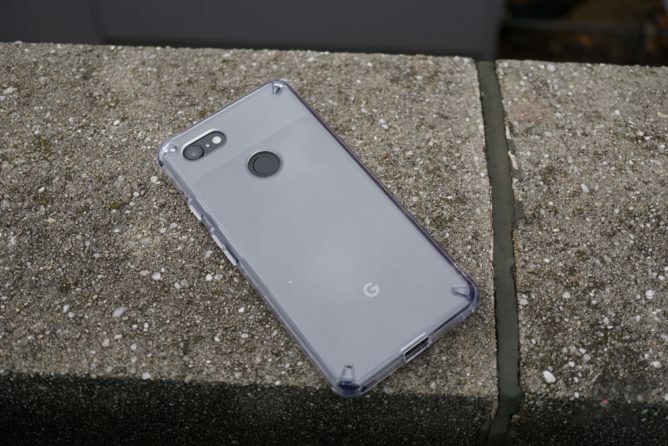 Because of how much thickness and width the case adds, your Pixel 3 will become much more difficult to hold. 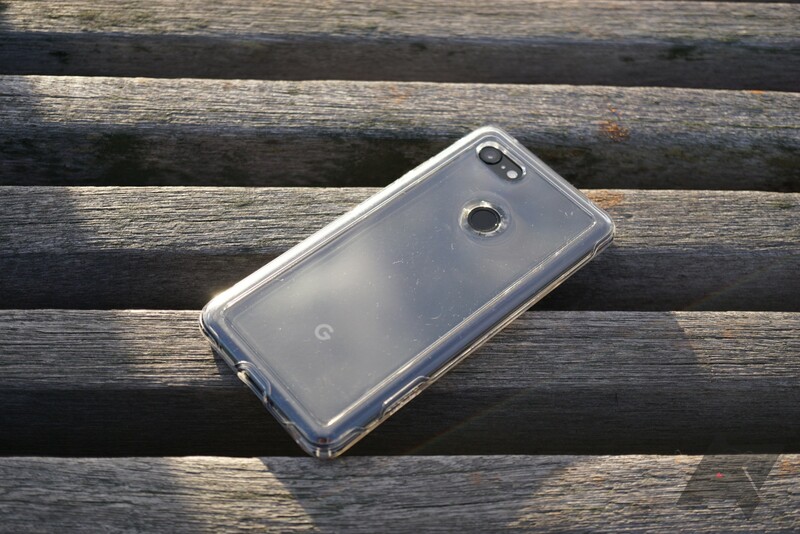 And unless you have very, very large hands, a Pixel 3 XL in this case becomes almost impossible to comfortably use. The thickness also prevents wireless charging from working properly; at best, the phone will be constantly connecting and disconnecting. Lastly, when you go charge your phone at night, be prepared to wrestle with the charging port cover for at least a couple of minutes. It's even more annoying than most other cases' port covers to remove. I'm sure that the OtterBox Defender provides more protection than 99% of the cases on the market, but it's just not worth it. Plus, if you use a Defender, you're forced to leave your screen exposed. Take into account all of the flaws, and that $50-60 price tag just becomes sort of laughable. If you need protection, there are many much better, much cheaper options out there. The Defender comes in black and Big Sur (blue and white). 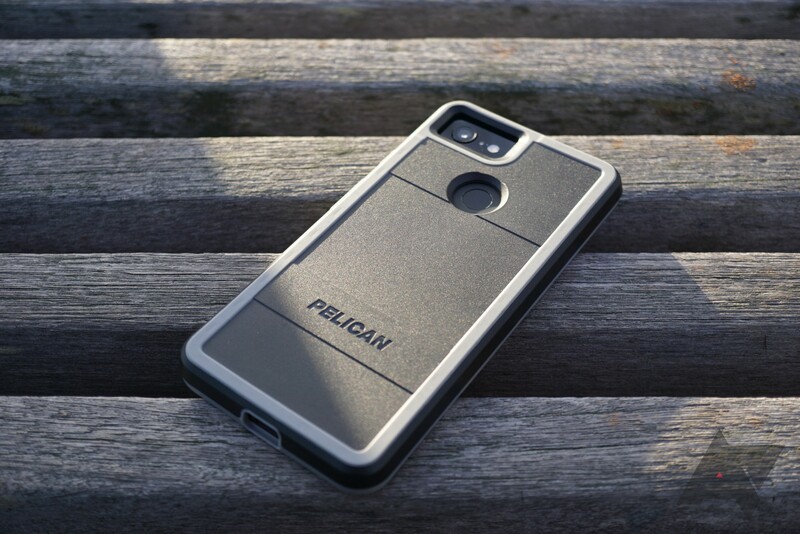 Some of you may recognize Pelican as a manufacturer of camera cases or ice coolers, but the company actually produces phone cases as well. 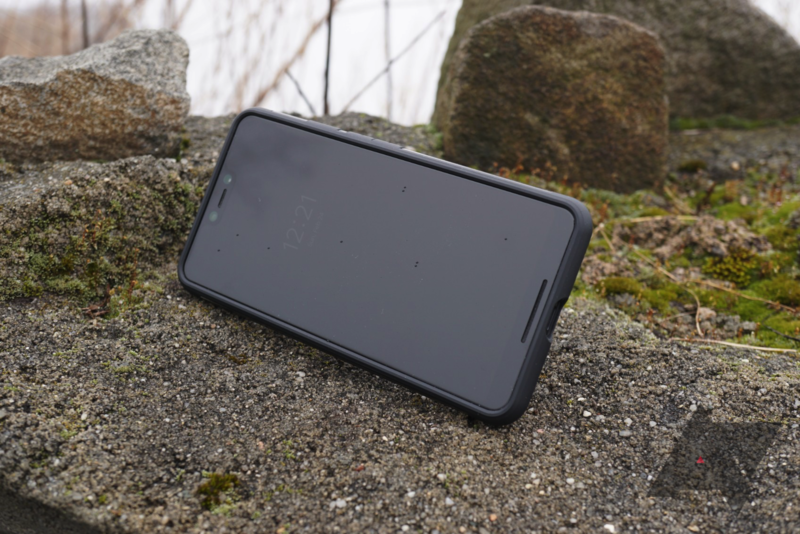 The cases share the same design aesthetic and focus on ruggedness as the other products in the Pelican family, and the Pixel 3's Pelican Protector case continues that trend. 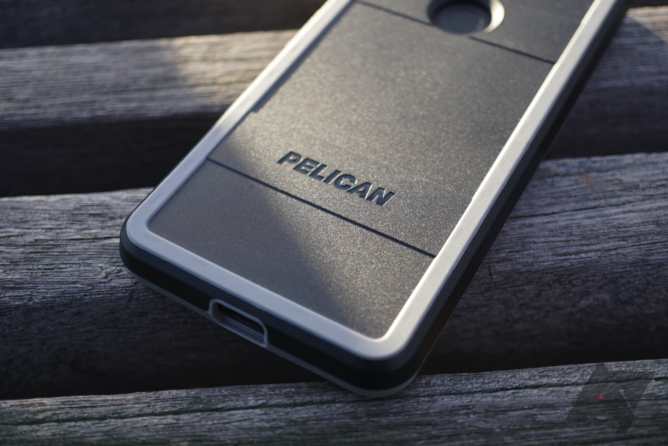 Design If you like Pelican products' design and/or you want your phone to match your other Pelican stuff, it's a good look. Protection It's chunky everywhere it needs to be. Buttons They're nice and clicky. Price $40 is a lot of money for a case with no legitimate distinguishing feature(s). The first thing I noticed about the Pelican Protector is just how much it makes the phone feel like a brick. The angles on the edges aren't sharp, but they're less contoured than other cases. 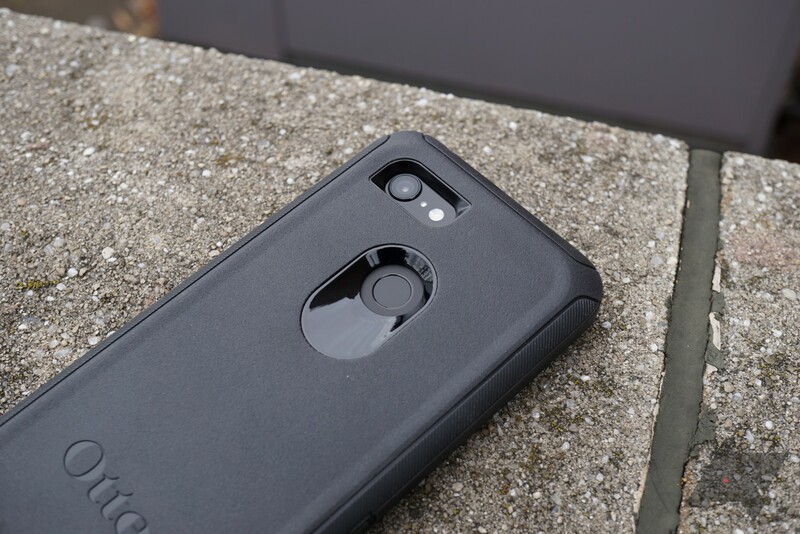 The thick back doesn't help, but it does mean that the camera is recessed and well-protected. Up front, the rubber lip is taller and chunkier than most cases. 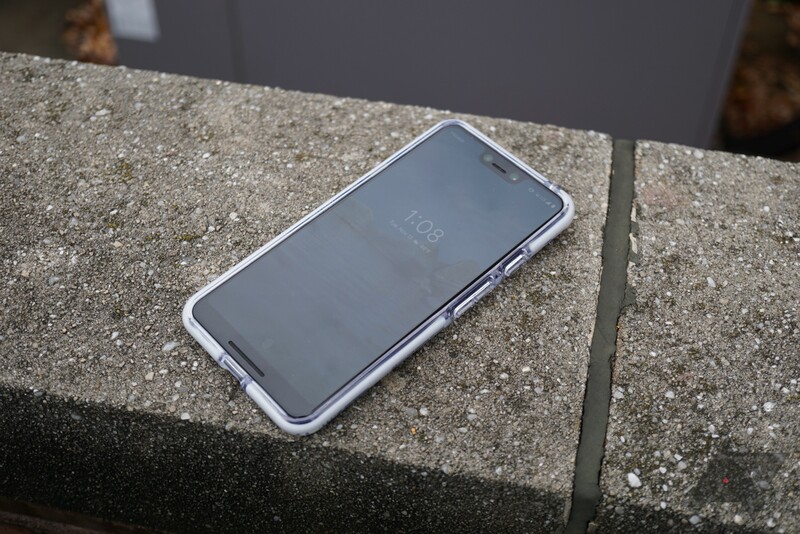 The case itself is actually a hardshell with rubber lining on the inside and rubber strips for grip on the outside; the chassis itself barely bends. 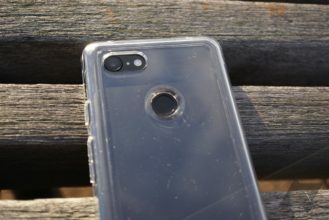 Pelican claims that the case is "tested to military standards to survive multiple drops," but doesn't clarify which standard. Looks-wise, this is immediately identifiable as a Pelican product — not just from the big "PELICAN" text engraved in the back, but the general design. The plastic back feels a bit cheap to me, but it should hold up well to abuse. The fingerprint sensor is rather deep, though the cutout is big enough that it's not uncomfortable to use. The buttons are among the better ones I've used; they're rubberized, easy to push down, and produce satisfying clicks. This will be a good case for some, though it's too brick-like for my tastes. It's a bit pricey at $40, but if you want your phone to match your camera cases or ice coolers, this might be something to consider. It only comes in black/gray. Recommendation: Buy it if you need a rugged case and like the design. Most clear cases (and cases in general) have at least one layer of soft material. Soft cases are generally more comfortable in the hand, easier to grip, and provide a lot more protection against impacts. Power Support apparently didn't get the memo, as the Air Jacket is made out of one piece of hard plastic. On top of that, it costs $40. Design It's slim and almost invisible. Protection The lip is nearly nonexistent, the bottom is wide open, and the case would probably shatter if dropped. Fitment It creaks around and can be removed far too easily. Grip This thing is slippery. Price I wouldn't even pay $4 for this, much less the $40 MSRP. The only good thing the Air Jacket has going on in its life is its looks. 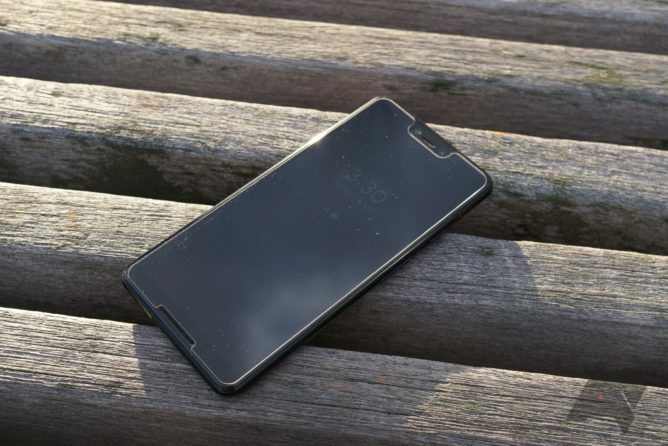 Given its slim construction and clear plastic material, you'd be forgiven for thinking an Air Jacket-cloaked phone is naked at a glance. It does have a dot matrix pattern on the top glass portion of the back to prevent the "water" effect. Unfortunately, that's where the compliments end. 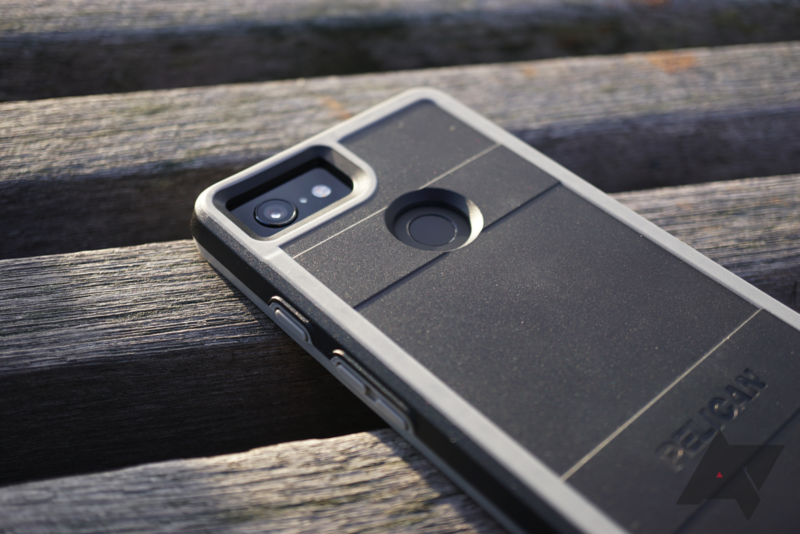 The case itself is very slippery, and it actually creaks around in your hand while you use it. There's next to no protection; the lip is tiny, and the bottom is completely open. Most case manufacturers put more padding around the corners, but not Power Support; there's actually less material in those high-impact areas. The buttons are simply cutouts — not a huge problem given how thin the case is, but not ideal. There's also the "water" effect around the corners. 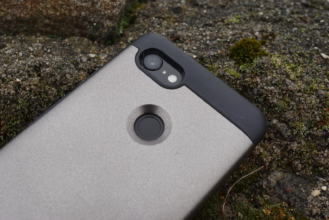 If there's one case on this list you absolutely should not buy, it's this one. I'm really not sure how these Air Jackets keep getting green-lit, and to that point, how they've earned "made for Google" certification. Did I mention it's wildly overpriced at $39.95? Something I've always admired about iPhones is their official case selection. 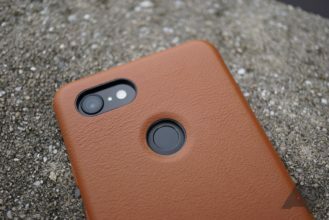 Apple's in-house silicone and leather cases are fantastic, and while the Pixel 3 now has a good leather option from Bellroy, the silicone category hasn't been filled — until now. Luckily for Power Support, the Silicone Jacket is a much better case than the garbage Air Jacket, though I'm not sure if I can recommend it. Design It has a clean, minimalist look that I'm a fan of. Material It's very comfortable in the hand and extremely grippy. Colors All four colors are pastel, and there should really be some darker colors offered. Material (again) It collects dust, dirt, and lint like nothing I've ever seen. As you know already, the Silicone Jacket is special because it uses silicone. 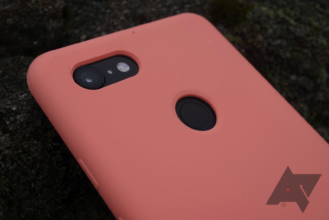 This means that the case is comfortable to hold and will never slip out of your grip, though it does have one major drawback: how quickly it attracts crap. 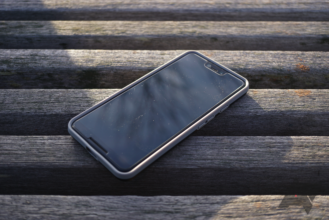 It'll attract lint from your pockets, as well as dust and dirt any time you put your phone down. The case can get disgusting within a matter of minutes, even if you clean it constantly. This is really quite unfortunate, as the silicone is otherwise a great material for a case. The rest of the case is pretty good. 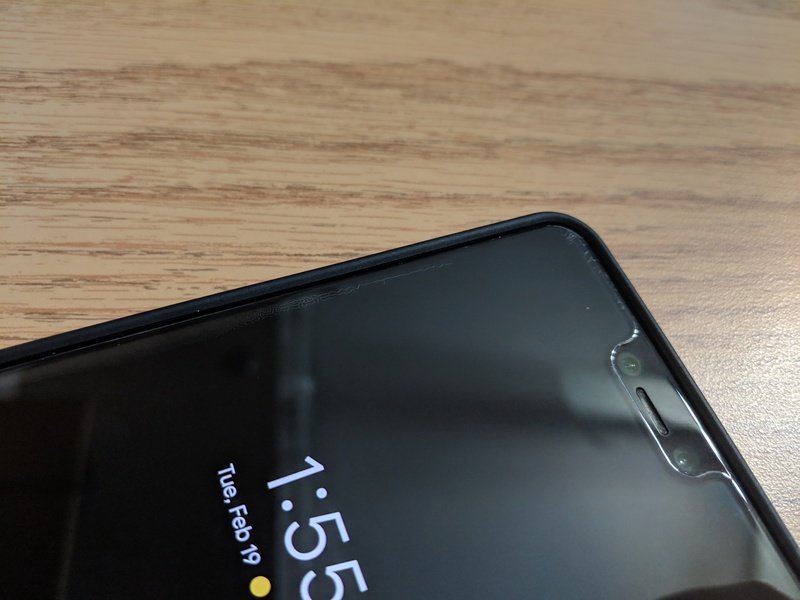 Protection-wise, the silicone seems very shock-absorbent and the lip is very thick, easily clearing a screen protector, but the bottom is left wide open. The buttons are very tactile and easy to push, and the cutouts are nice and precise. The interior is lined with microfiber, which gives it a premium feel. 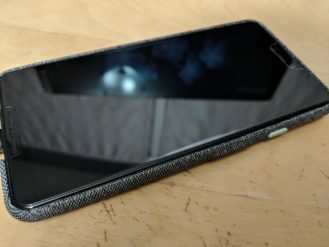 I really wanted this case to be a winner, but I'm not sure I can recommend it given how much dust and lint it collects. The bright, pastel color options (Peach, Dark Melon, Sea Glass, Pineapple) don't help hide all the nastiness, either. 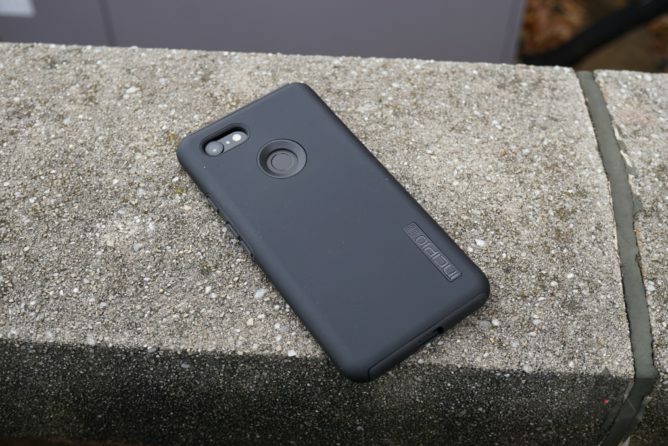 At $34.95, the Silicone Jacket is on the pricier side, but reasonably priced compared to other cases with more unique materials. If you can get by the inevitable dirtiness and the oddball color options, the Silicone Jacket is worth a look. Recommendation: Don't buy it if you don't want a consistently grimy case. Ringke used to be a pretty big name in cases, though they've faded quite a bit since their heyday. However, that doesn't mean that the quality of cases has necessarily diminished. The Fusion is what I personally remember Ringke for, though it might be a bit difficult to recommend this one. Protection The protruding bumpers on all four corners should provide some great shock absorption in the event of a drop. Buttons They're very tactile, and the power button is ridged. Material The back is very prone to fingerprints. Fitment The case can often be installed off-center somehow, and it's prone to making creaking noises. Like Spigen, Ringke knows how to make good buttons. The ones on the Fusion are extremely tactile and easy to push, and the power button is ridged. Ringke took an interesting approach with the front lip; it's taller at the top and bottom of the phone, but minimal on the sides. This gives it more clearance when placed face down (a screen protector will fit fine), but it's almost unnoticeable while you're using the phone. Unfortunately, the Fusion suffers from fitment issues. I'm not sure how this is possible, but the case has been installed off-center a few times, resulting in the whole thing to be kind of tweaked. Additionally, it makes creaky noises when being used - something I've never experienced with a phone case. It does have the infamous water effect at all four corners, though it's really not noticeable. 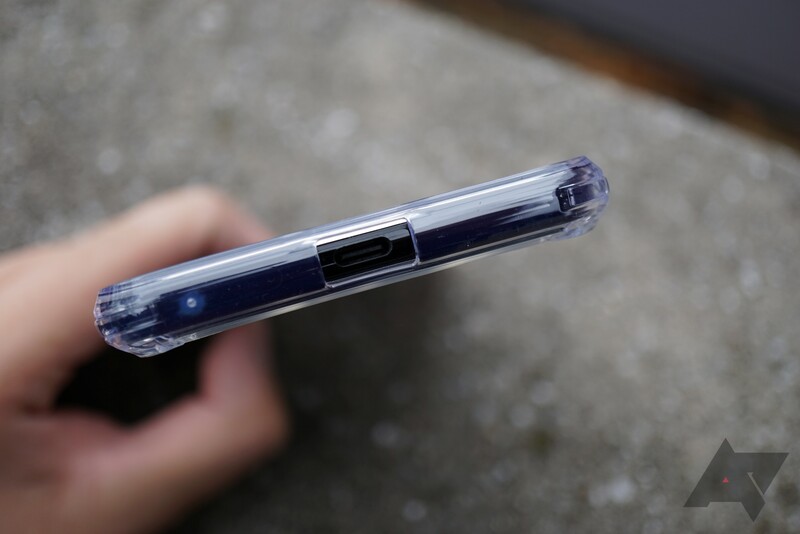 And like every clear case, it's a fingerprint magnet. 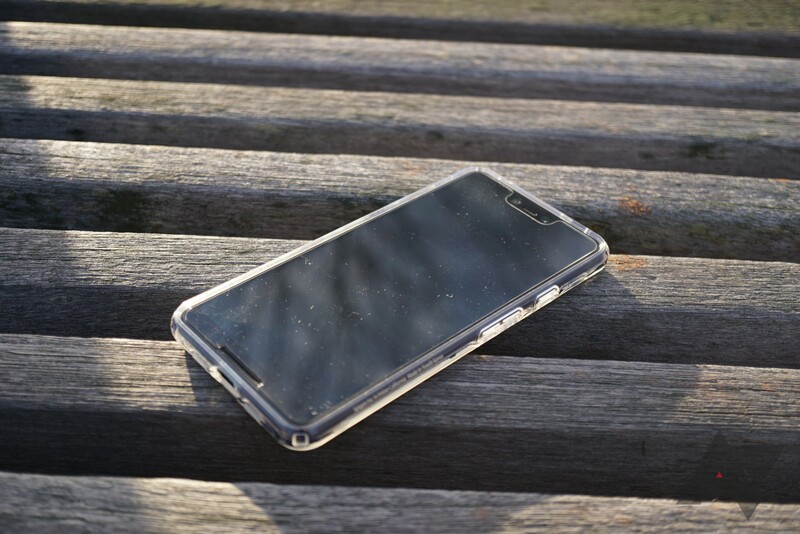 The Fusion has some good attributes and it's priced low, but you're probably better off going with another clear case. If you do want one, though it's available in clear for $8.99 and with a smoked bumper for $10.99. Recommendation: Don't buy it; it has some odd fitment issues. This case may have "Fusion" in its name, but in reality, it's almost completely different from the Fusion. Both share a clear back, but that's about it. The Fusion-X has a rugged look and few flaws, so if you dig the design, this is something you should look into. Design I'm not personally a fan of excessively rugged-looking cases, but if you are, this one looks the part. Buttons Tactile and ridged power button. Capisce? Price $12 is on the cheaper end of things. 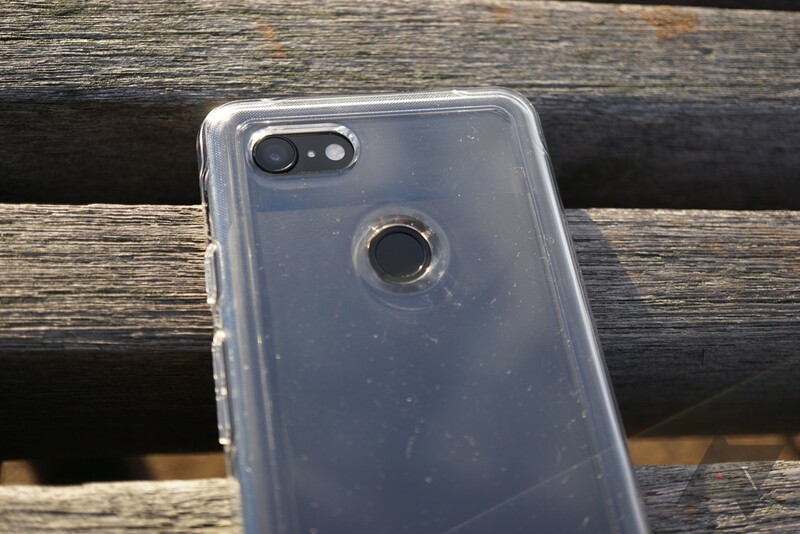 Material Like almost every clear case, the back gets smudged with fingerprints quickly. The first thing you'll notice about the Fusion-X is how chunky and excessive it is. It's not actually all that thick, but the design and the thick corner bumpers and raised camera cutout do give off that impression. There are a bunch of extra slashes of rugged slashes that cut into the clear portion - not my cup of tea, but some will like it. 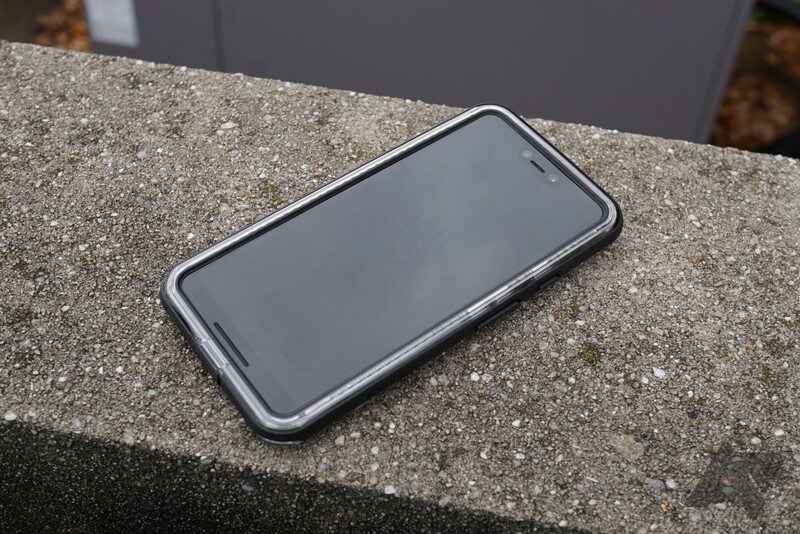 Whereas most cases feel smooth in the hand, you can feel the harsh edges on this one, but that's just what you get with a rugged-looking case. Ringke says this is MIL-STD 810G-certified, so at least all the aesthetics count for something. The Fusion-X uses a different type of button than the Fusion, but clicks are still tactile and the power button is still textured. The only legitimate downside to the case is how fingerprint-covered the clear back can get, but that's true of basically any clear case. If you like the case's aesthetics, go for it. It's rugged-looking with the certification to back it up, and it remains relatively slim. The version with black bumpers is $11.99, and the Ruby Red bumpers will cost you an extra dollar. Recommendation: Buy it if you like the look. If you're in the market for a Spigen Rugged Armor, the review for which is right below this one, you should probably consider the Ringke Onyx. 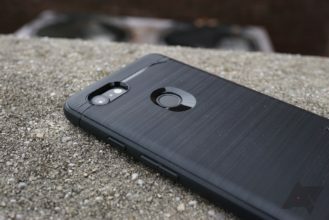 For $4 less, you get a simple one-piece case with a fingerprint-resistant back and great buttons. It's kind of absurd that I couldn't think of any flaws for a $9 case, when almost every other (much more expensive) case on the list has at least one. Design It looks nice, and there's a nice shallow slope to the fingerprint sensor. Material The faux-brushed metal back doesn't show fingerprints at all. Buttons Tactile and ridged power button - you get the gist. Price $9 is an incredible deal for a case with virtually no flaws. 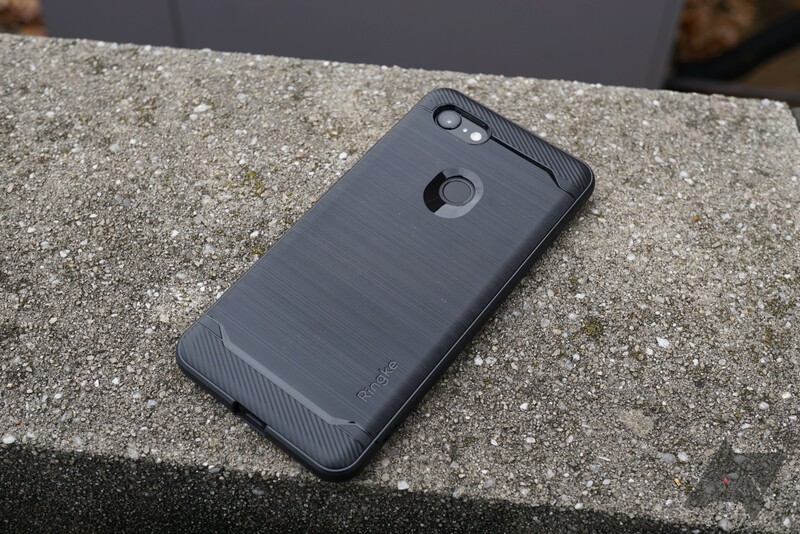 The Onyx uses a design that makes it look like a dual-layer case, but it's just one piece. 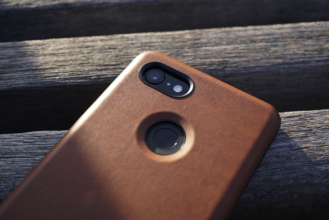 Most of the back is a faux-brushed metal that feels great in the hand and is about as good as repelling fingerprints as the Rugged Armor. The top and bottom have strips with diagonal ridges, which I have no real opinion on. Most of the pros of the other Ringke cases carry over. Here, we see the same tactile buttons, the same ridged power button, and the same unintrusive lip design. 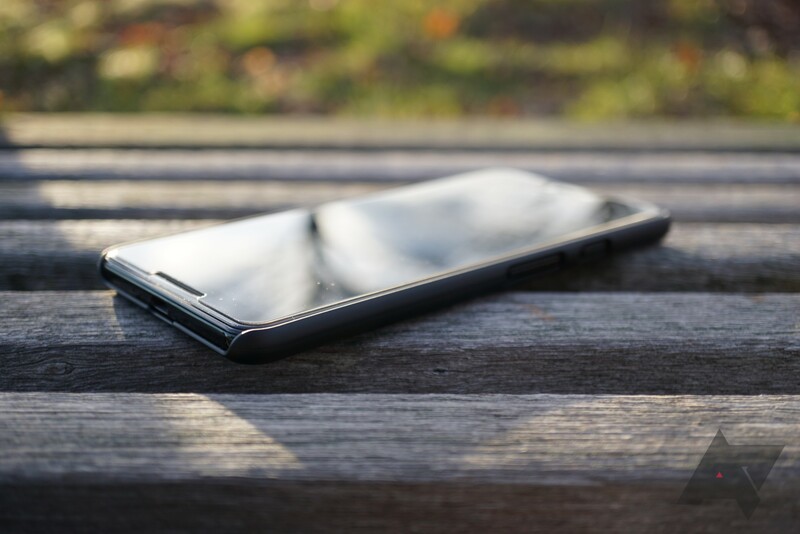 Unique to the Onyx is a more pronounced, shallower slope leading to the power button. This makes the fingerprint sensor feel a bit nicer, even if it doesn't really do much functionality-wise. I'd ordinarily dedicate at least a sentence or two to complaints, but as you can see above, I really don't have any. Given that this is the cheapest case by quite a bit (as of original publishing time), that's quite impressive. The Onyx comes in Black and Lilac Purple (the purple version is $1 more for whatever reason). Recommendation: Buy it; it's basically flawless and it's dirt cheap. 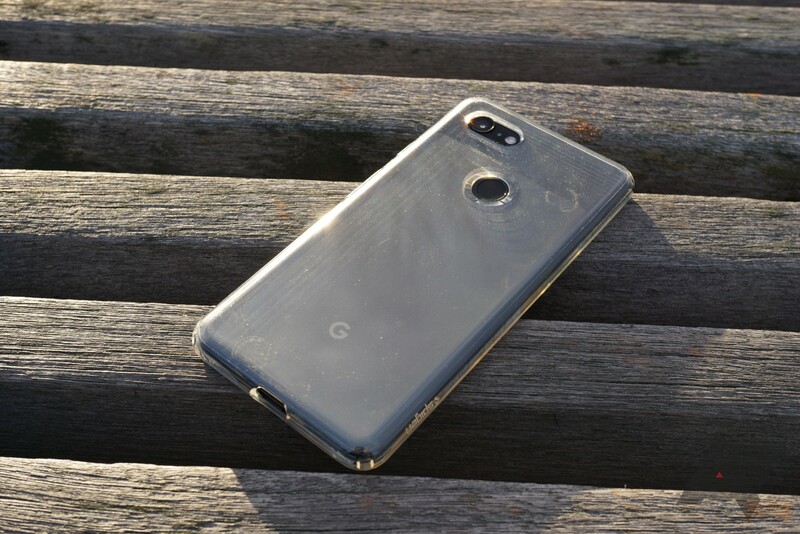 One of my favorite cases for my Pixel 2 XL last year was the Speck Presidio Grip. 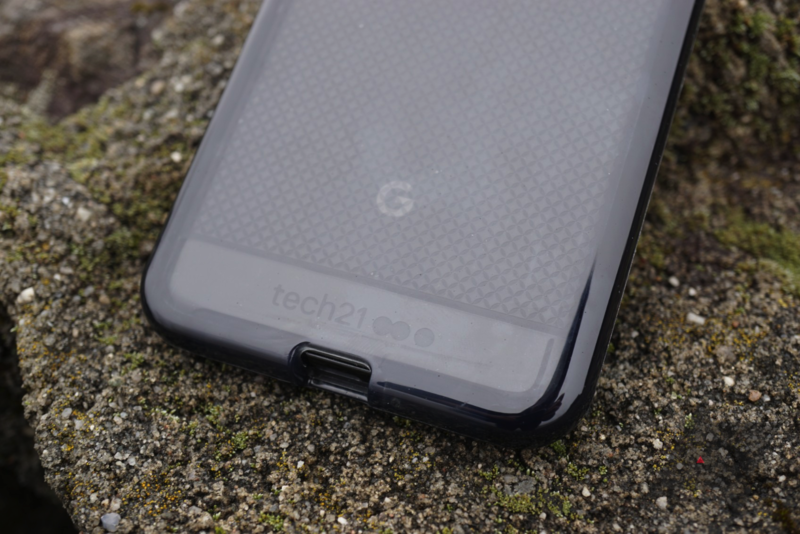 Not much has changed in the Pixel 3 version of the Presidio Grip, so surprise: it gets a nod from me yet again. The only downside to this case is price, but Amazon has both the Pixel 3 and 3 XL versions at discounted rates. Design It looks rugged without overdoing it, and it definitely looks like a Speck case. Protection The rubber strakes on the back are grippy, but if you do drop your phone, it'll probably be fine. 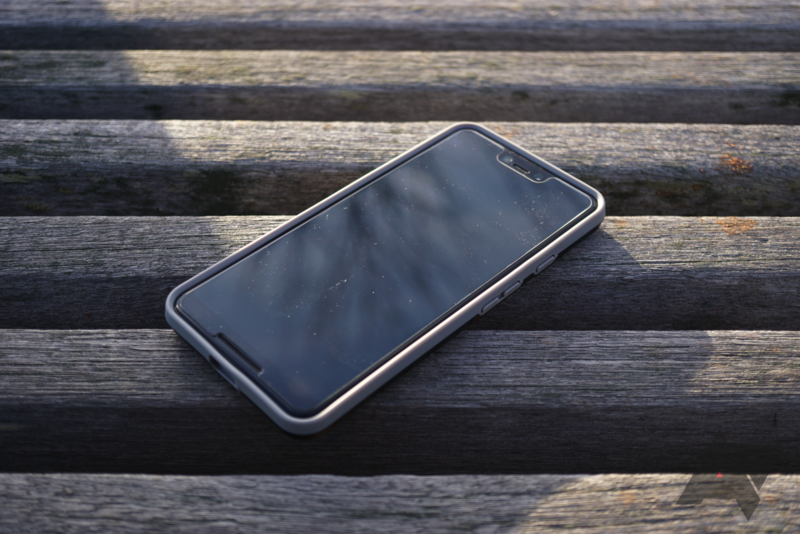 Size It makes the phone feel protected without adding a ton of bulk like many competitors. 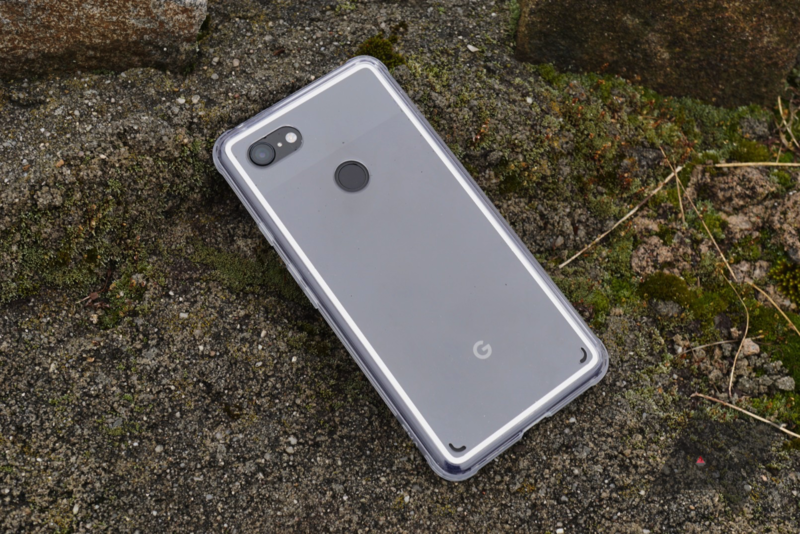 Price The $45 MSRP is a lot, and the Pixel 3 XL version's price is still close to that. 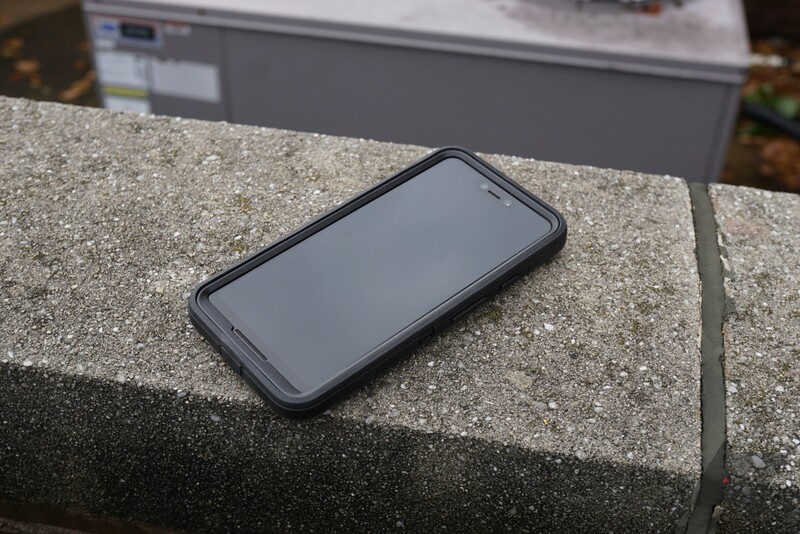 Most rugged cases try too hard to look it, but I think that Speck did a great job with the Presidio Grip. It's pretty clean-looking for the most part. The rubber strakes on the sides not only look good, but they also add grip and absorb shock. 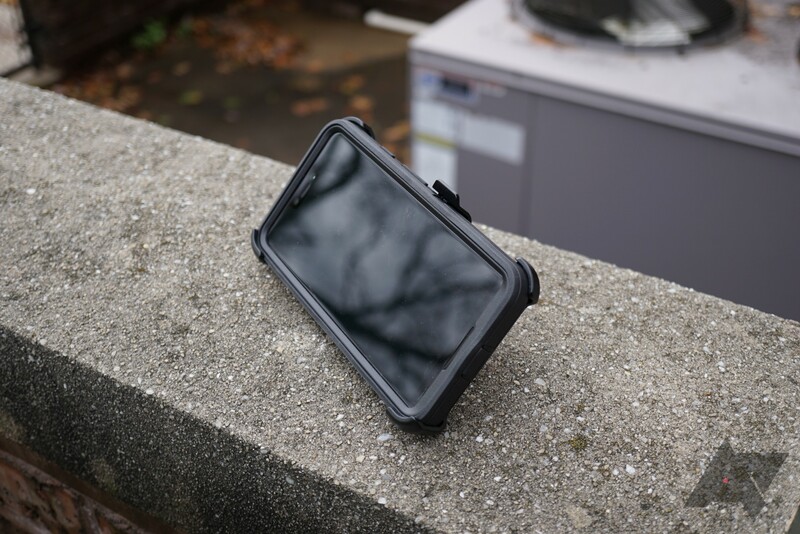 The case feels extremely sturdy even when not installed, and it still manages to be less bulky than other rugged cases. 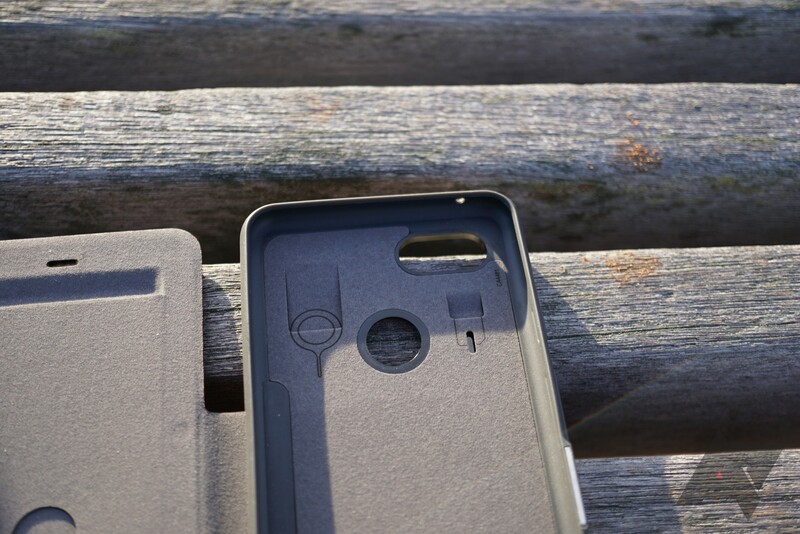 There are also some bumpers on the corners and a shock-absorbent lining inside to further protect the phone. The Presidio Grip excels in other categories as well. The lip is substantial without being annoying, and it easily clears any screen protector. The cutouts are well-done, with the fingerprint sensor being easily and comfortably accessible. The rubber buttons are clicky and feel fantastic to press. I also like that the only bit of branding is the tiny Speck logo on the top right of the back. This case offers one of the best protection-bulk ratios out there. 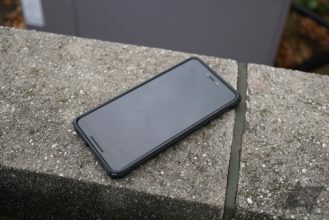 The only real holdup is the price; at $39.95 or $44.95 for the Pixel 3 and 3 XL versions, respectively, I'm just not sure it's worth that much more than a cheaper alternative. 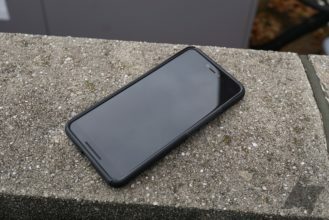 Thankfully, Amazon currently has the Pixel 3 model for $24 (in black, other colors cost more) and the 3 XL version for $38. 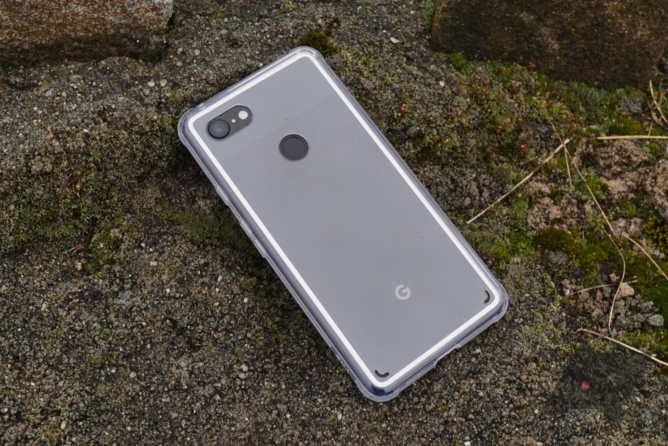 At these prices, I'd say that it's a no-brainer if you have a Pixel 3, and it's worth buying if you have a 3 XL and like the case. 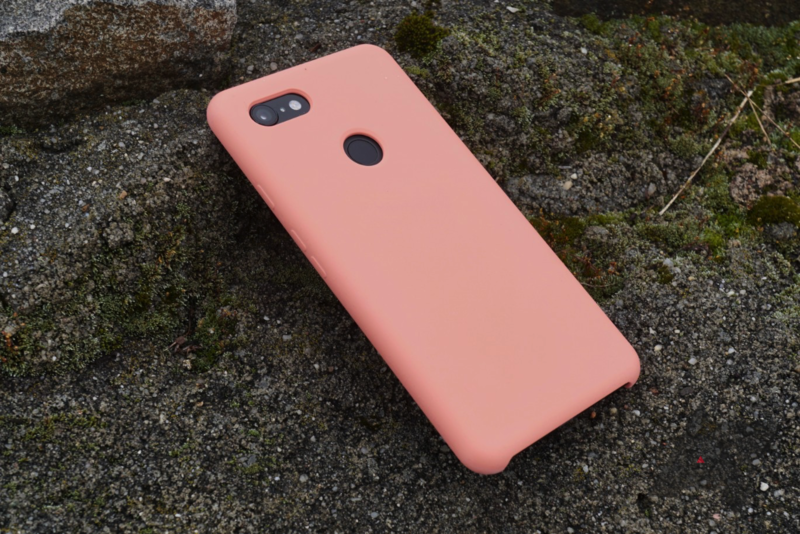 The case comes in black, "Desert Rose Pink/Heartwood Brown," and "Graphite Grey/Charcoal Grey" (only available for the Pixel 3). 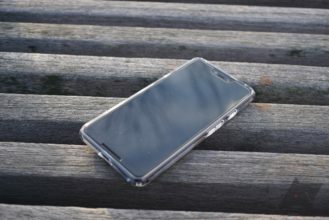 Spigen has a couple of clear cases in its lineup. 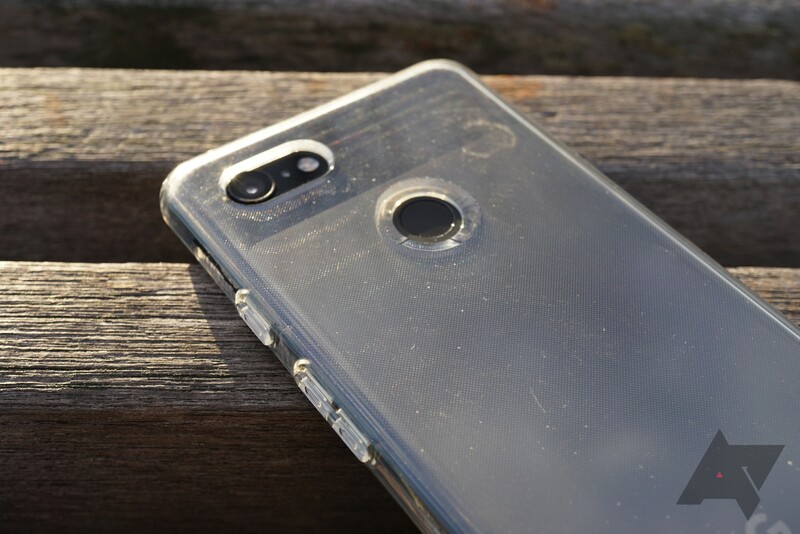 The Liquid Crystal is the company's cheapest and most popular clear case, and for good reason — it's damn good. 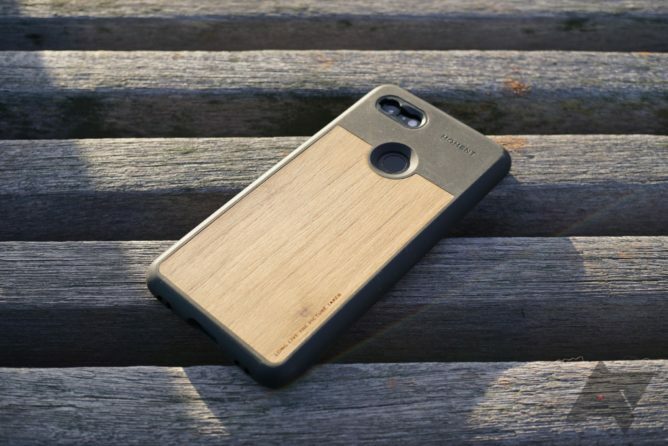 At $11.99, this case is probably one of the best values for your money out there. Design The dot matrix pattern on the back means keeps things composed, and the case is well-thought out in general. Protection The combination of all corners being covered, a fat lip, and the rubbery material make this case very confidence-inspiring. Buttons Like most Spigen cases, they're very tactile. Price $11.99 is a great deal for this. Fingerprints It's prone to them, like most cases of its kind are. "Water" effect Difficult to notice, but it's there on the corners and edges. That's about it. 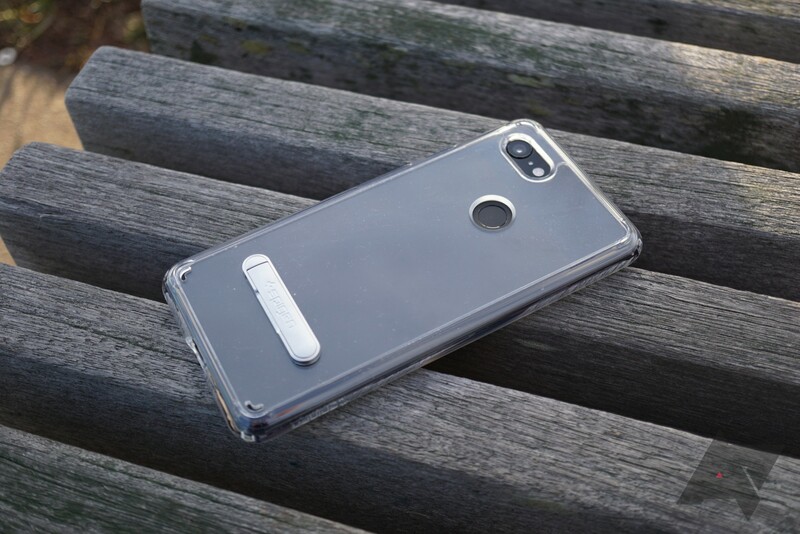 As far as clear cases go, the Liquid Crystal is a great option. 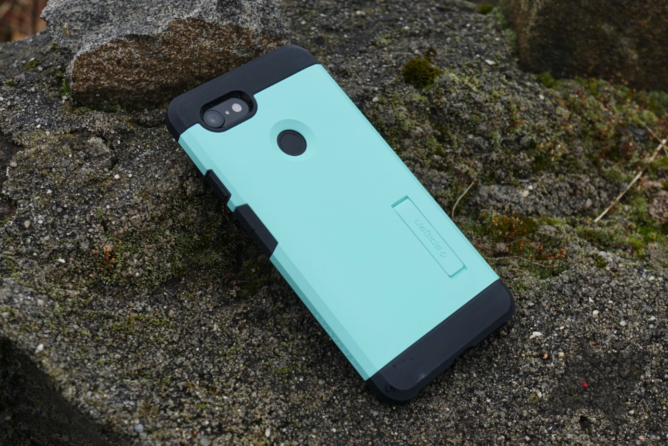 The entire case is composed of TPU, which is grippy and feels great in the hand. The material is pretty thick, meaning that it should fare well in a drop. 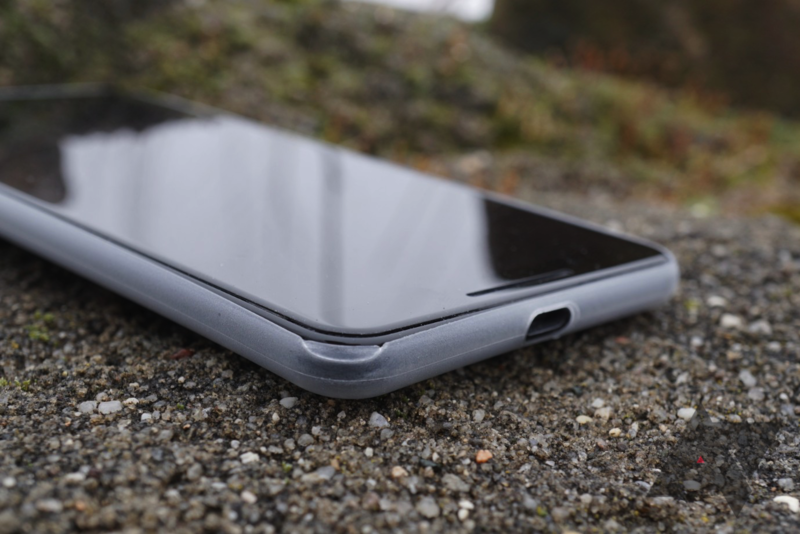 The corners have Spigen's "air cushion" tech for added impact absorption. 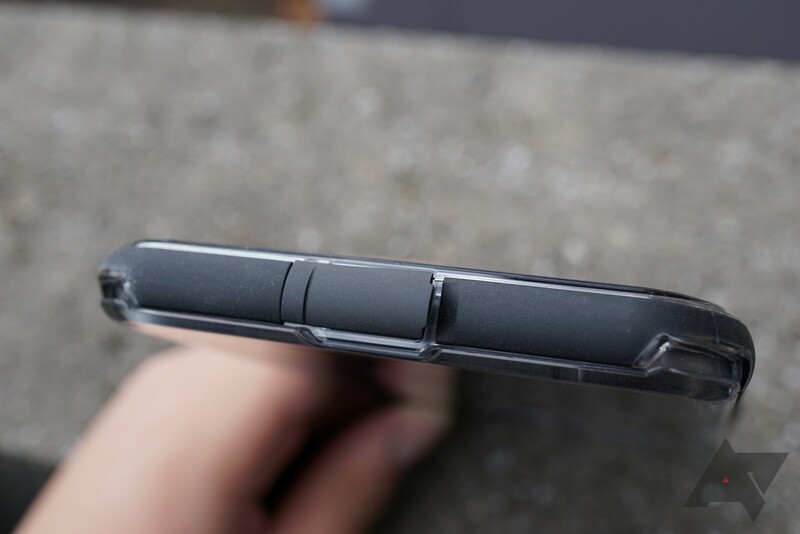 The lip up front is on the larger side, clearing a screen protector with ease. The buttons are extremely clicky and make a nice noise. There are a few minor issues. The dot matrix pattern on the entire back prevents the "water" effect from taking over, but it is slightly visible on the edges and corners. The back is prone to fingerprints, so you may want to have a microfiber on deck. However, both of these are problems with almost all clear cases, and the Liquid Crystal excels in all other arenas. This case is a good buy. It has a couple of issues, but hey — you can't expect perfection for $12. As far as standard clear cases go, this one's about as good as it gets. 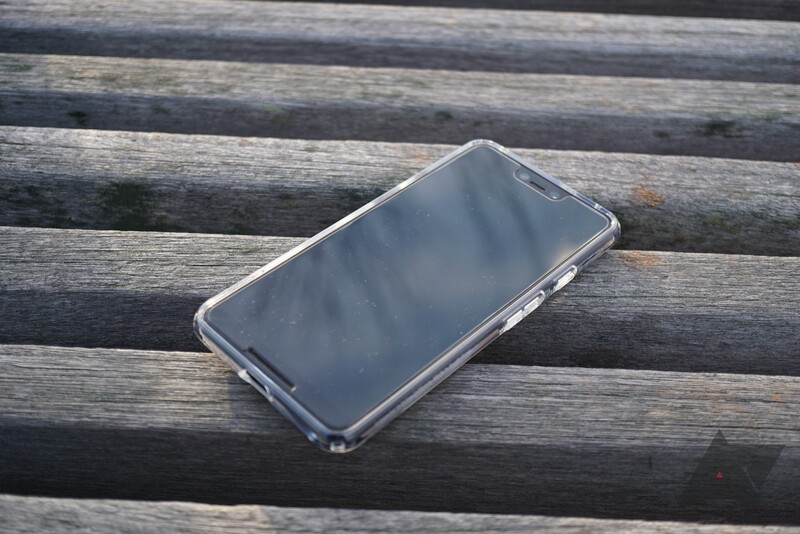 Recommendation: Buy it if you want a clear case with some protection. Even though the Neo Hybrid was one of the first smartphone cases I've ever had, I've never been a huge fan of it. I liked the super-tactile hard plastic buttons, but Spigen went with regular buttons this time around. The Neo Hybrid just doesn't do anything particularly well. Design It's not my cup of tea, especially in this maroon/gold color combo, but some may appreciate it. Price It's priced well at $14-15. Bulk The plastic outer strip makes the case wider than it needs to be. Fragility I worry that the plastic strip may shatter on harder impacts. The Neo Hybrid's distinguishing feature has long been its plastic outer strip, but I've never liked that. 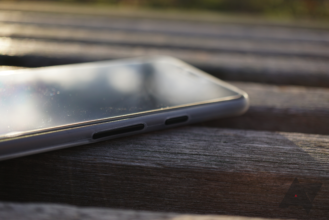 For one, it makes the phone a lot wider, meaning that it's more difficult to hold than it needs to be. Plus, the strip is pretty brittle, and it's prone to cracking upon impact given the material and how narrow it is. I'm also not sure it helps much with protection given said brittleness. Lastly, it makes installing and removing the case a lot harder than it should be due to the lack of flexibility. The rest of the case does seem pretty protective, with the lip extending over the screen protector and all four corners covered up. 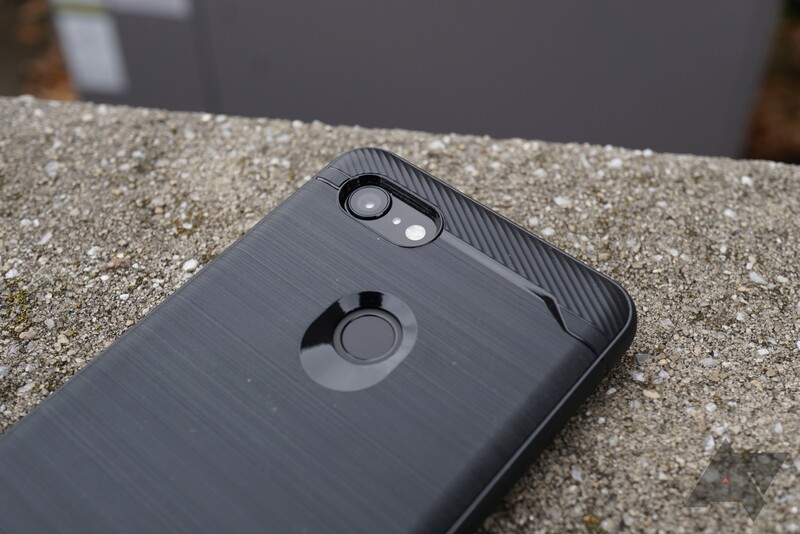 It's also worth noting that the TPU back does a good job of resisting fingerprints. 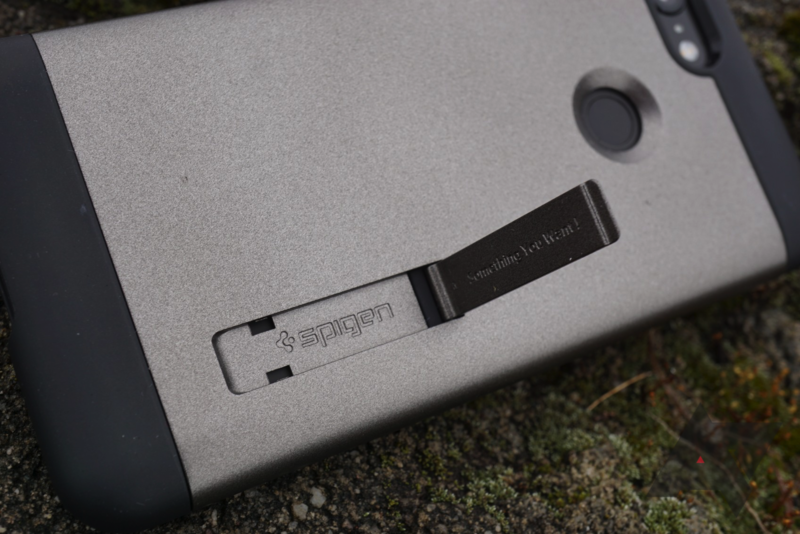 Older Neo Hybrids had independent silver power and volume buttons that were extremely tactile and easy to press, but Spigen has opted for standard integrated ones here. They're alright, but they're a bit more difficult to press than I'd like and a far cry from the old buttons. 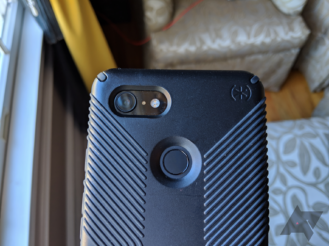 As with any Spigen case, the cutouts are good. You can probably tell that I'm not a big fan of the Neo Hybrid, and that's because it doesn't really do anything great. It's wide without being super protective, the design is meh, and the buttons are no longer amazing. If you really like the way this thing looks, go for it, but I think the Tough Armor is a better option for most. The Neo Hybrid comes in black ($13), Burgundy ($14), and Mint ($14). Add $1 to each for 3 XL variants. Recommendation: Buy it if you really like the way it looks. 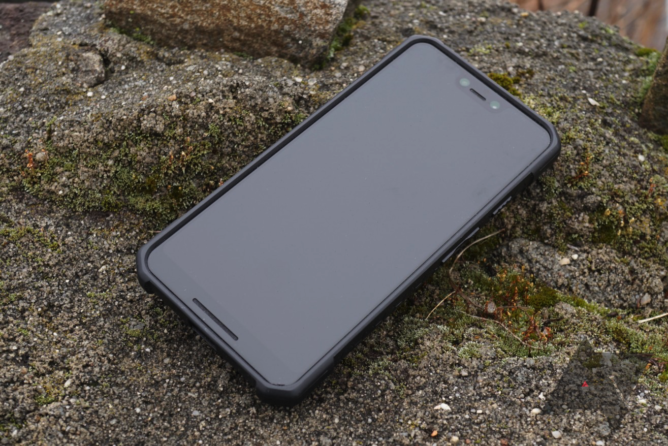 The Rugged Armor line is one of the newer additions to Spigen's stable, but it's quickly become one of the most popular ones given its simplicity and low price. 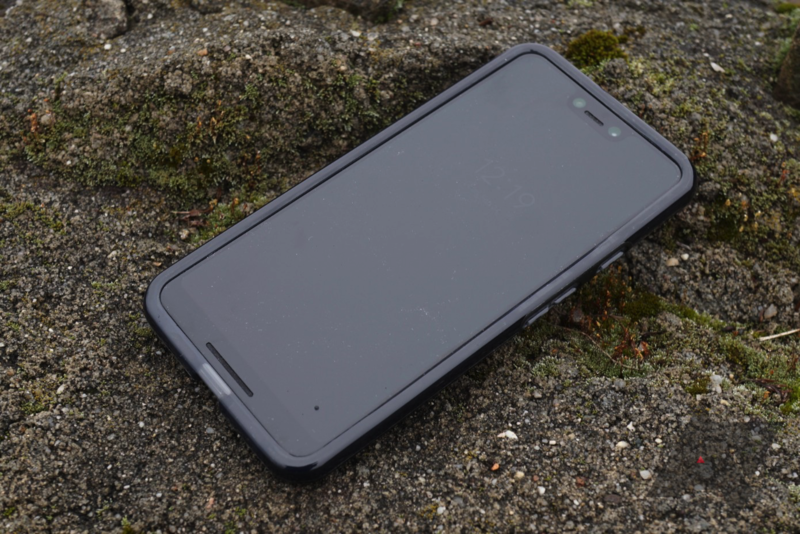 When compared to the Pixel 2's Rugged Armor, there are a number of upgrades that make the Pixel 3's even better. Material The matte soft-touch stuff used is basically a fingerprint repellant. Buttons They're all very tactile, and I dig the ridged power button. Price $13 buys you a very solid case. Material (again) It might feel a bit unpleasant to those with dry hands, and it seems to scratch easily. 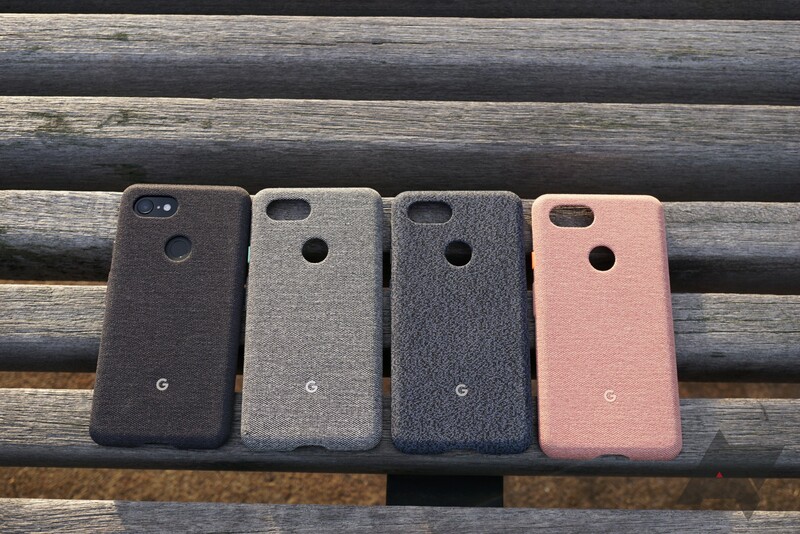 I didn't think much had changed from the Pixel 2's Rugged Armor to the Pixel 3's until I put them side by side. It turns out that there are actually quite a few improvements. 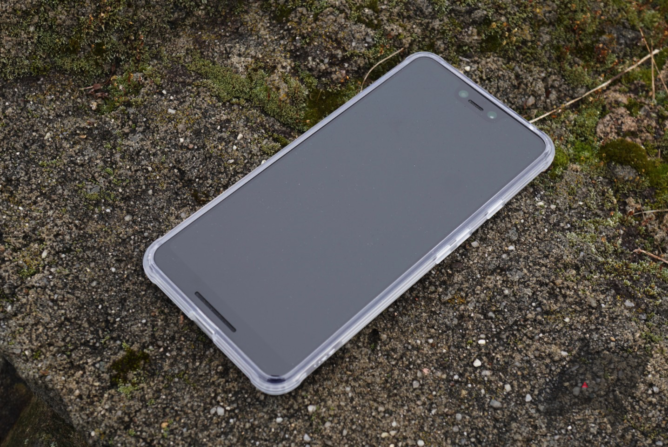 The most prominent change is with the material; the Pixel 2's was already matte and fairly fingerprint-resistant, but the Pixel 3's takes it to a whole other level. The finish is now a bit rougher (but not in a bad way) and is basically invincible against fingerprints. It's actually quite impressive. The power button is now ridged, allowing it to more easily be distinguished against the volume buttons. 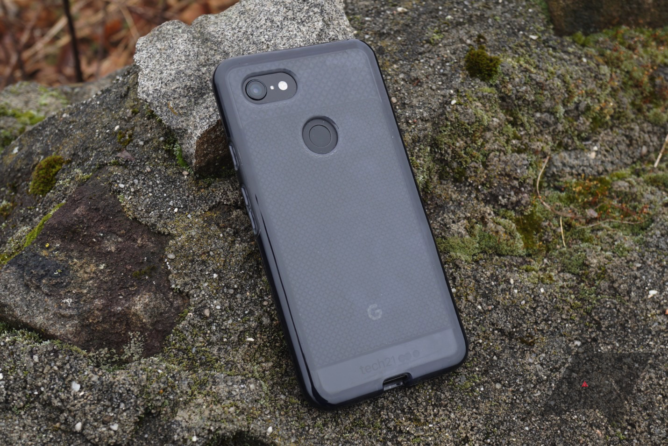 There are some stylistic changes, too; the top faux-carbon fiber portion has been traded for a ridged pattern (like the Rugged Armor for the first Pixel), and the bottom faux-CF is glossier. I'm usually not a fan of fake carbon fiber, but this actually looks pretty nice. My only real complaint is, ironically, with the material; it may make dry hands feel even drier. 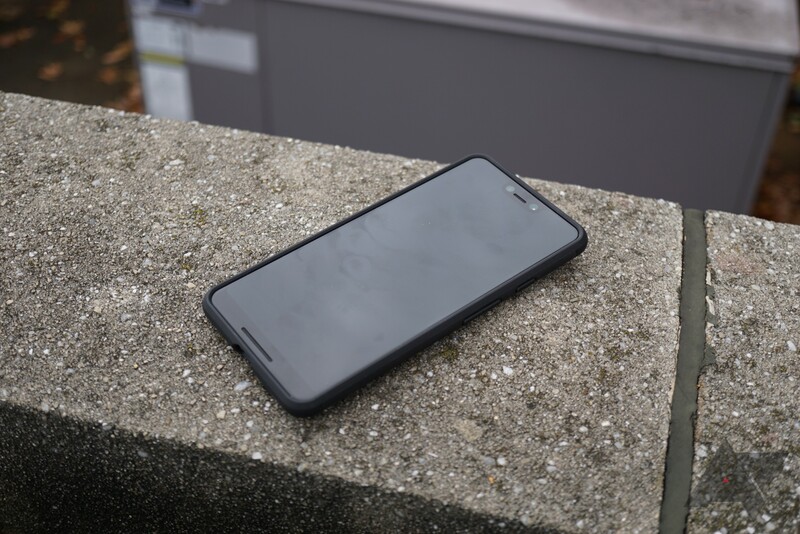 This was a minor complaint I had with the Pixel 2 Rugged Armor, but the fingerprint resistance of the Pixel 3 version's material takes the dryness to a whole new level. Hell, it even makes my hands feel dry when I'm not out in the cold. This could just be me, as I don't see any Amazon reviews mentioning it, but I thought I'd throw it out there. It should also be noted that it appears to get scratches/marks on it more easily than other cases. 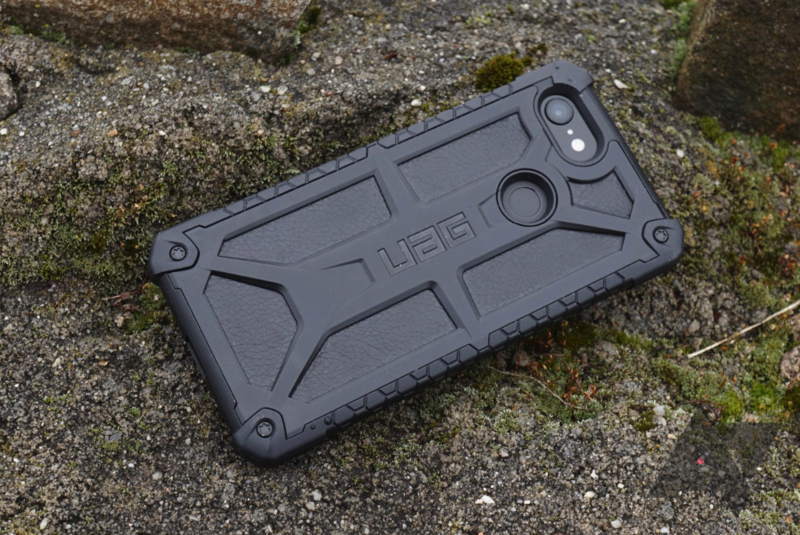 The Rugged Armor is a great option if you just want a simple, no-frills case that can easily be slipped on and off. At $13, it's one of the cheapest cases on this list, and it'll be more than fine for most. I especially like the fingerprint-resistant finish, though those with dry hands may want to look elsewhere. 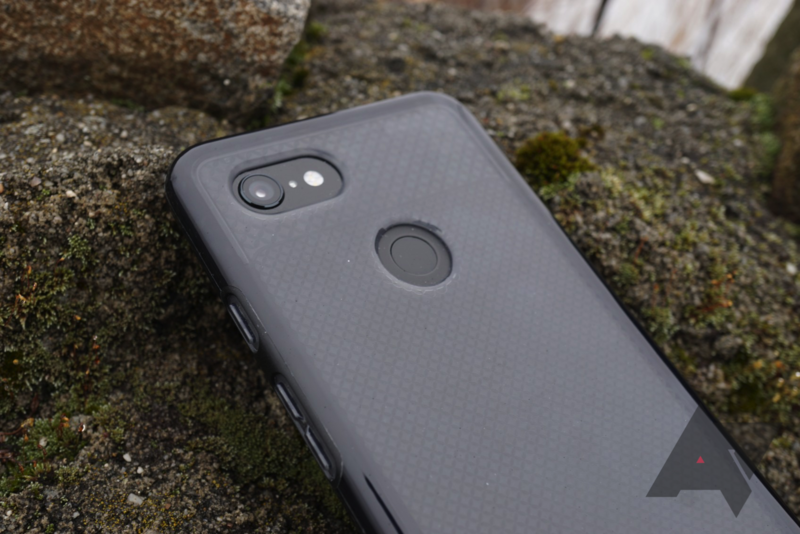 We took a look at the Slim Armor Crystal a few months ago, but that's basically a completely different case than the standard Slim Armor. The actual Slim Armor is really just a slightly smoother version of a Tough Armor. 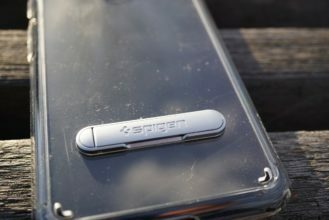 Interestingly, it doesn't seem like Spigen actually wants people to buy it, as it's priced at a sky-high $40 or so on Amazon. 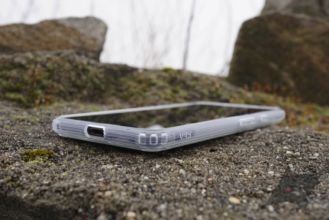 Design The grey finish and curved edges make for a handsome yet sturdy case. Kickstand It's here, and it works like it should. Protection It's protective without feeling like a big rugged case. Price We're pretty sure that Spigen legitimately has no intention of selling these given the $40 price. In my mind, the Slim Armor is really just a slightly more stylish version of the Tough Armor. Personally, I prefer the Slim Armor's curved edges to the Tough Armor's chiseled ones. Protection is almost identical, meaning that the dual-layer construction will absorb shock, and the lip will clear a screen protector. Some say that the Slim Armor is slippery, though I disagree. It's not the grippiest case, but it's not just going to fall out of your hand. There's still a somewhat soft-touch material on the back. Looks aside, the most noticeable difference is with the buttons. Here, all three buttons slightly protrude from the side. They're clicky, but their shape isn't the best. 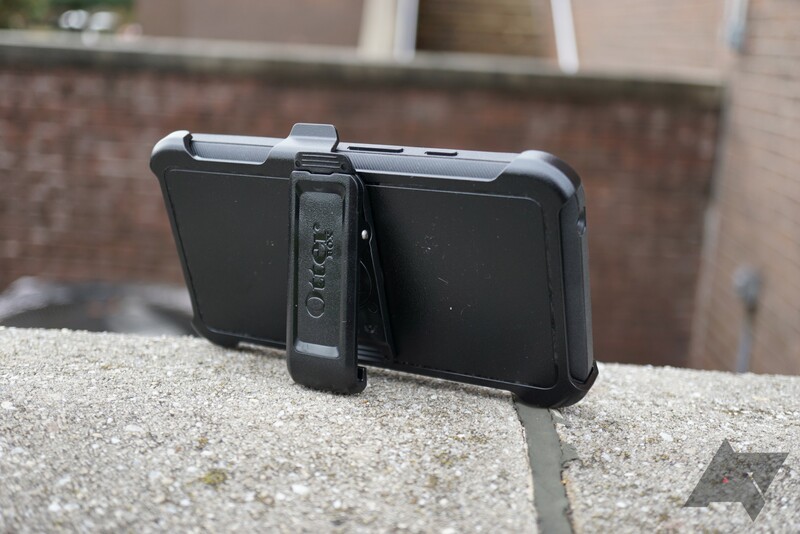 The kickstand functions as it should, offering two viewing angles. It's easy to open and doesn't fall out when the case is taken off. Like all Spigen cases, the cutouts are accurate. At the end of the day, it doesn't really matter what I think about the Slim Armor because Spigen doesn't want to sell you one. It's not the first or second search result that comes up even when you search the exact keywords, it's not offered with Prime shipping, and it's astronomically priced at $40-ish compared to the Tough Armor's $15 price tag. 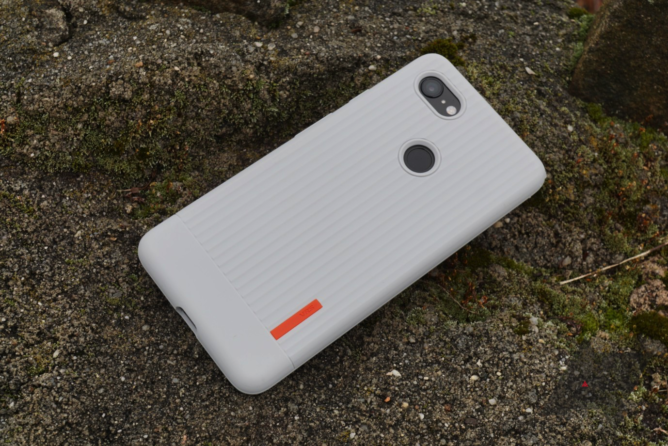 If this were priced like or for a few dollars more than the Tough Armor, it might be worth purchasing, but Spigen just really doesn't want to sell any of these. Recommendation: Don't buy it because it's far too expensive for what it is. 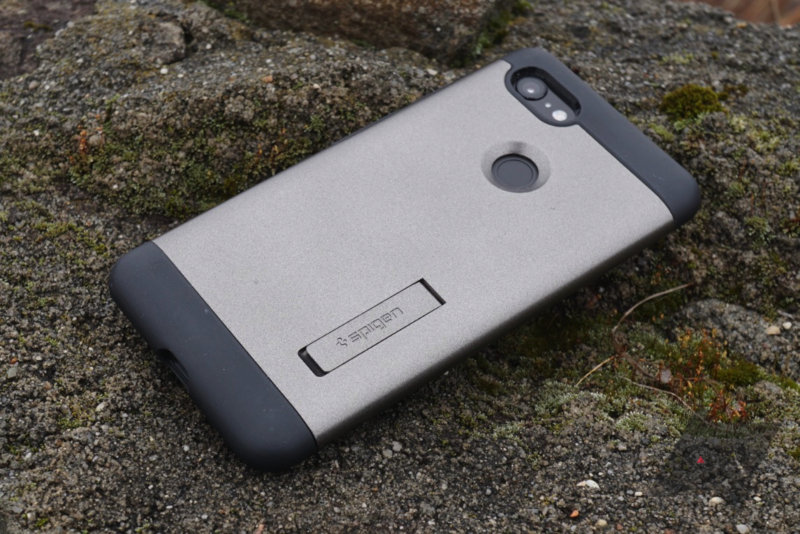 Spigen has several primary lines of cases, with one of them being Slim Armor. Over the years, Spigen appears to have largely phased out the Slim Armor cases, as it always seems like they're exorbitantly expensive compared to their very similar Tough Armor counterparts. The company still offers the Slim Armor Crystal, though it's pretty pricey. Design It has some touches that make it different from a regular clear case's look. Protection It's very sturdy, and it'll do a great job against impacts. Buttons They're easy to press, yet provide a great click. Among the best I've used. Material Fingerprints are easily accumulated, and the slight "water" effect is present on the corners. Price $40 is a lot of money for a clear case. If you're reading this, you've probably already seen the Liquid Crystal review above. So what makes the Slim Armor Crystal cost over three times as much? Well, it really doesn't share much with the regular Slim Armor case, but it does feel a lot sturdier than the Liquid Crystal. 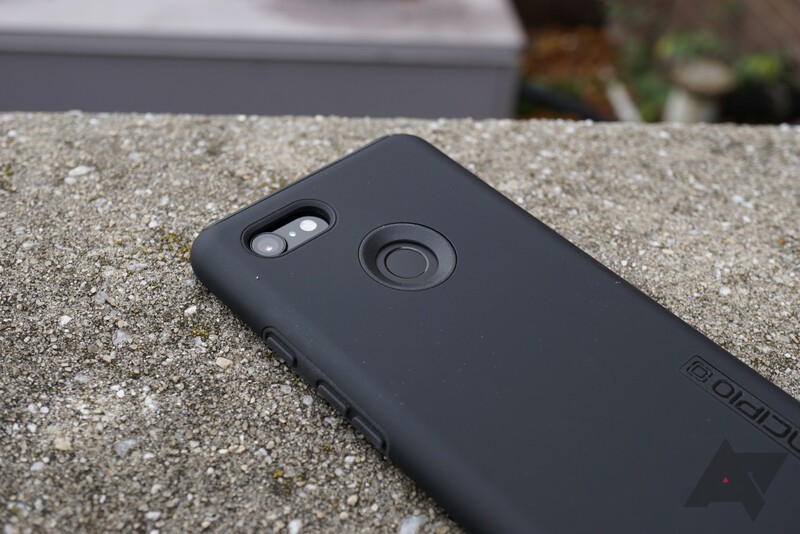 The back on this case is hard plastic, though the sides are TPU for better grip and comfort. Both the back and the sides are thicker than usual, making it ideal for absorbing impact. There's also a barely-noticeable squiggly line running on the sides that I'm assuming is supposed to be rugged, though you really won't see it unless you go looking for it. I'm also impressed with the buttons, which are some of the best I've pressed. They're tactile and easy to press, qualities that make a great button. However, there's one big caveat here: fingerprints. I expected the Slim Armor Crystal to attract fewer fingerprints than the Liquid Crystal, but in my testing, it actually attracted more. This is a big deal, especially with a case that costs this much. If you buy this, you really will need a microfiber with you at all times. There's also the same "water" effect on the corners that is common with all clear cases. 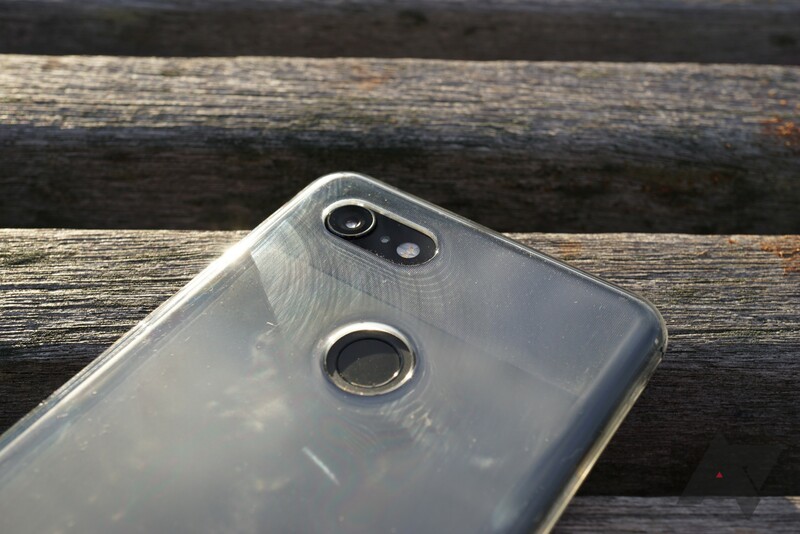 The Liquid Crystal isn't a bad case, but the fingerprint issue is quite severe. 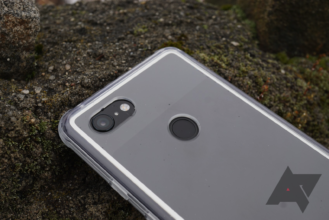 On top of that, it legitimately doesn't seem like Spigen wants to sell any of these; it's three times the price of the Liquid Crystal and has one review between both Pixel 3 and Pixel 3 XL listings on Amazon. If you were considering this, save yourself the ~$28 and buy yourself the Liquid Crystal instead; it's a bit less protective, but it doesn't have as severe a fingerprint issue and it's considerably cheaper. Recommendation: Don't buy it; get the Spigen Liquid Crystal instead. 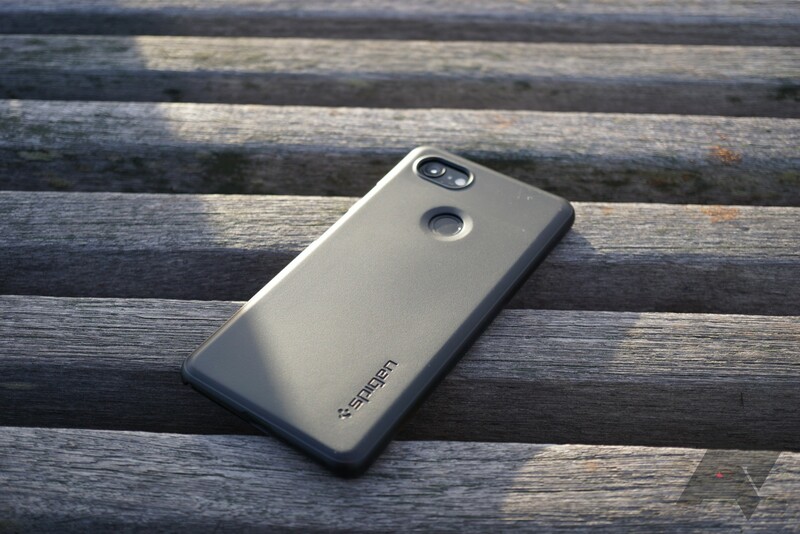 As you might be able to tell from the name, the Thin Fit is Spigen's slimmest case. It's no MNML Case, but it still offers some degree of protection. I've always been a fan of the Thin Fit, and that hasn't changed with the Pixel 3 iteration. Design It has a clean, minimalist look. Material The back is extremely resistant to fingerprints, but it still feels pretty good. Magnetic insert All Thin Fits have an insert for a magnetic mount, which can be very handy for in-car mounts. Price $10-12 for this thing is a great deal. Protection Look elsewhere if you want something rugged. Thin Fits have traditionally used a soft-touch material that, while comfortable to hold, attracted fingerprints pretty easily. The Pixel 3 version bucks that trend — it actually has two different types of material. 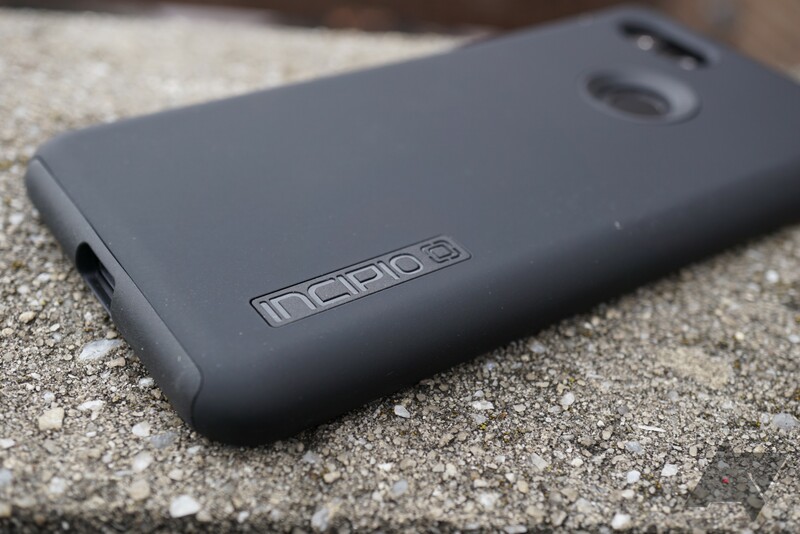 The back is less grippy than before, but it's much, much more fingerprint-resistant. It also has a slight change in texture up top, where the Pixel 3's own glass appearance changes. 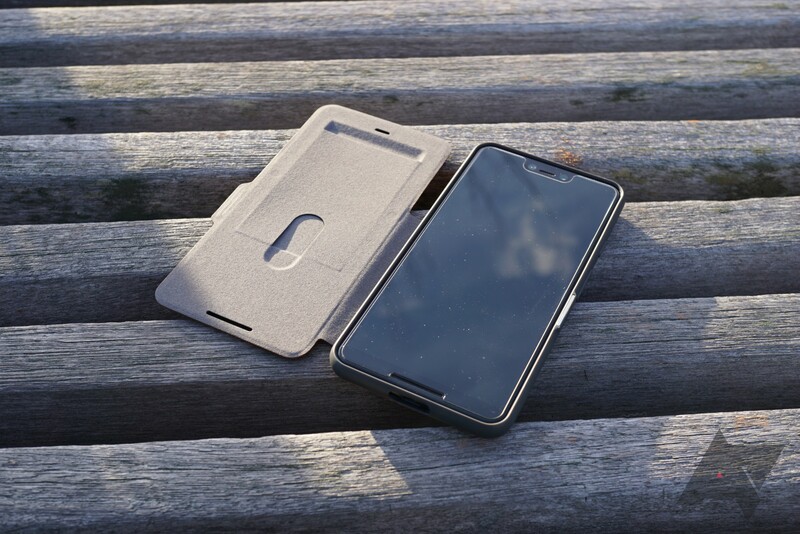 The sides of the case, however, appear to still use a similar soft-touch material to prior Thin Fits, which is a pretty great idea considering that this is where people actually hold onto the phone anyway. These portions aren't especially prone to fingerprints either. 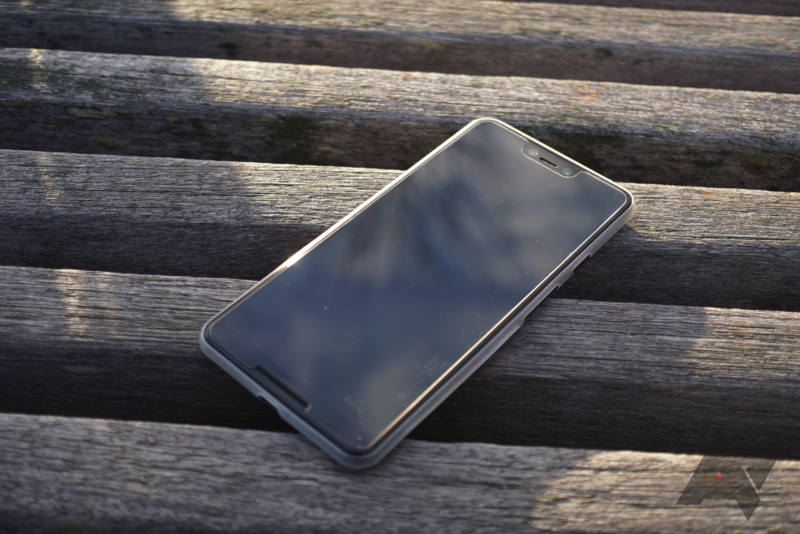 Material aside, the Pixel 3 Thin Fit is a pretty standard affair. As usual, the case is very thin, adding minimal bulk to the phone. There aren't even any buttons, just cutouts (they work decently well). Of course, that means there's very little protection; the top and bottom are left wide open, though the corners are (mostly) covered. 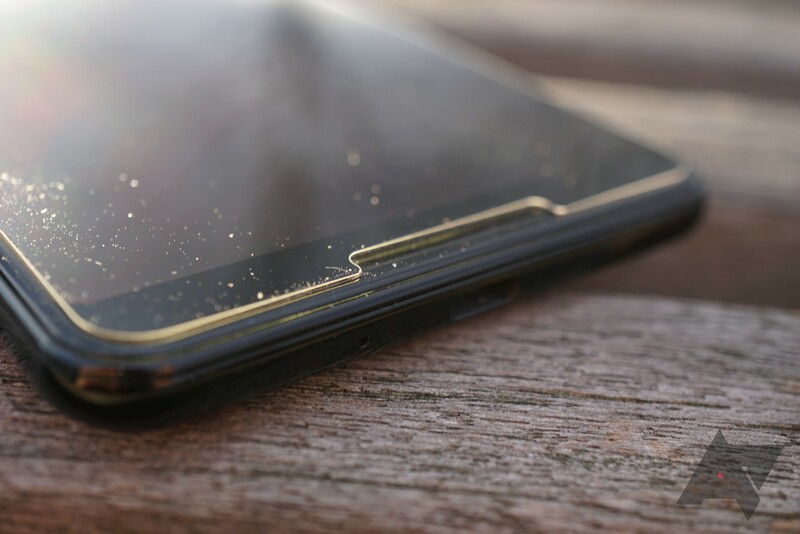 The lip up front is barely enough to clear the screen, and definitely not enough for a screen protector of any kind. There is a small hump around the camera to protect the optics, though. We also can't forget about the option to add a magnetic insert into the back (sold separately), which can make mounting your phone in the car a lot easier. 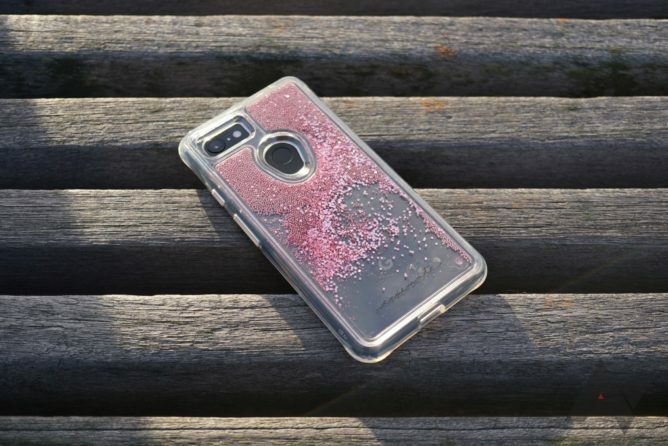 This is a well-thought out case, and as long as you're not too clumsy, it should serve you well. 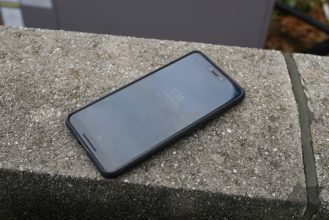 At $11.99 and $9.99 for the Pixel 3 and 3 XL versions, respectively, it's also a very good deal. It comes in Black, Graphite Gray, and Mint (prices differ for colors). The Tough Armor has long been a great option for those looking for some additional protection without breaking the bank. The Pixel 3 version is no different, offering the same kickstand-equipped beefy, chiseled design. 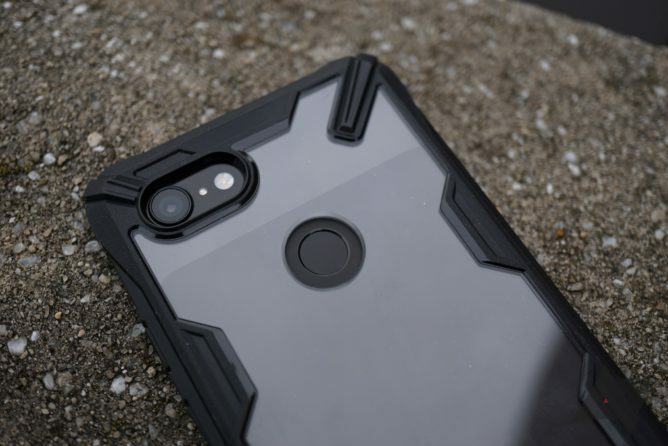 Anyone who has used a Tough Armor case in the past will love this one. Design It's classic Tough Armor through and through. Kickstand It's still as helpful as it's always been. Protection The dual-layer construction and beefy lip make this good for even the clumsiest people. Price At $15 (or $16 for other colors), the Tough Armor is a good deal. Given the case's name, it's no surprise that it's rather protective. It's not OtterBox Defender-level protection, but then again, you're not dealing with Defender-level bulk. This case is a nice compromise between form and function — you'll definitely feel the additional bulk over a regular case, but it doesn't make the phone difficult to hold. 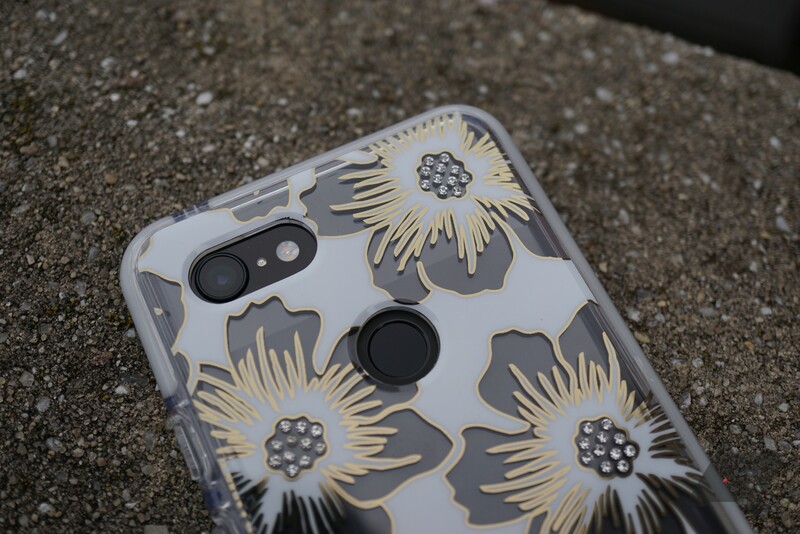 The TPU portion that hugs the phone is nice and thick, and the hard outer layer has a soft-touch material that resists fingerprints very well. The lip clears a glass screen protector, but not by as much as I'd imagined. On that note, the lip is rather wide, so there's very little tolerance between it and the screen protector. In classic Spigen manner, all of the cutouts are precise, and there's a nice, shallow indentation for the fingerprint sensor. The kickstand is very helpful when you're watching videos, and it doesn't fall out as easily as previous models' when the case is removed. 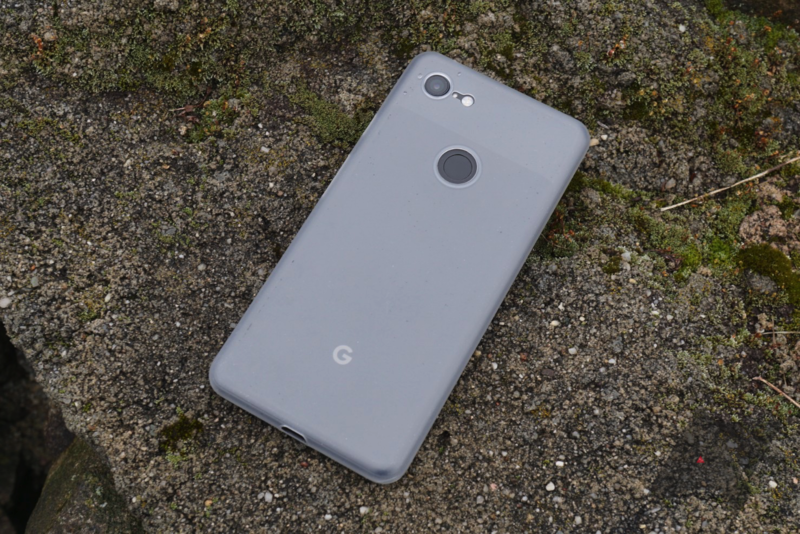 As with the Pixel 2 version, it's body-color, not the shiny silver that it once was. It's easy to open even with shorter fingernails. My one complaint is with the volume buttons; while the power button is ridged and easily identifiable, the volume buttons are basically flush with the side of the case. It's not unusable, but I would personally prefer if they protruded more. 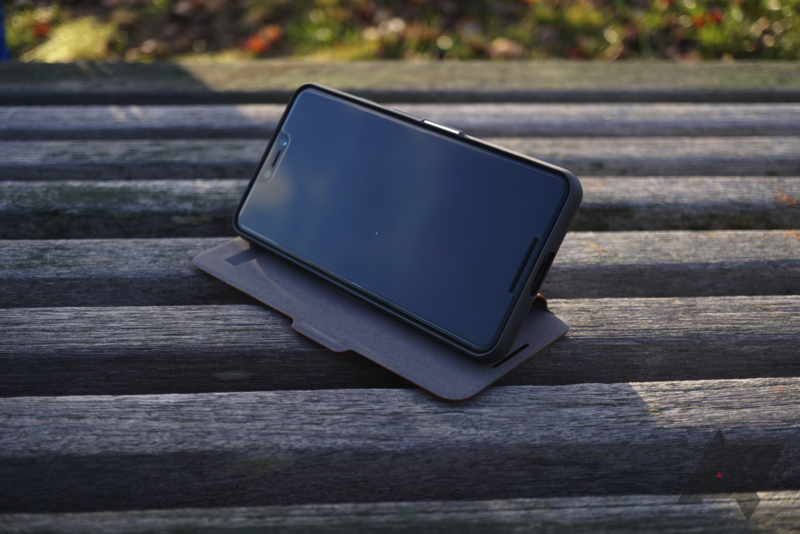 Recommendation Buy it if you drop your phone often, but don't want something enormous. Build It strikes the perfect balance between slimness and protection. Kickstand I didn't expect it to be metal, spring-loaded, and magnetized. Fingerprints They accumulate on the back extremely easily. Kickstand (again) The phone can't lay flat because of it. 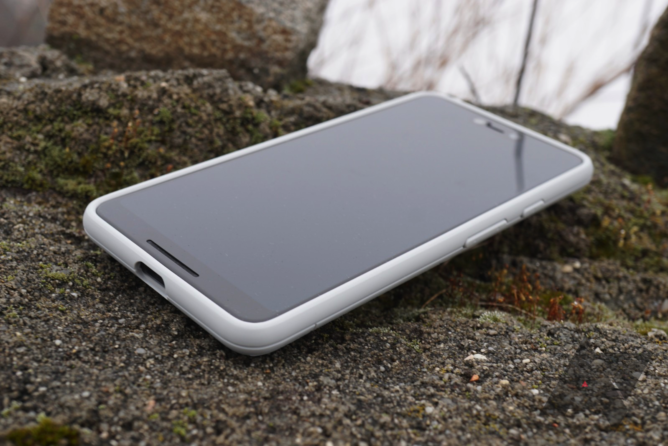 Unlike Spigen's Liquid Crystal, the Ultra Hybrid S has a hard plastic back. I've always preferred this, as the solid back makes the entire case feel more solid. In the Ultra Hybrid S's case, it also means that a kickstand was able to be stuck on. I was expecting the kickstand to be flimsy plastic, but in actuality, it's a spring-loaded metal piece that is held down by a magnet. This design is much superior to what is implemented on the Tough Armor cases; it feels nicer and requires less effort. However, it does cause the phone to be slightly tilted away from you when laid on a table, so be wary of that. As for the rest of the case, it's mostly good news. The buttons are among the best I've used; they're extremely easy to push down and produce that satisfying "click" we all love. The case isn't super bulky, but it feels like it'll adequately protect the phone. It is worth noting that the back is a fingerprint magnet, and it can get nasty pretty quickly. The lip around the screen is about average, and should clear a screen protector. One minor gripe: because the Pixel 3 and 3 XL have a glossy finish on their sides, the case shows a sort of "wet" effect on many edges. It's probably not something you'll notice, but if you're OCD about these things, you should know about it. 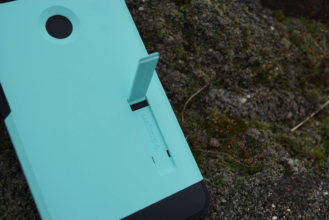 If you want a case with a kickstand, this is one to consider. 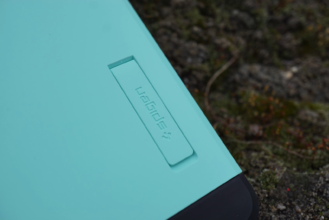 It's protective while still staying relatively slim, the kickstand is high-quality, and the buttons are amazing. It has some flaws, but you can't expect perfection for $14. As with most Spigen cases, the bang for the buck you get here is impressive. Recommendation: Buy it; just make sure to have a microfiber close by. tech21 advertises the Evo Check as offering great drop protection without adding much bulk, and from what I can tell, that seems to be true. 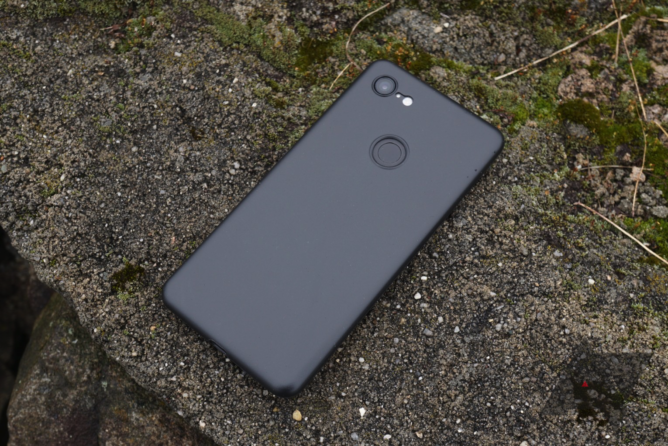 I wasn't too kind to the Evo Check in my Pixel 2 roundup last year, though I feel that my words may have been a bit unwarranted. 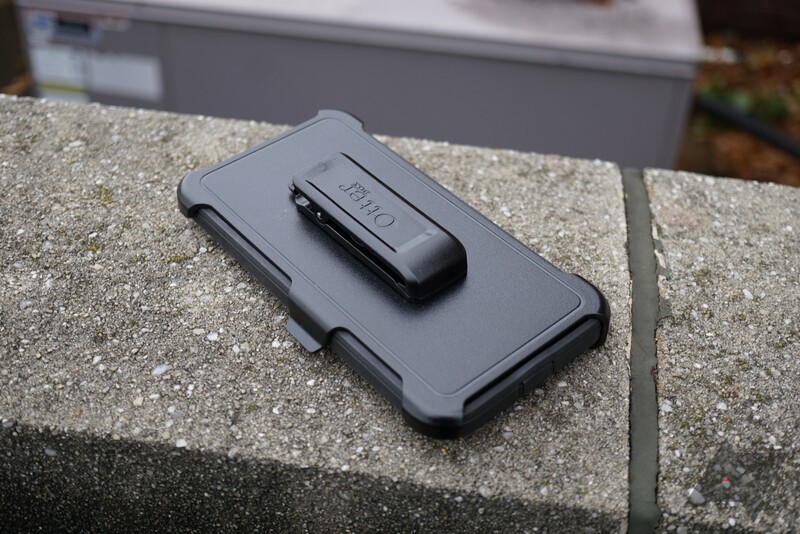 The Evo Check is a good, albeit pricey, case, even if it's not to my tastes. Design It's thin for the amount of protection it offers, and the check pattern is interesting. Protection The phone is surrounded by a very thick TPU layer, and the lip is extremely large to help with face-down drops. The Evo Check looks like a normal case for the most part, but you'll notice that something's off as soon as you pick it up (with the phone in it, of course) the sheer width of the thing. My Pixel 3 XL becomes pretty cumbersome to use with the Evo Check installed, even with my fairly large hands. Of course, this is all in the name of protection; the thick TPU around the perimeter of the phone no doubt absorbs a ton of impact when it hits the ground. I'm also impressed with the lip, which is pretty tall and a lot thicker than most cases'. It clears a glass screen protector with ease. The back has an interesting check pattern (hence the name "Evo Check"). It's translucent, but it has a very dark tint over it. It's also quite thin, which is one of the Evo Check's selling points. The bottom has some subtle tech21 branding that isn't really visible unless you're looking for it. The fingerprint sensor cutout is nice and large, and the buttons are very tactile. Recommendation Don't buy it unless you're constantly dropping your phone. 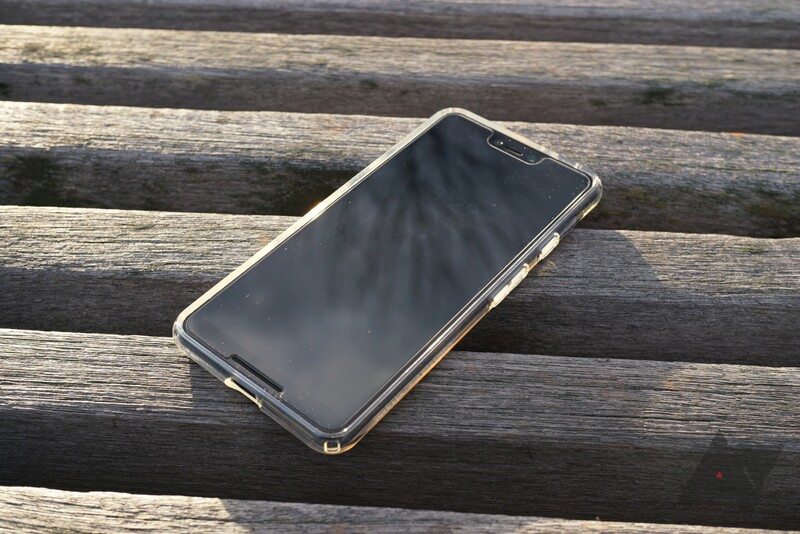 Design It's definitely thin — if you were to hand your phone to a friend, he/she probably wouldn't even notice there's a case on it. Fragility It's easy to botch the installation and permanently scar the case. Price $29 (plus shipping) is twice as much as the MNML. Protection (for real) It'll do its job against scratches, but good luck if you actually drop it. 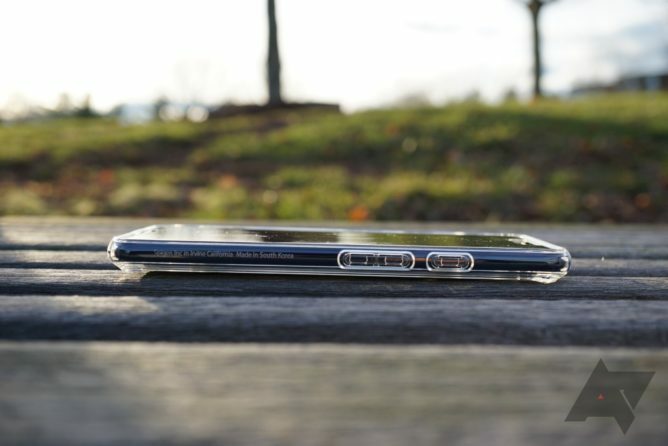 It's hard for these ultra-thin cases to differentiate themselves. In fact, basically the only area in which they can stand out is protection around the camera and fingerprint sensor. 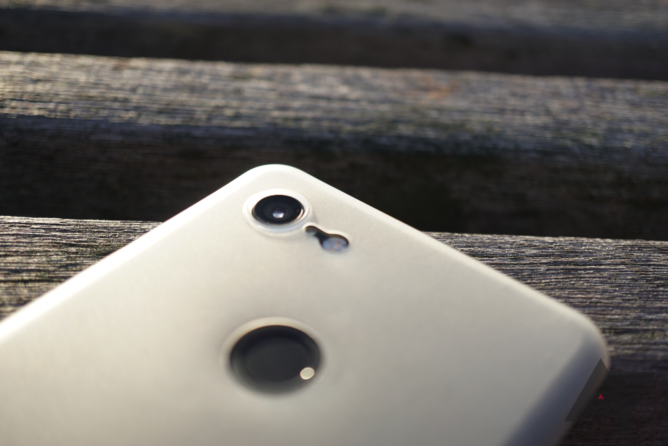 While the MNML and Peel do have a hump around the camera, they leave the fingerprint sensor exposed. Totallee has taken a better approach, putting humps over both the camera and fingerprint sensor for maximum protection. Granted, that isn't saying all that much given how thin these cases are, but the Totallee's design is definitely better than its competitors'. There isn't much to say about the rest of the case. Once installed, the phone truly looks and feels about the same as it does without the case, just with some added protection against scratches. The cutouts are decent enough, and the volume button cutouts work just fine. Just like the MNML and Peel, it can be difficult to install and remove, but that's the nature of such a tight-fitting case. Make sure that you don't crease the case while installing it, though, as that'll leave a mark that'll be there forever — see the image above. 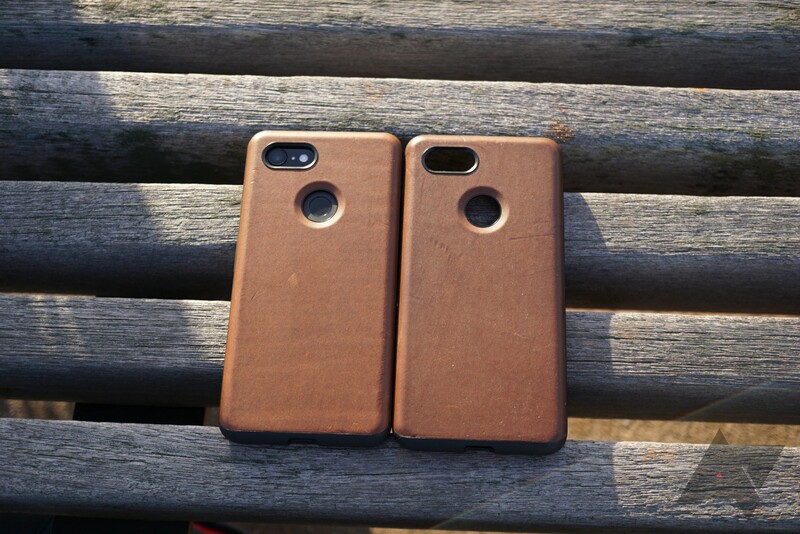 The Totallee ultra-thin case is the best I've used, but at $29, it costs twice as much as the nearly-identical MNML. 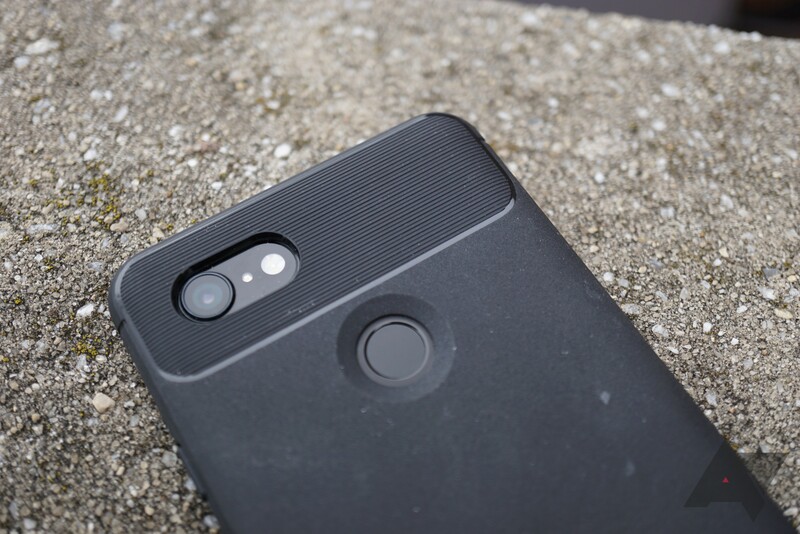 To me, an added hump around the fingerprint sensor isn't worth another $14, but that's up to you to decide. If money were no object, I'd go with the Totallee, but my recommendation for an ultra-thin Pixel 3 case stays with the MNML because of how much cheaper it is. 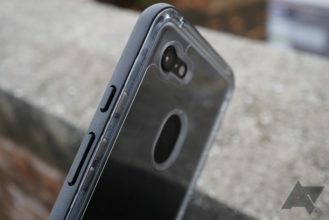 Color options include Solid Black and Frosted Clear; a soft clear case is also listed, but that's an entirely different case using different material. Recommendation: Buy the MNML instead — it's half as expensive with one minor drawback. To be perfectly honest, I've never been a fan of Urban Armour Gear's case designs. The rugged aesthetic on the Monarch is a bit overdone, especially considering the fake screws. Plus, at $60, it's hilariously overpriced. Design I can see how it might appeal to some. Protection The corners have oversized bumpers, and the case has MIL-STD 810G certification. Feel The case just isn't very comfortable in the hand. Fingerprint sensor The cutout is way too small and makes unlocking the phone annoying. Price $60 is a laughable price for this thing. Let's talk about the design. The skeleton look with the fake screws doesn't appeal to me, but there's clearly an audience out there that appreciates it. In the hand, it feels hard and uncomfortable. I'm sure that this is all done in the name of protection, but it basically makes the phone feel like a power tool. 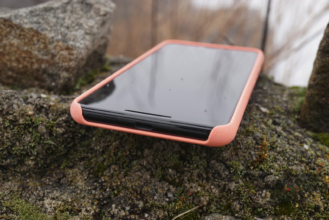 Speaking of protection, that's the one area in which the case excels — the corners have giant bumpers for shock absorption, and the lip is nicely sized. 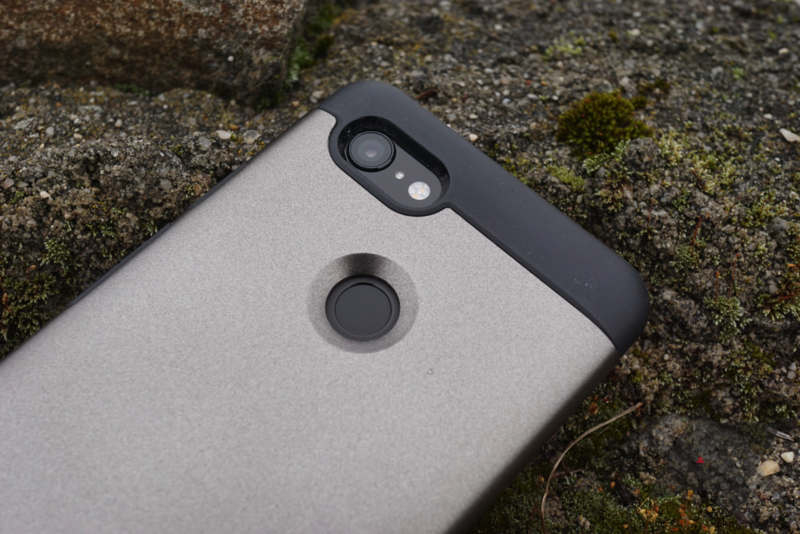 Another main problem with this case is the fingerprint sensor cutout. The area around the sensor is actually pretty deep, and the cutout is very small. That makes the sensor pretty uncomfortable to use. The charging port cutout is fine, though, and the buttons are actually very tactile. 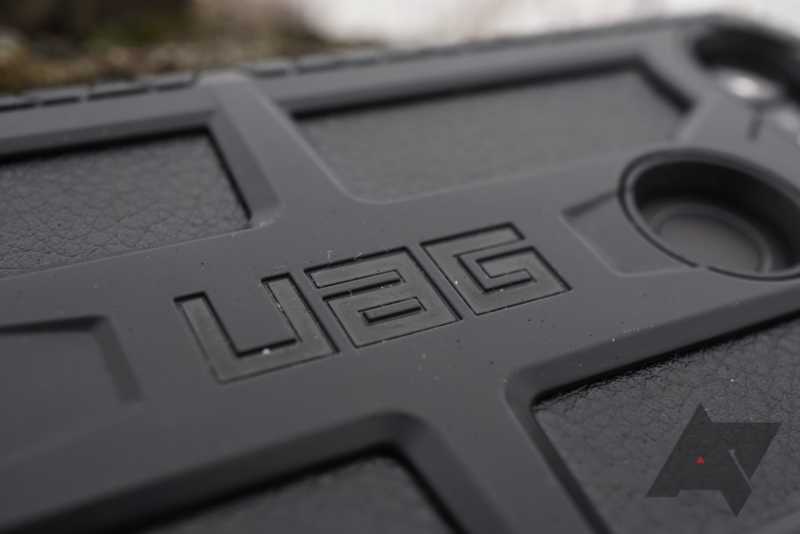 The last, and arguably most prominent, issue with the UAG Monarch is the price. $59.95 is absolutely insane for a pretty standard case like this, and it doesn't appear to be discounted anywhere. Hell, I'd have trouble convincing myself to pay half that, even assuming I liked the design. The Monarch is a mediocre case priced way too high, and you shouldn't buy one. It comes in black and red. 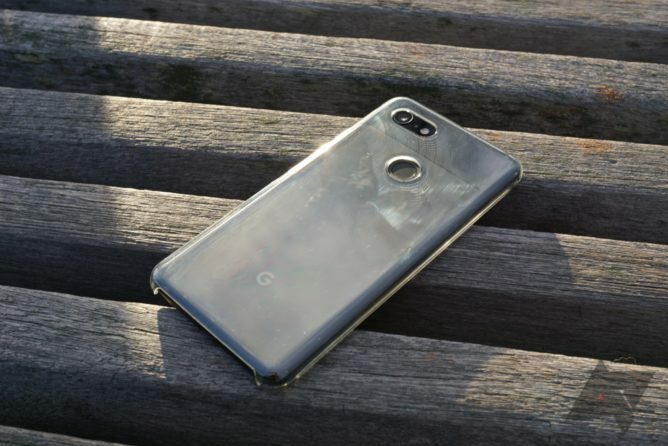 There's no shortage of clear cases for the Pixel 3 on the market, so VRS Design decided to differentiate the Crystal Chrome by... putting a reflective silver strip around the perimeter of the back. It's certainly an odd way to stand out, but if you did like the look, it's unfortunate that the case isn't particularly good. Design The chrome strip is unique at the very least, and the buttons are nice. Price It's pretty cheap at $11.99. 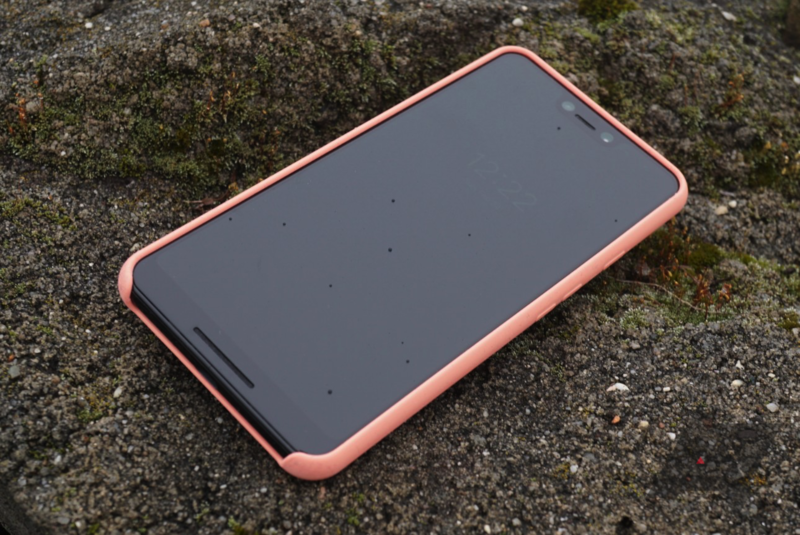 Design (again) There's barely any lip for the screen, and the fingerprint sensor cutout is too small. 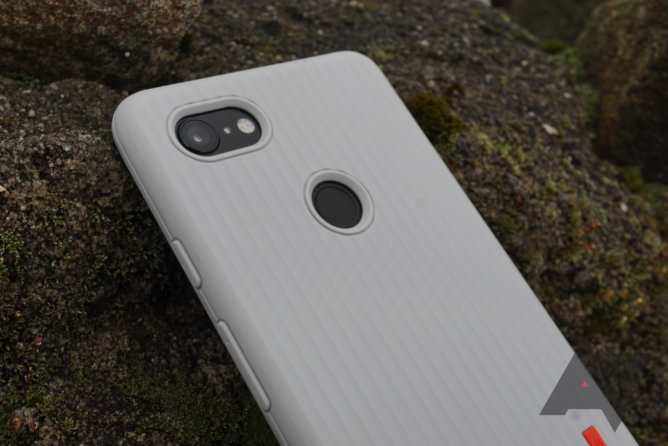 Material The ridged TPU on the sides feels pretty cheap, and the hard plastic back is a fingerprint magnet. The first thing you'll notice about this case is obviously the shiny chrome strip around the back. It's not my cup of tea, but I can see how it might appeal to some. Continuing with the strange design choices on the back, there are two little cutouts near the bottom of the hard plastic back, and I'm not sure what they're there for. Like most clear cases, the back attracts fingerprints like mad, so you'll need to have a microfiber with you pretty often. 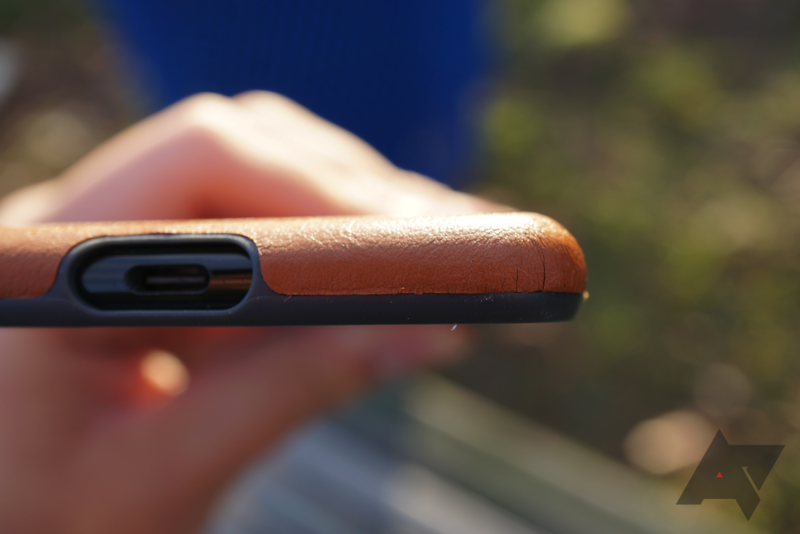 The ridged sides improve grip, but the material used makes the case feel rather cheap. Protection-wise, the Crystal Chrome sends mixed messages. The protruding bumpers on all four corners are nice, but the lip sits basically flush with a glass screen protector. It seems illogical to go to the trouble of putting the bumpers on and leaving the screen so vulnerable; I'm not sure why this decision was made. The buttons are sublime — they're easy to press and produce satisfying clicks — but the same can't be said of the fingerprint sensor cutout. It's barely larger than the sensor itself, meaning that it's not very comfortable to use and makes swiping almost impossible. VRS's Crystal Chrome does some things well, but it also makes many puzzling decisions. 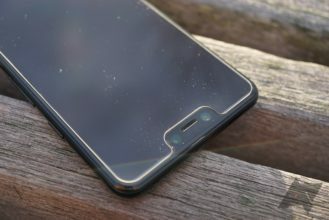 Ultimately, I can't recommend it due to the lack of a real lip over the screen and the tiny fingerprint sensor cutout. Nonetheless, if you are interested, it's available on Amazon in clear/clear and black/clear configurations for $11.99 a pop. Recommendation: Don't buy it; there are better clear cases out there. After my poor experience with the Crystal Chrome, I was hoping for something better with the Single Fit Label. If nothing else, this case looks unique; you don't really see those vertical strakes on any other cases. Unfortunately, it suffers many of the same pitfalls as the Crystal Chrome, and you should probably look elsewhere. Design It's not derivative of anything. Price $10.99 is pretty inexpensive. Material It feels cheap, and it's prone to getting dirty. Protection The lip is far too small, and the phone feels like it's hulking out of the case. As soon as I put the Single Fit Label on my phone, I could tell I wasn't going to like it. 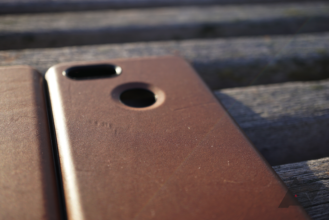 First of all, the case's material is rather hard and cheap-feeling. I get that this may be to reduce fingerprint attraction, but it's just not comfortable in the hand. In addition, the case doesn't seem to fit super well on my phone; it almost feels like it's too small and it's barely hanging on. This could just be an effect of the very small lip, which, disappointingly, doesn't clear a glass screen protector. The rest of the case is mediocre at best. The buttons are average; they're a bit hard to push for my liking. The fingerprint sensor cutout is a bit too small, making swipes a bit difficult. Additionally, the little red tag-type thing can actually be popped out from the interior of the case, which means that it could be prone to getting lost down the line. Lastly, there are numerous reviews that state the case gets dirty pretty easily, which doesn't help the already-large list of issues. You can probably tell by now that I can't recommend the Single Fit Label. The interesting design is about the only thing it has going for it, and I'm not really a huge fan of it in the first place. The case is available via Amazon for $10.99, and it comes in black and grey. Ever since phones with curved-edge screens came onto the scene, Whitestone Dome has become something of a household name for glass screen protectors. 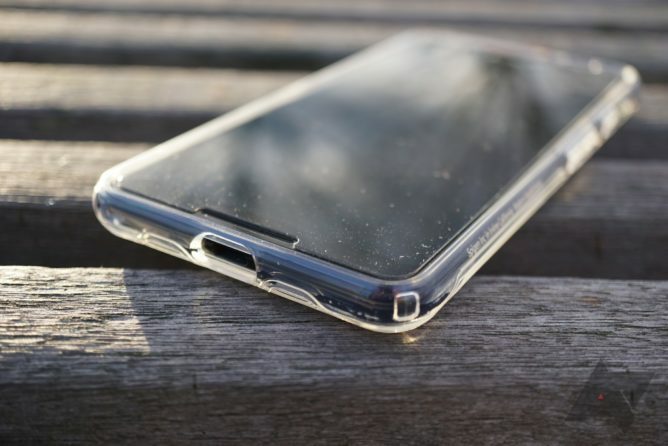 What makes these screen protectors special is the UV-activated liquid adhesive, which usually proves very effective. Unfortunately, I can't say that I'm impressed with the Pixel 3 variant, as it presented many issues that a standard screen protector avoids. Fitment The glass actually covers the entire screen. Coating The oleophobic coating stayed smooth through nearly three months of use. Problems Your mileage may vary, but I installed three of these, and I was left with giant air gaps on the left and right sides of the screen every time. Plus, adhesive gets into the gaps. Installation Whitestone Dome has made the already-complex process even more tedious for this iteration. Removal Shards of glass and nasty smells from the adhesive get everywhere when you take it off. Price $50 for one screen protector isn't great. As mentioned already, Whitestone Dome's claim to fame is the liquid adhesive. The downside to this, of course, is the lengthy and complicated installation process. The kit comes with a ton of stuff, even including a microUSB-powered UV light to cure the adhesive. 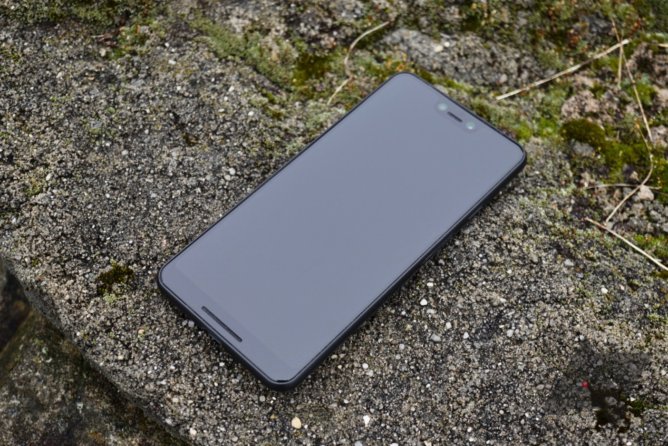 For the Pixel 3 version, the process has gotten even more tedious and difficult to follow. I've installed three of these, following the instructions every time, and all of them ended with air gaps appearing on the entire lengths of the left and right sides. These gaps only appeared a few hours after the installation is said and done, and they continued to get worse over time. 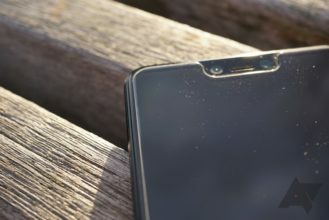 The only thing I can think of that I might be doing wrong is pushing some adhesive out to get rid of the bubbles that naturally appear when first laying the glass on the phone, but I'd be left with a ton of bubbles if I didn't do that. This doesn't seem to be a problem for other customers, but I had to mention it. I should also note that the adhesive will inevitably get stuck in the crevices and becomes impossible to remove. left: What it looked like when first installed. right: What it looked like a few hours later. Assuming you do get the glass installed without any air gaps, it's pretty nice once installed. The glass actually extends past where the screen ends, so there are no awkward edges. The oleophobic coating should also be praised — I immediately noticed a reduction in finger-fluidity after taking the screen protector off. Speaking of removing the screen protector: that's not a fun experience. I typically use a credit card to slice through the adhesive since it's difficult to pull off with fingernails alone, but even then, glass shards fly everywhere and the adhesive fumes permeate into the atmosphere. Luckily, the unpleasant smell goes away quickly. When installed properly, the Whitestone Dome Glass is a good screen protector. However, the installation process is so tedious and so prone to errors that it's just not worth it. Plus, the removal gets glass shards everywhere. The price of $50 isn't completely astronomical given how much competing offerings cost, but I'd much rather save the headache (and $5) and get a ZAGG InvisibleShield Glass+ VisionGuard instead. 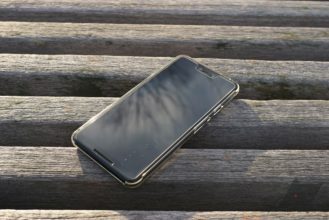 Recommendation: Buy the ZAGG offering instead. 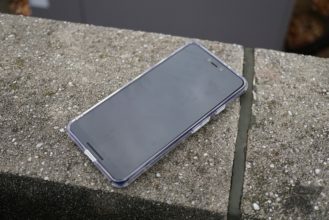 Last year's ZAGG InvisibleShield glass screen protector for the Pixel 2 / Pixel 2 XL left a sour taste in my mouth. Because the protector only had adhesive on the edges, it caused tremendous touch latency and was just a PITA to use. I'm glad to be able to say that the Pixel 3 / 3 XL version is much better, now that it has adhesive on the entire screen. Design It actually has adhesive on the entire backing now, so there are no latency issues. Coating The glass is very slippery and does a decent job at repelling fingerprints. Lifetime warranty ZAGG will replace your screen protector if you damage it, though you will have to pay shipping. Halo effect It's not a guarantee, but some I've installed have had it in some areas. 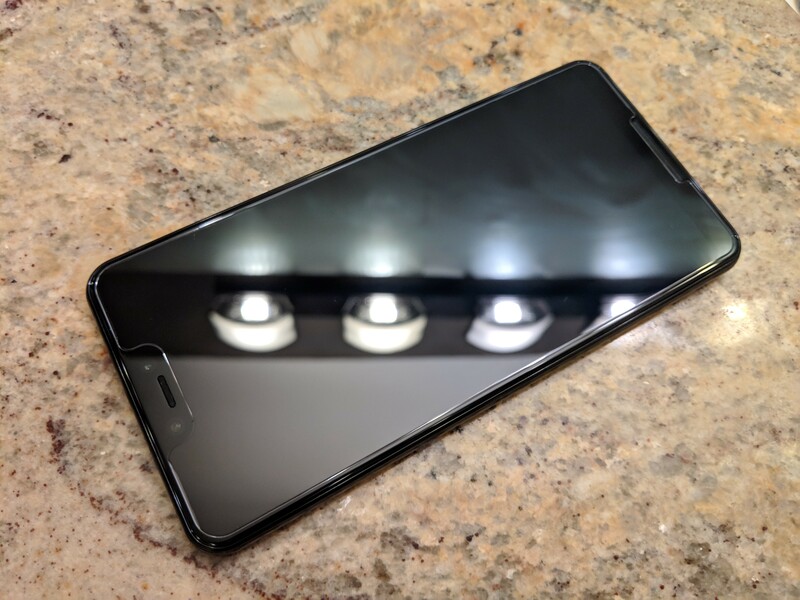 Whereas some screen protectors like the Whitestone Dome have extraordinarily complex installation procedures, installing the InvisibleShield was about as easy as any other screen protector. After I cleaned the screen and picked up all the remaining debris with a sticker, I simply popped on the included plastic guide that goes around the phone and put the screen protector on. Unfortunately, putting all of my trust into the plastic guide was a mistake, as it actually has quite a bit of slack for whatever reason. I didn't ding ZAGG for it in the pros/cons list because it didn't have to include it, but just take caution when using it. The screen protector barely covers the entire screen on the sides, but that's inevitable given the curved edges. Plus, a wider screen protector could interfere with cases. I've actually installed three of these things so far. 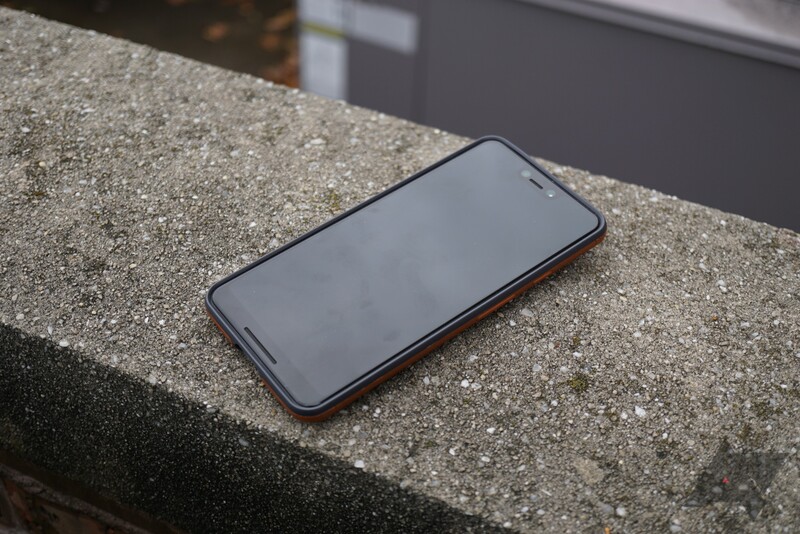 The first one I installed had a short life; after just a couple of days, I dropped the phone face-down onto a sidewalk and the protector developed some hairline cracks. The second one went onto a friend's phone, though that one developed a hairline crack after a drop as well. The third is on my phone yet again, and the only real issue I have with it is the halo effect showing up on the top edges. I want to note that this didn't happen with every installation; I'm not sure what I did differently here that caused the halo to show up on this particular one. Nonetheless, it's pretty minor and doesn't really bother me. At $45 a pop, these screen protectors aren't cheap, but I'm hesitant to deal with anything under that. I tried a cheap $15 glass protector from Amazon, and as expected, it only had adhesive on the edges and was absolute crap. 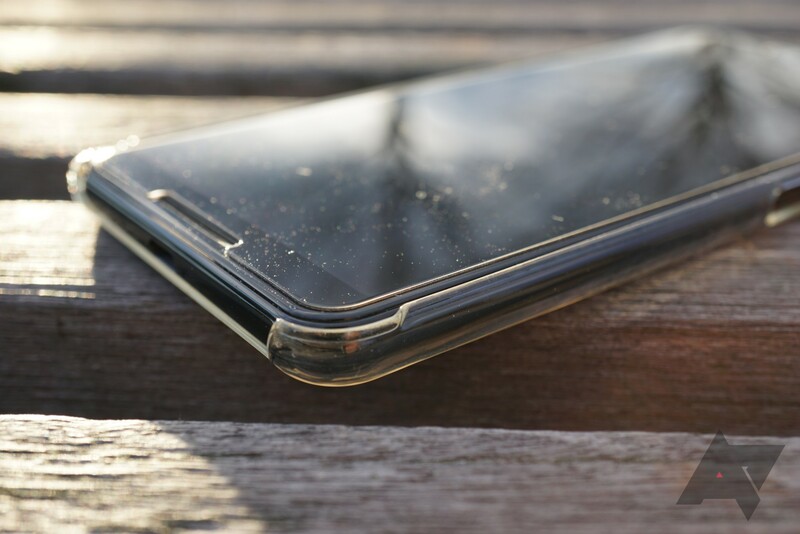 If you have any recommendations for cheaper screen protectors you've had a good experience with, let us know. Recommendation: Buy it; it's expensive, but it works well. That's it for now. We'll be updating this every couple of weeks, so stay tuned for more reviews. In the meantime, let us know if there are any accessories in particular you'd like to see here.